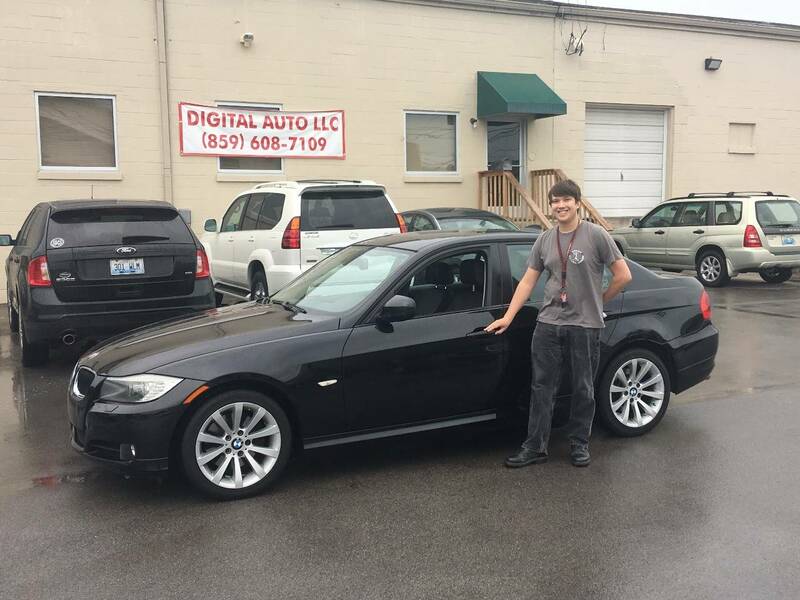 I got this sweet 2011 BMW 335D from Digital Auto and everyone made me feel welcome. A very laid back no hassle atmosphere with great people. AWESOME FUN AND EXCITING AND VERY AWESOME PRICE. SUCH A RELAXED ENVIRONMENT, NO PRESSURE NO LONG WAIT AND GOOD MUSIC. THANK YOU BRANDON, SARAH, MIKE! ESPECIALLY BRANDON FOR THE GREAT PHOTOS! AWESOME JOB GUYS THANK YOU. CALLED DIGITAL AUTO AND SET UP MY APPOINTMENT! UPON ARRIVAL EVERYTHING WAS JUST AS PLANNED AND A VERY GOOD COMPANY WITH VER AWESOME PRICING!!! 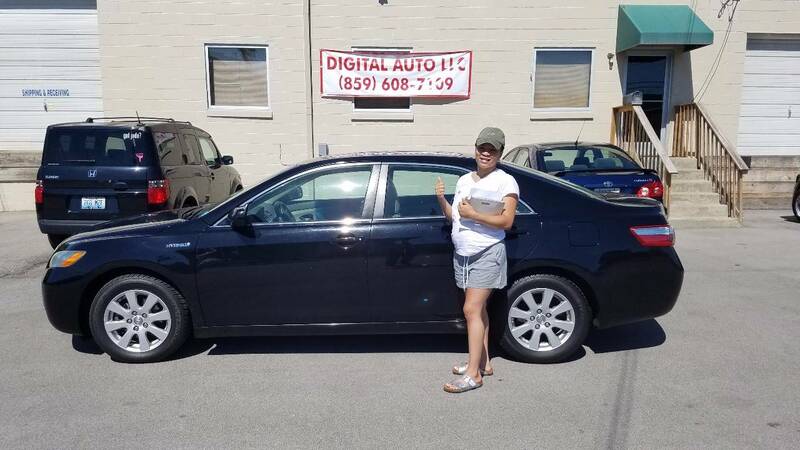 I'm so glad we found this deal at Digital Auto. 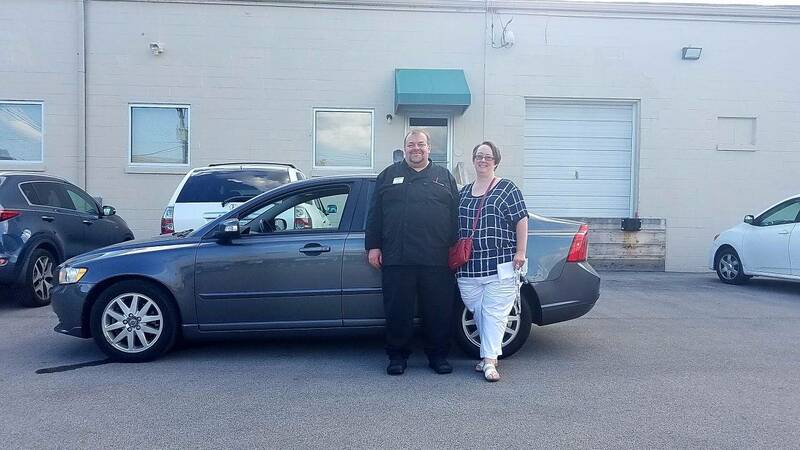 We really enjoyed our experience here and Jimmie was a great salesman to deal with. 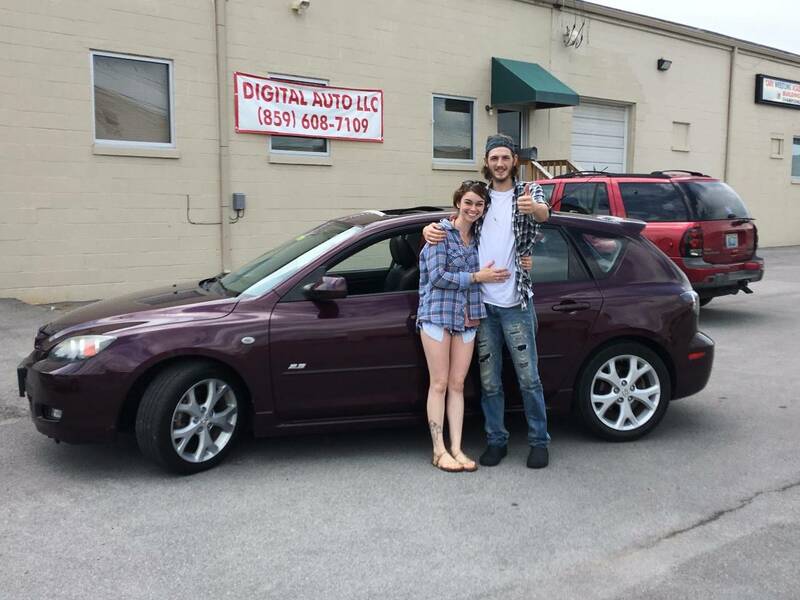 THEY ARE VERY GRATE PEOPLE , I AM HAPPY FOR MY NEW CAR!!! 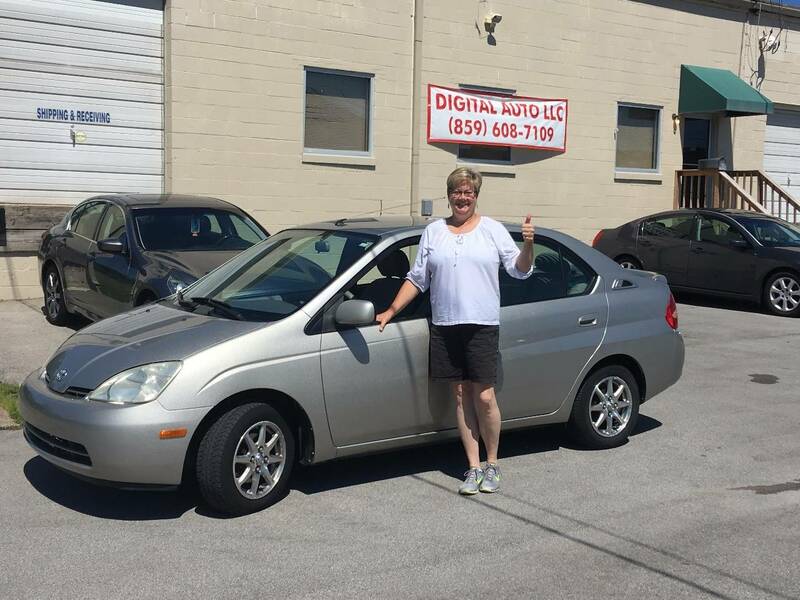 Thank you Digital Auto for everything in helping me with my purchase of my 2008 Nissan Sentra! I really like my car and everyone here is super nice. 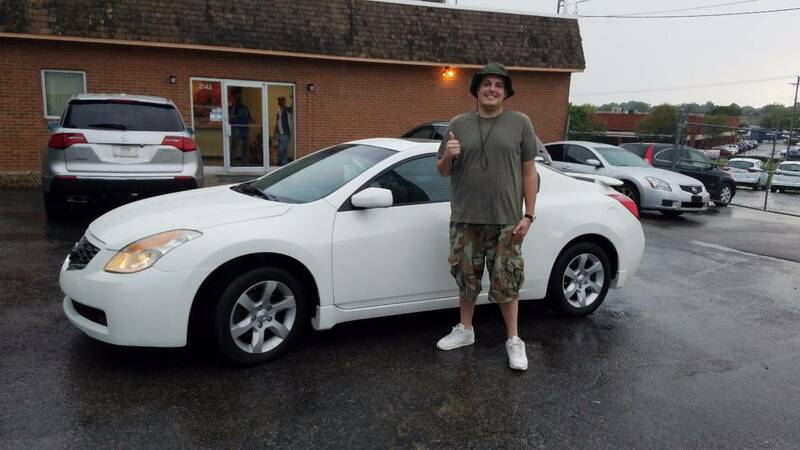 I lover my Altima and I got it at a great price. 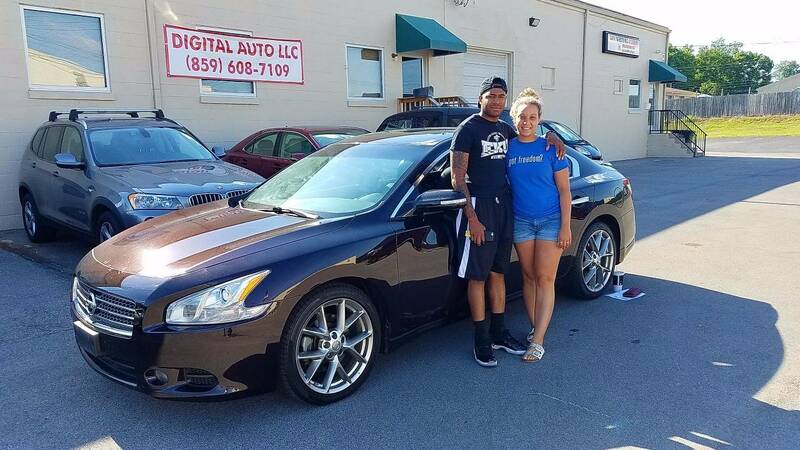 Very easy and smoothe process buying this car. Very reasonable and helpful salespeople. Willing to work with anyone. Makes the entire sales process VERY easy. 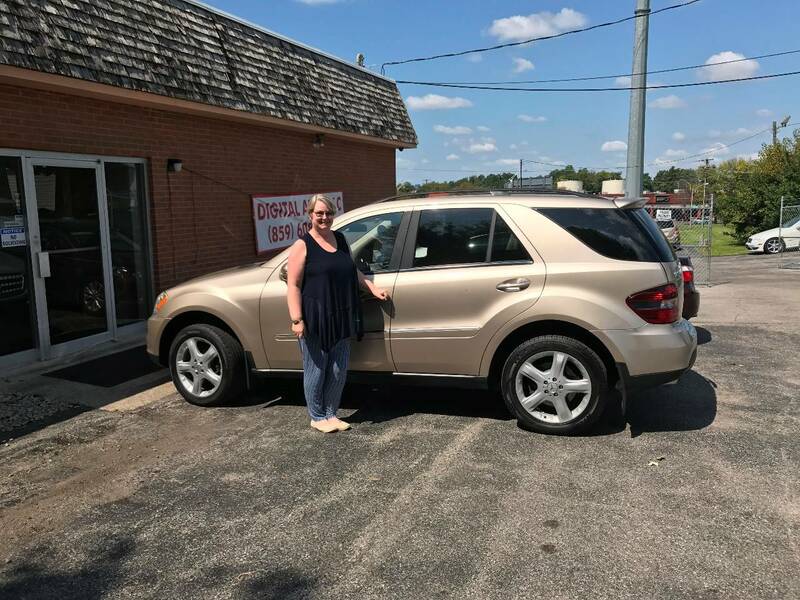 Jimmie helped me and my family and went out of his way to aid us in our buying process of a 2008 Dodge Caliber and it's perfect for us. Thank you so much for your service. 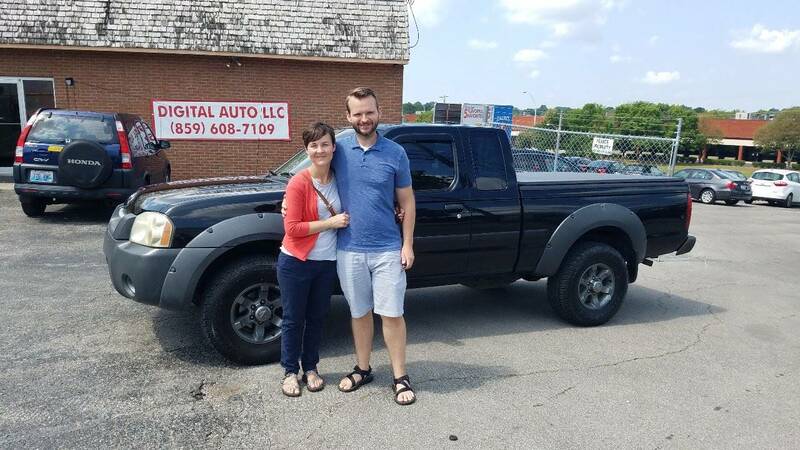 Digital Auto allowed us to get the car inspected and really take our time before making a decision to purchase the pickup-truck. We really appreciate the low-pressure way they approached us as customers. Would be happy to do business again in the future. 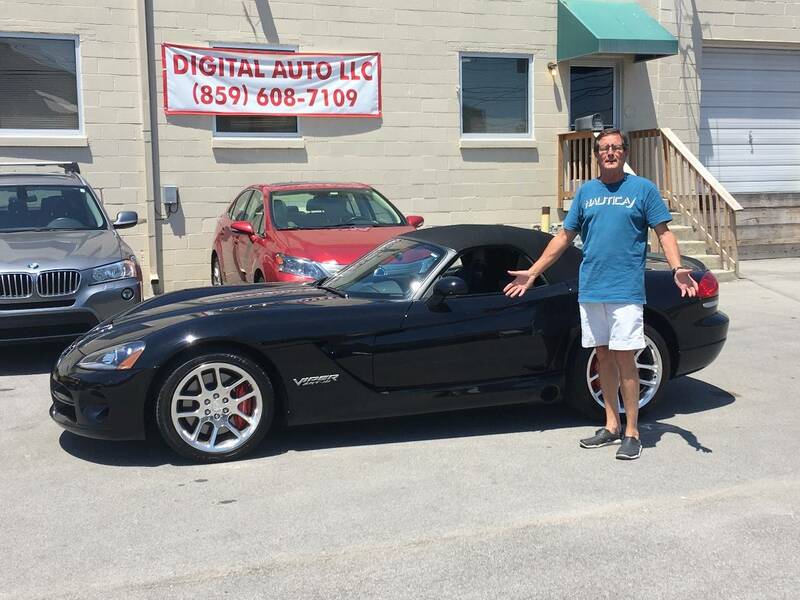 LOVE OUR CAR , JIMMIE IS A GREAT GUY HELPED US IN EVERY WAY HE CAN , GOT A GREAT DEAL , THANK YOU DIGITAL AUTO . IT WAS A HASLE FREE AND EASY PRICESS. 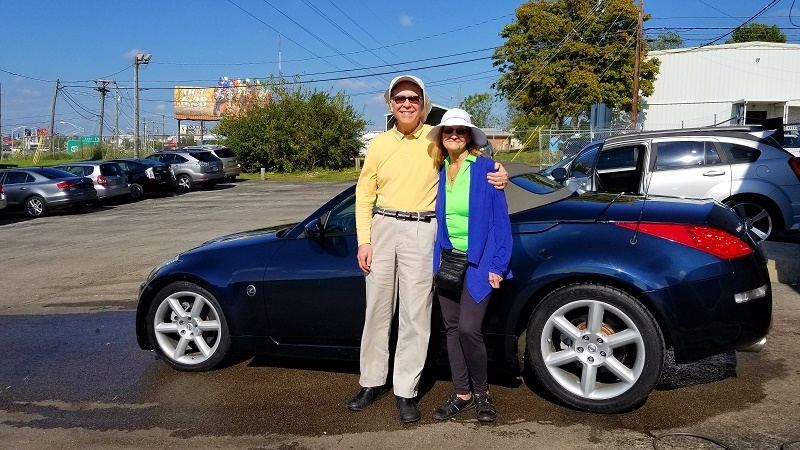 WE LOVE OUR CAR AND PLAN TO BE BACK. 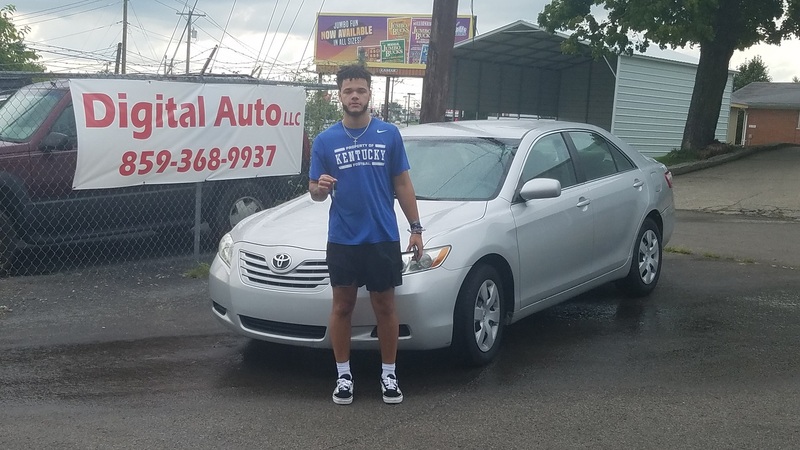 GOOD EXPERIENCE I HAD IN KY WITH THE CUSTOMER SERVICE TODAY . 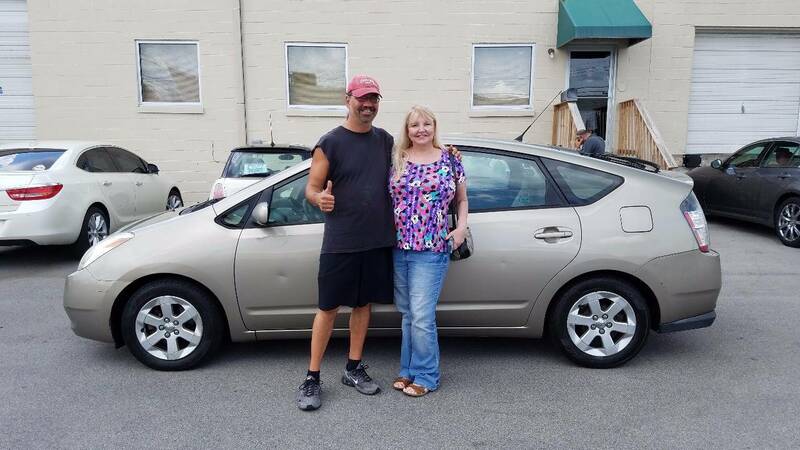 VERY NICE PEOPLE TO DEAL WHEN BUYING A CAR . 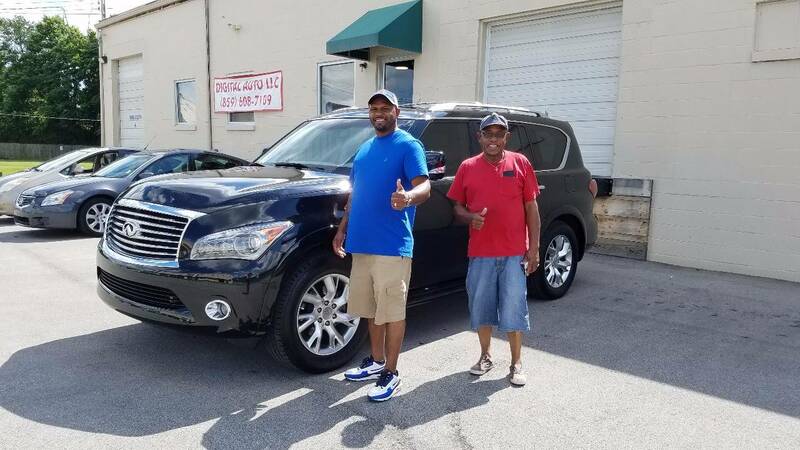 THANK YOU GUYS ALOT FOR THE HELP WITH THIS QX56 FOR MY FAMILY. These guys are great! They went out of their way to help me with my purchase of exactly the car I was looking for. 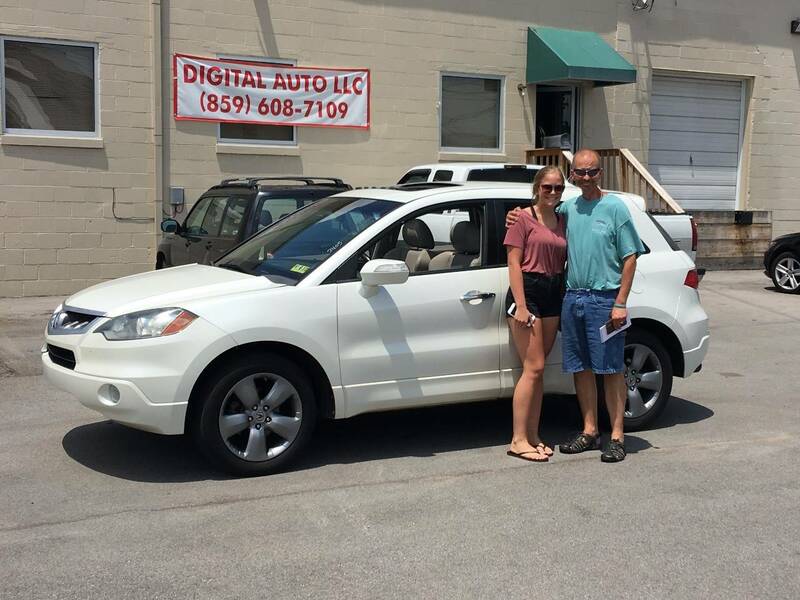 Thank you Brandon and Digital Auto! Great people to work with all around! They really went out of their way to take care of us! GOOD SERVICE. ANSWERED ALL QUESTIONS AND WAS HONEST ABOUT THE VEHICLE. WOULD RECOMMEND TO ANYONE, VERY SATISFIED WITH OUR EXPERIANCE. 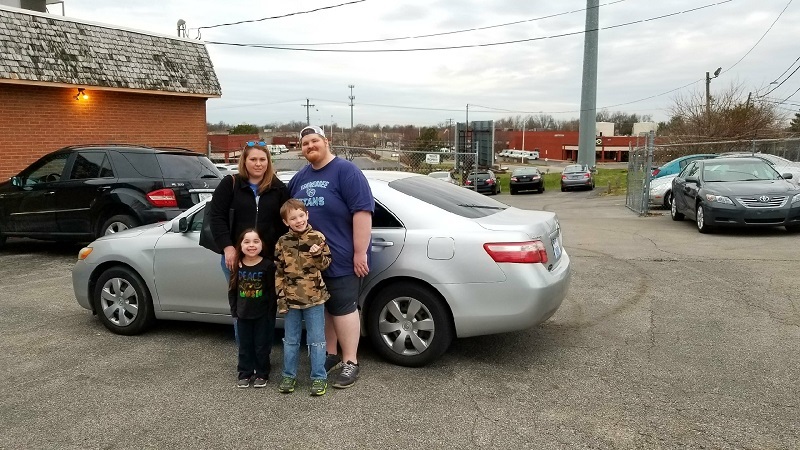 Everyone here went out of their way to help us in our purchase. 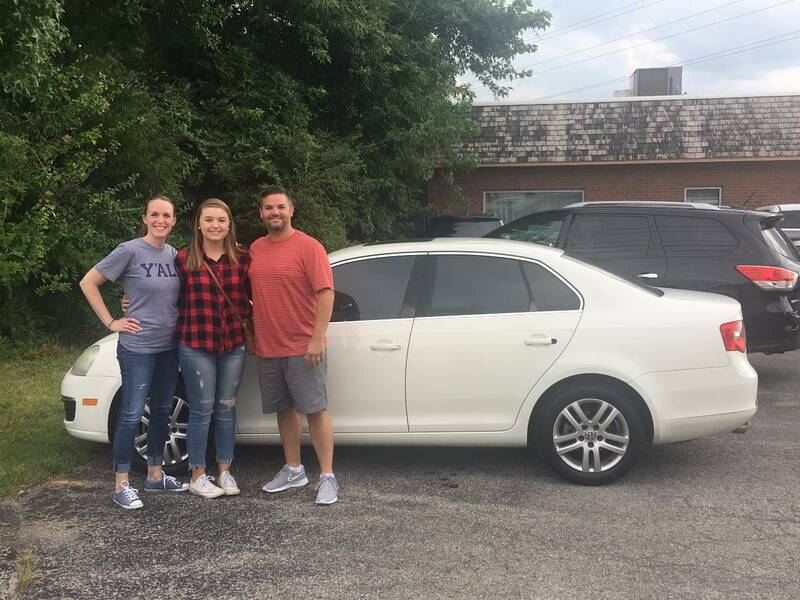 Our Daughter got a great vehicle and we really appreciate everything our sales person, Jimmie did for us. VEARY SIMPLE COME IN ASKED FOR TEST DRIVE . IN MINUTS I WAS IN THE CAR DOWING MY TEST DRIVE AND INSPICTION CAR WAS IN GREAT SHAPE . CAME BACK SAID I LIKE IT THEY DROOPED THE HUMMER . CAR SOLD . GREAT EXPERIENCE .THANK YOU JIMMIE THANK YOU SARA . LOVED ZIGGY SUCH A FRINDLY DOG . We got exactly what we came for and with a great expirence! Mike was a great and we would recommend to anyone. 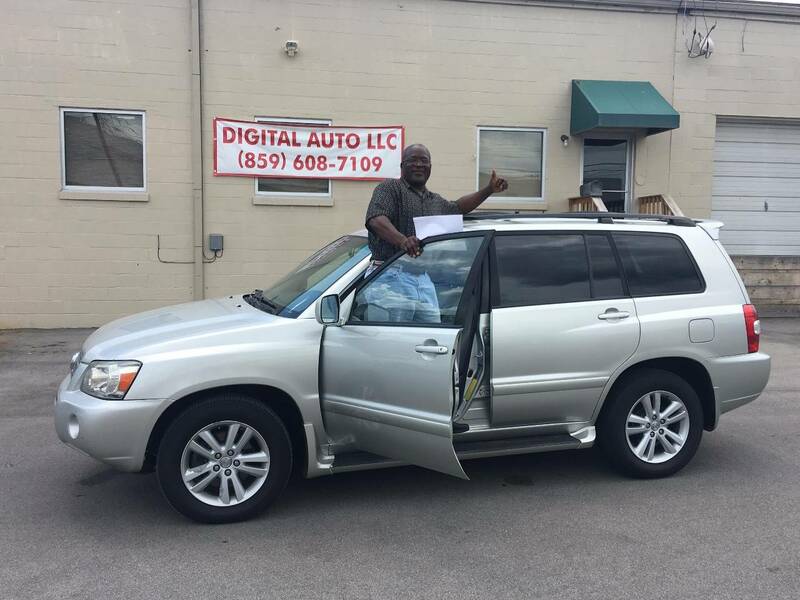 Thank you so much Mike and everyone at Digital Auto for this great deal on this 2007 Toyota Highlander. My experience here was great! Everyone here took good care of me and helped in every way. Enjoyed our experience at Digital Auto. 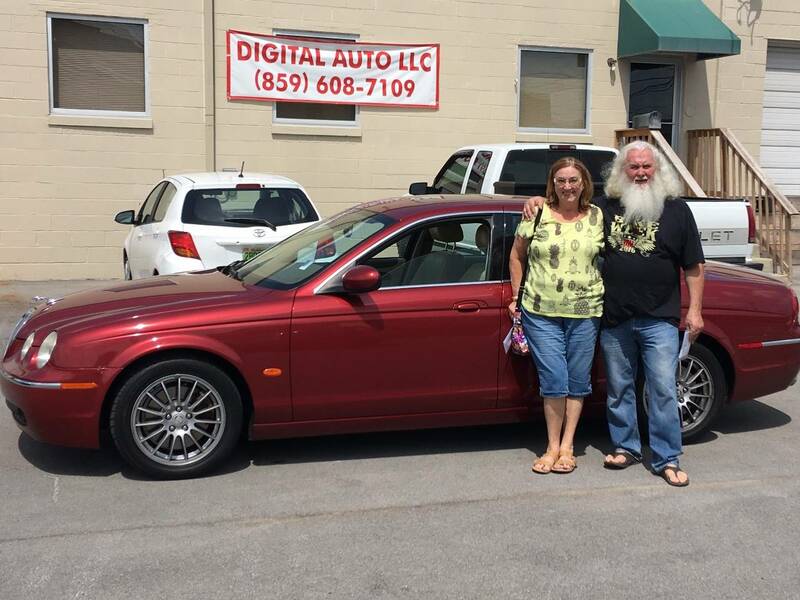 They were attentive to my needs and did a great job listening to what I really needed out of my car buying experience. Great People! Thank you Jimmy for a real positive experience. You and everyone there did a great job! 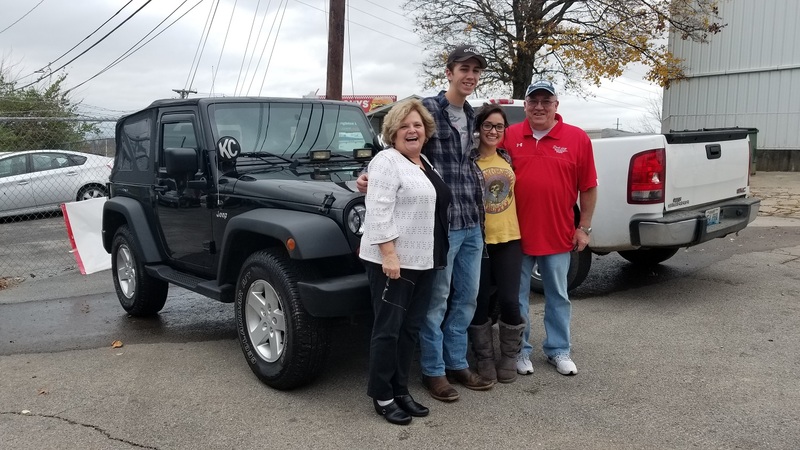 We got a great deal on this 2008 Jeep Wrangler and everyone here was so nice and professional. 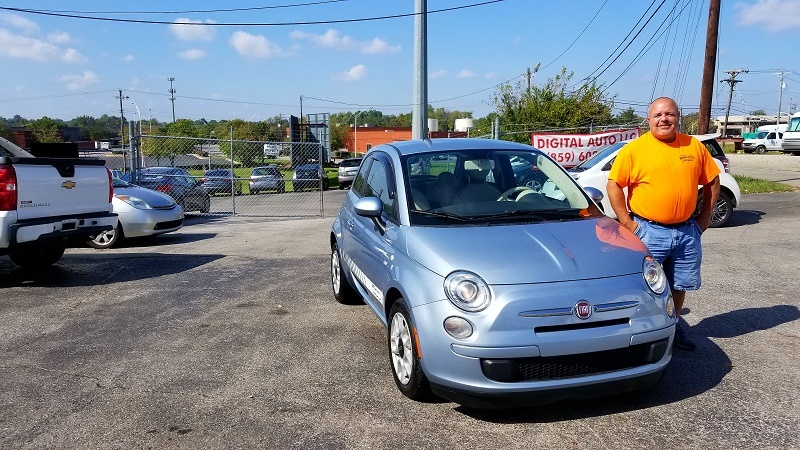 We definitely recommend Digital Auto for your next car purchase. 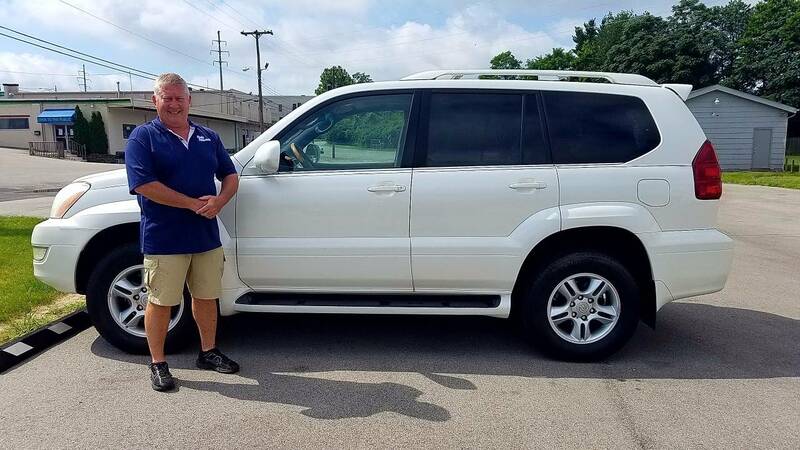 Jimmie was awesome throughout the whole process of buying my Lexus! 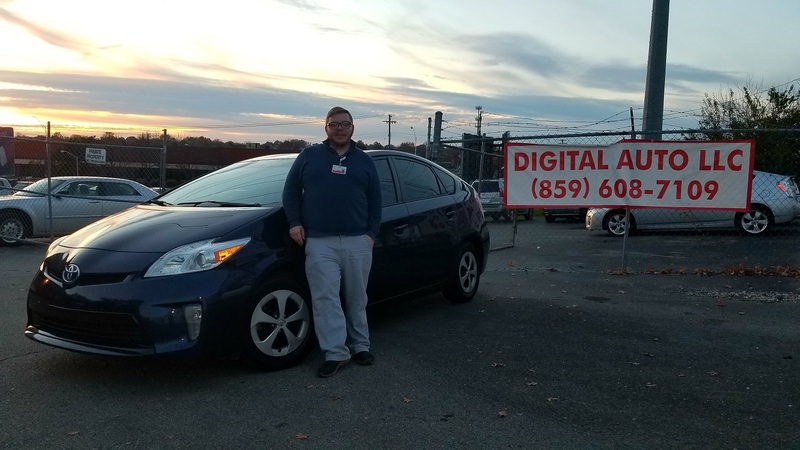 I would recommend Digital Auto to anyone needing a good used vehicle. 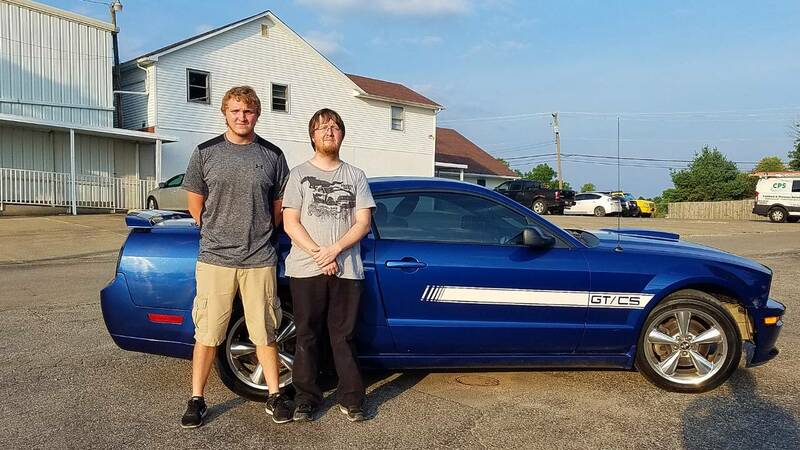 We found the car online and called about it. Everything went very smoothly. 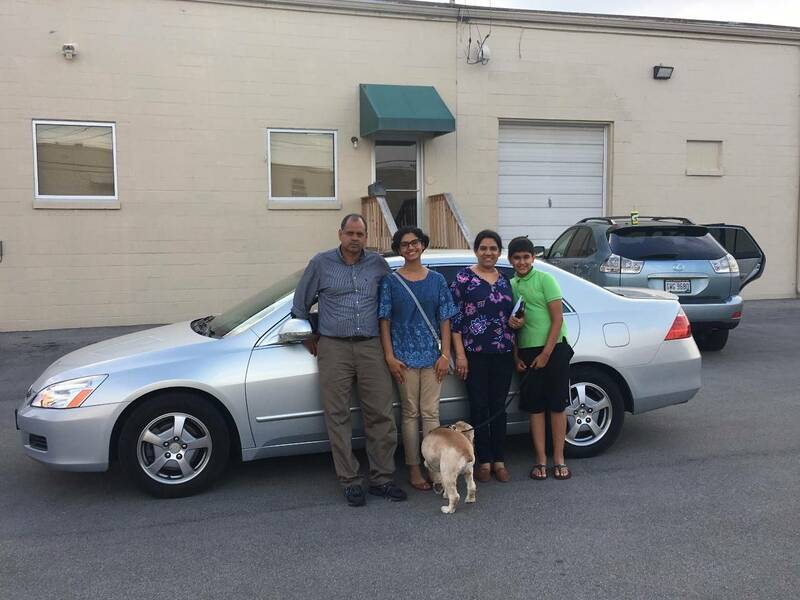 We drove to Lexington to test drive the car and everyone was very nice. They gave us to keys to take the car for a test drive and told us to take our time. We came back the next day with our son, who will be driving the car and he loved it. 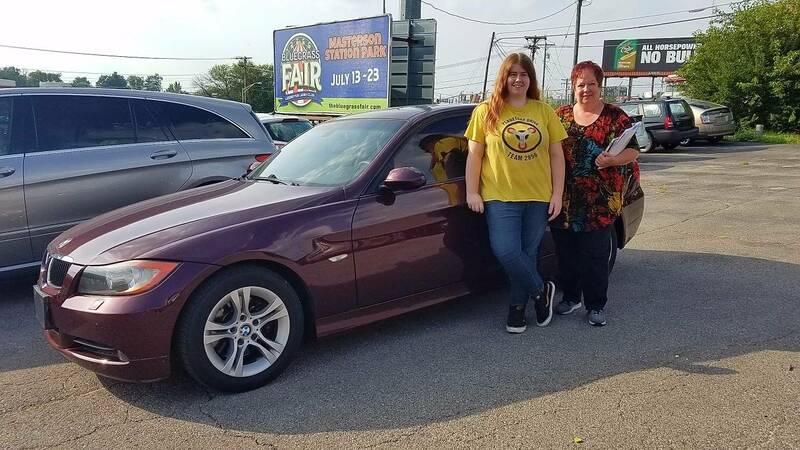 Took it for another test drive and decided to purchase the car. 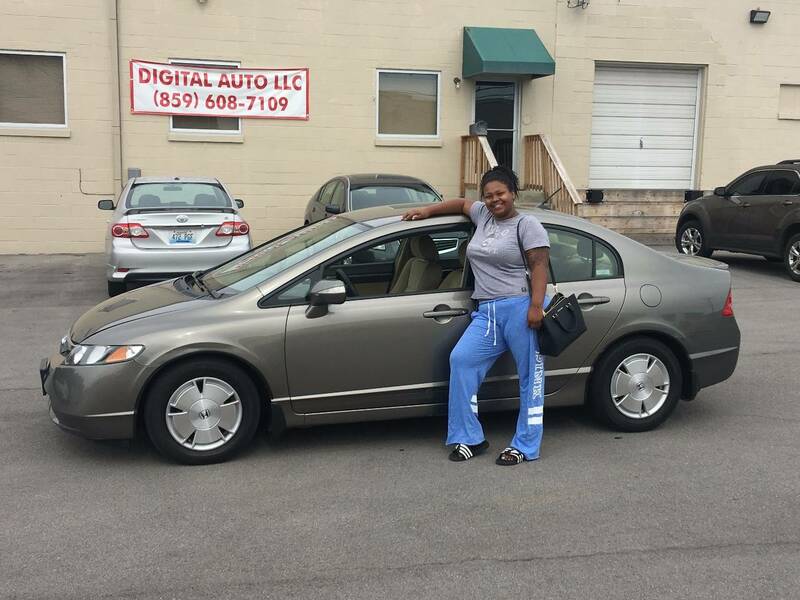 The process was very efficient and we are very satisfied with how we were treated. Mike is a very nice person to deal with. I would recommend them to anyone. 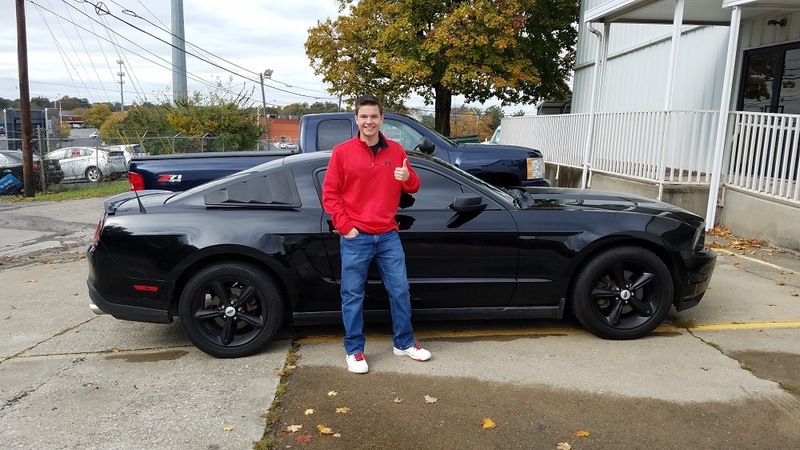 I had a lot of fun picking out a car! The people are so nice and so helped. They were hospitable and cared for what ever I needed. 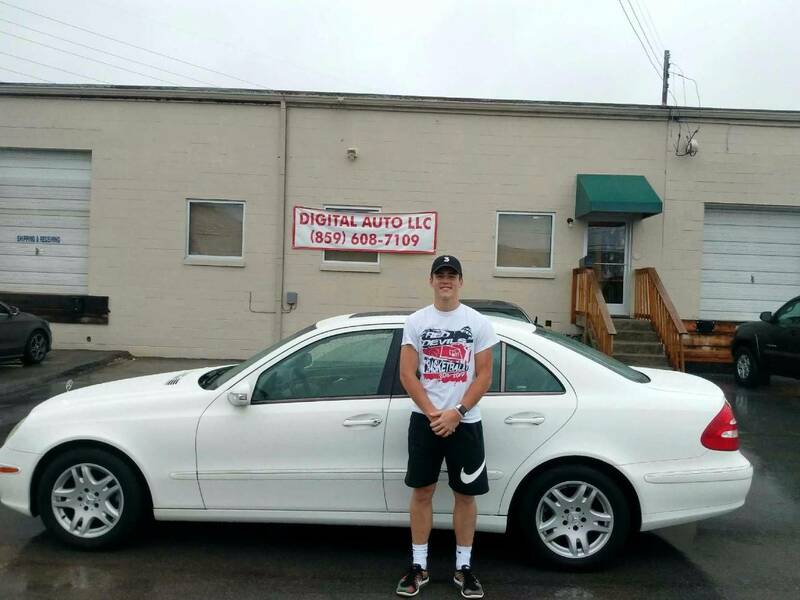 Thank you Brandon and Mike for helping me get a great car! Great experiance! No pressure on me while deciding on the car and they treated me with upmost respect. Plus the car was just as describled. I will surely do buisness with them again! 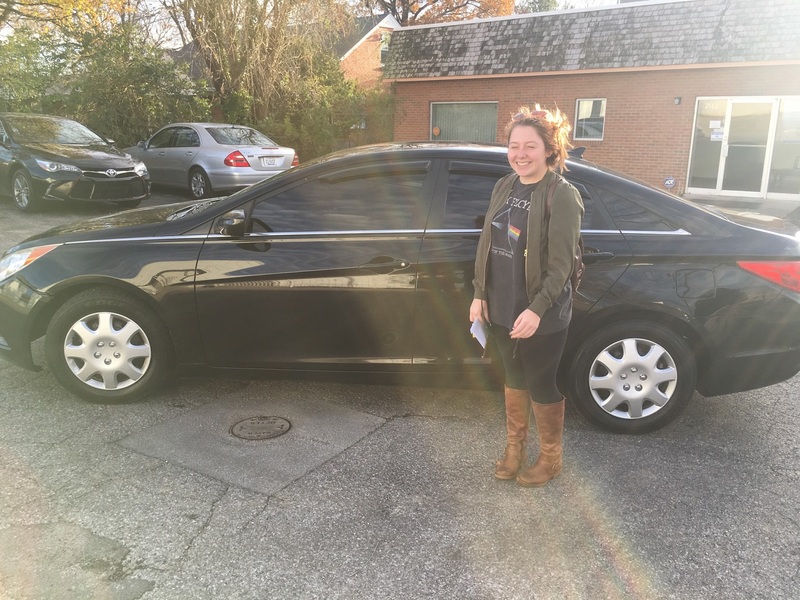 Thank you Lyndsey for a pain free purchasing process. 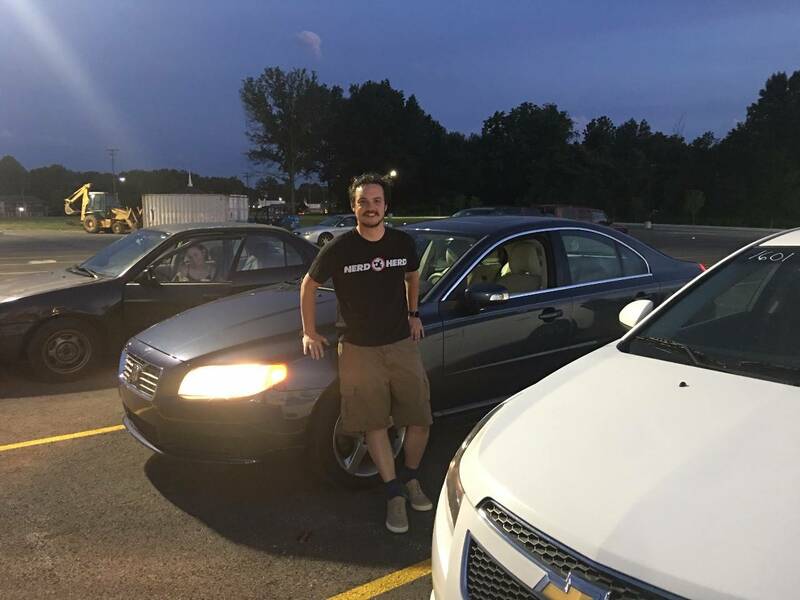 Everyone here was helpfull and I love my car. Wonderfull buying experience, great family owned business, stayed past closing time to accommodate our schedule. Will come back and highly recommend to family and friends. Worth the drive from southern Indiana. 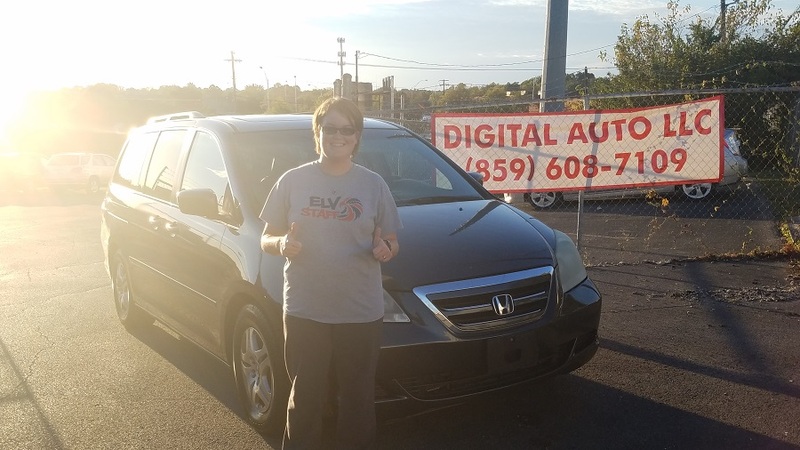 I got exactly what I came for, a great deal on this 2010 Honda Pilot. Jimmie and everyone else here was friendly and did a great job. Thank you. 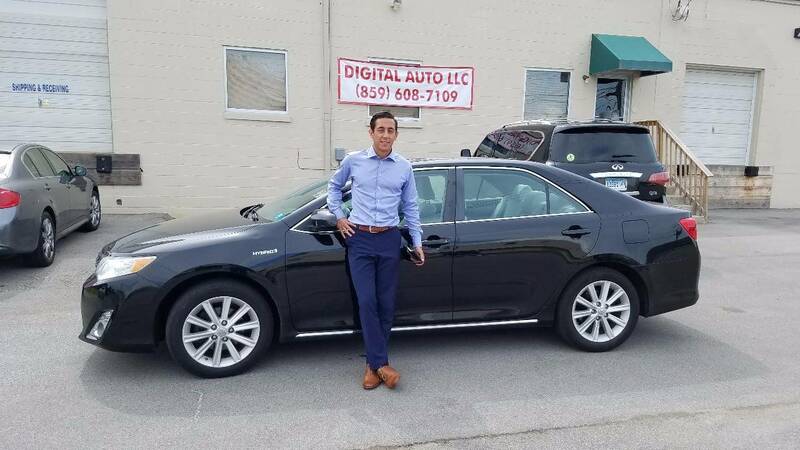 Needed a new car and came across DIGITAL AUTO, they have awesome service and unbeatable prices. 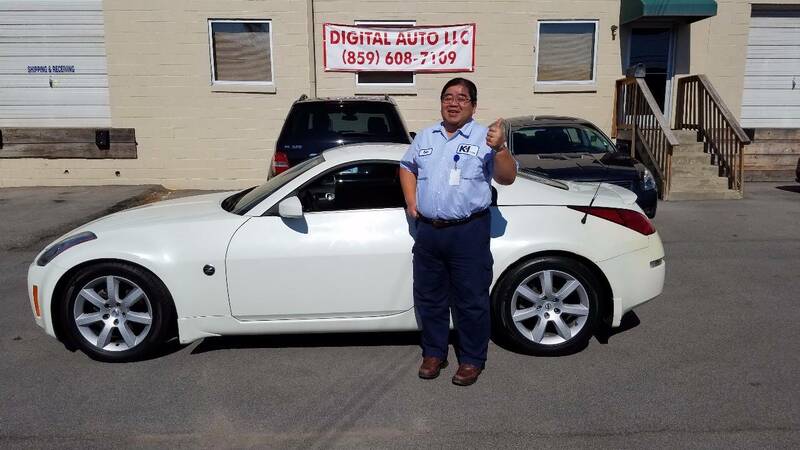 I reccommend this car shop for anyone looking to get a new vehicle. 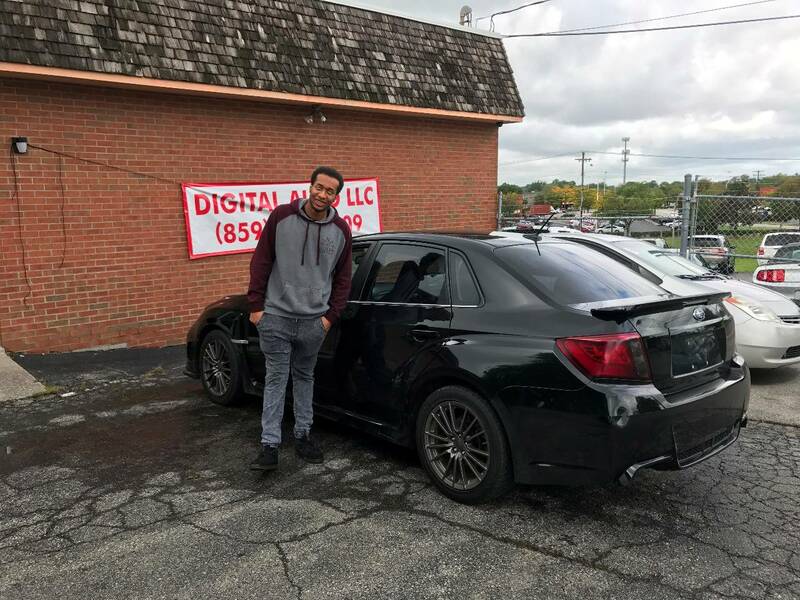 I WANT TO SAY THANK YOU TO MIKE AND COMPANY AT DIGITAL AUTO FOR MAKING MY USED CAR BUYING EXPERIENCE VERY HASSLE FREE AND HELPING TO OVERCOME SOME OBSTACLES FOR ME TO MAKE THIS PURCHASE HAPPEN. 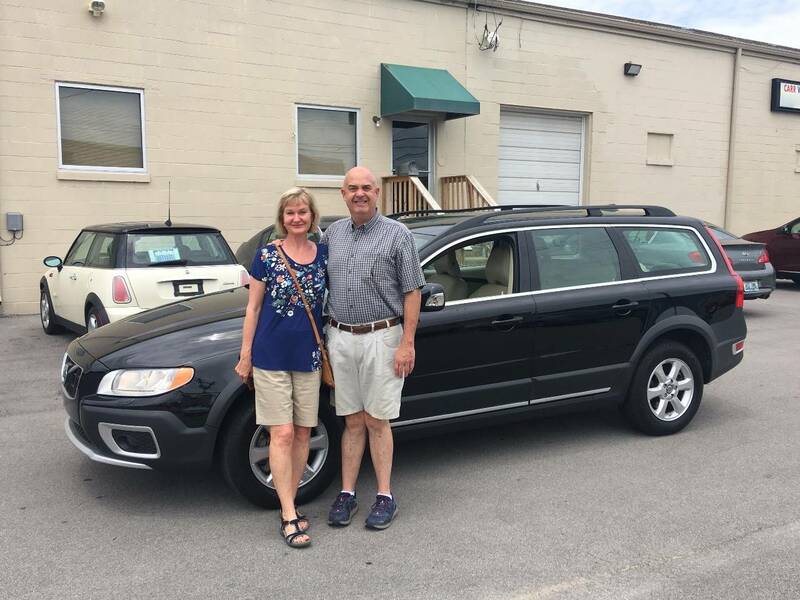 NOT ONLY DID THEY HELP ME THEY ALSO DELIVERED THE VOLVO TO ME IN LOUISVILLE DUE TO MY WORK SCHEDULE. 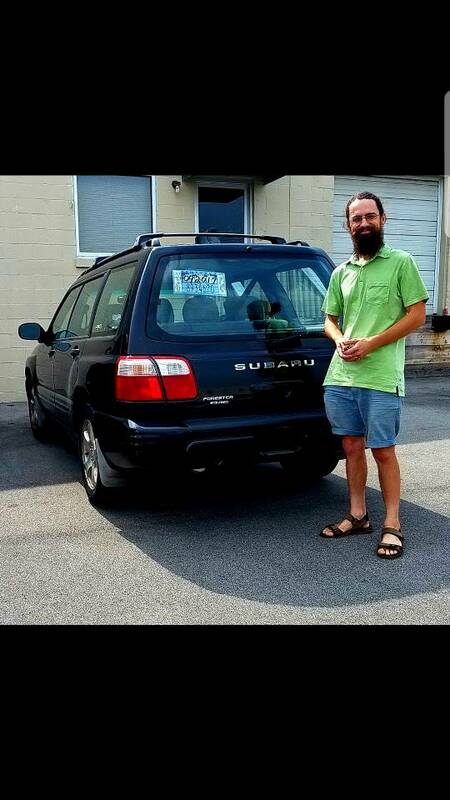 THIS TAKES CAR BUYING TO A WHOLE NEW LEVEL. 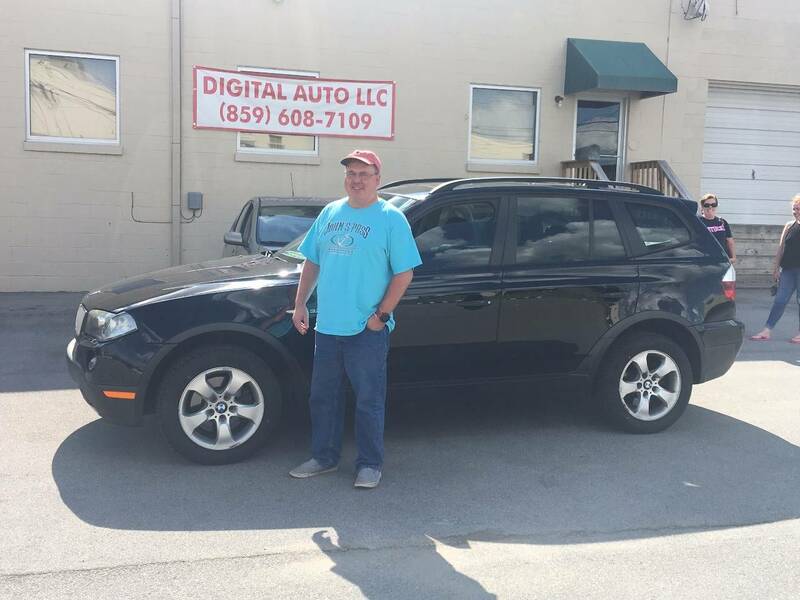 THANKS MIKE AND DIGITAL AUTO. Great guys, very honest and professional. 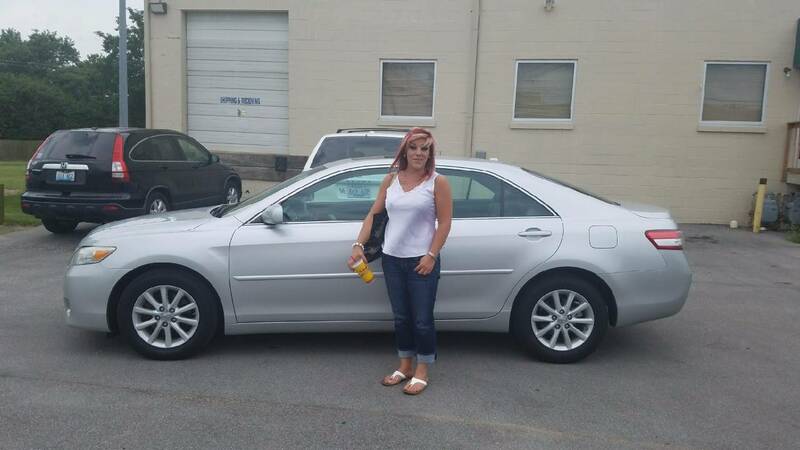 This is a great place to buy a car. I will definitely be coming back or my next purchase. I am very impressed with my purchase! A great way to spend a Saturday. 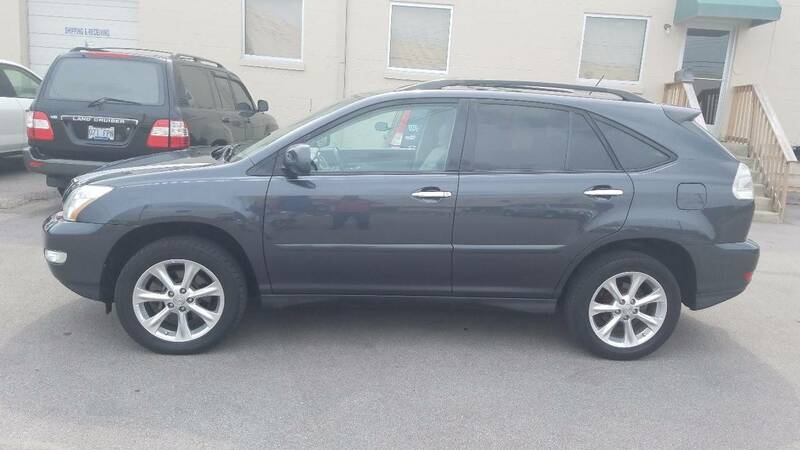 We've been looking for a nice priced vehicle for months. 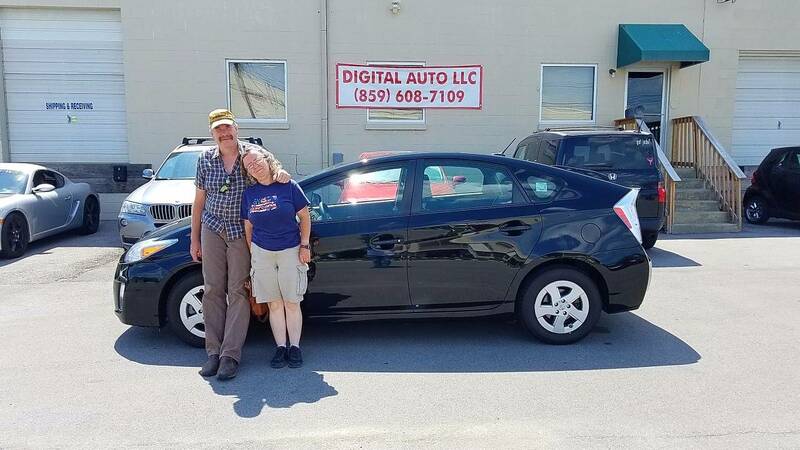 We saw the ad on cargurus.com and now we are owners of a very nice 2010 Prius! Great service. Come check this place out. 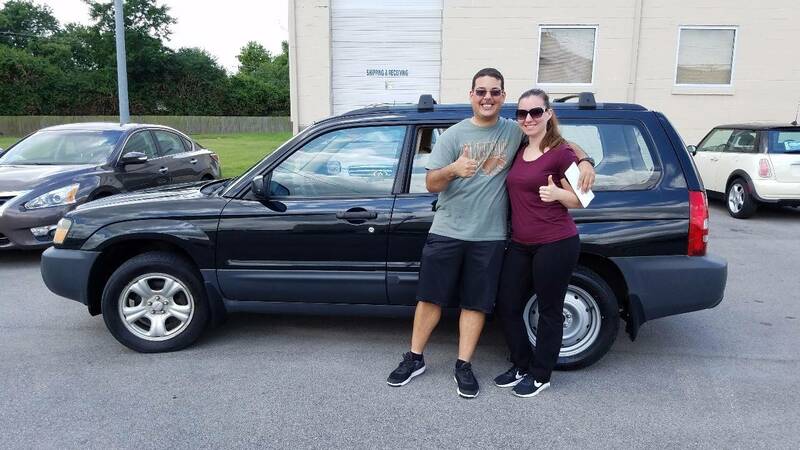 The best car buying expirence I ever had! They are real friendly and they let me take my time with the vehicle. I will reccomend them to anyone. This was my first experience not being hounded by the typical vicious car-salesman type. I appreciated that the staff were honest and friendly. I think we all walked away happy. This was definitely the least painful paperwork process ever. Thanks Mike and team! Felt at ease when dealing with Jimmie and the car lot. Very great experience and very easy going peopple. We wasn't harrasssed at all and took no time to get us into our new car. we recommend any body to come check this place out! 10/10. Jimmie and Mike were wondeful to work with! Honest and easy to deal wth. Highly satsfied with the transaction. 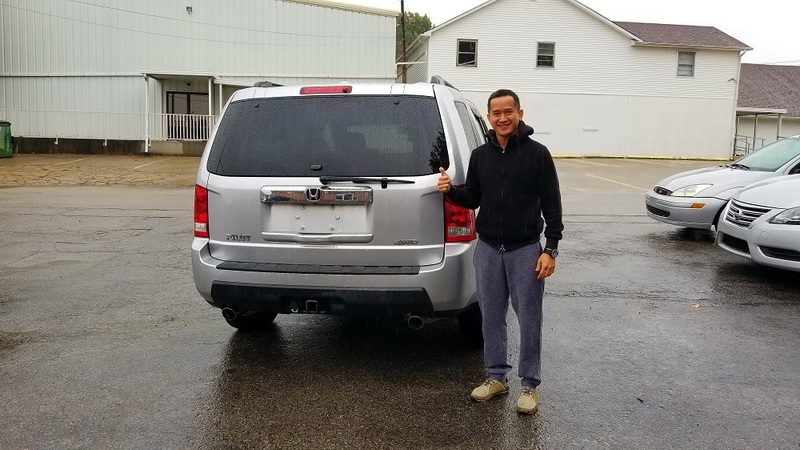 I absolutely enjoyed my experience buying this vehicle. 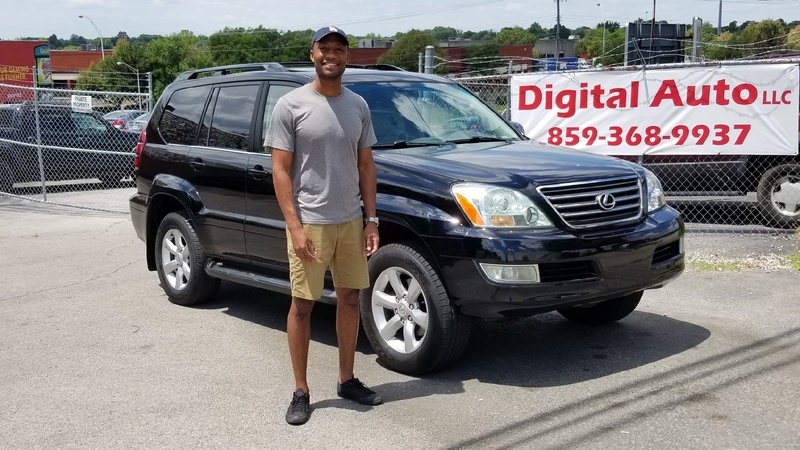 They were courteous and answered all my questions to my satisfaction..I would recommend them to anyone wanting to but a great car. 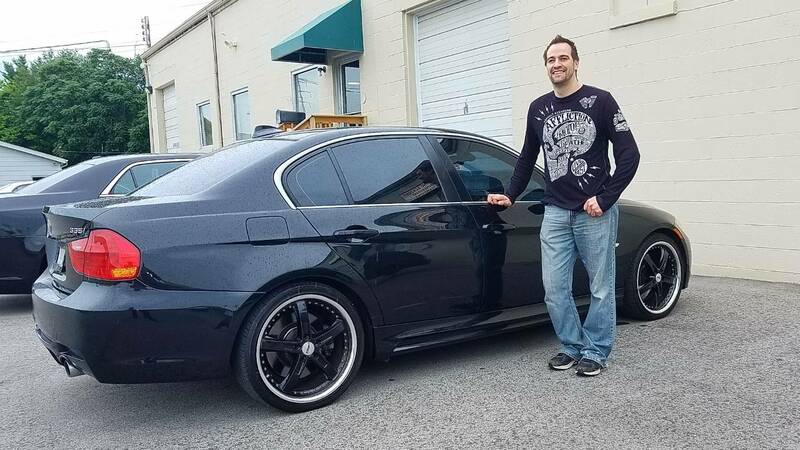 Great Car, Great Price! Thanks A Lot! JUST A GREAT CAR BUYING EXPIRENCE ALL AROUND. MIKE TOOK GOOD CARE OF US AN WE ARE VERY HAPPY. Very informative and reliable car dealership. Jimmy and the rest of the crew will take good care of you as they did me. 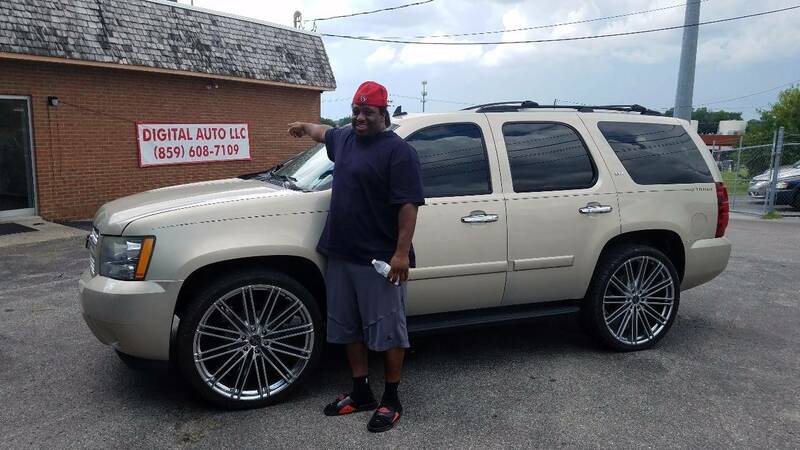 Jimmie here at Digital Auto helped me with this great deal on this 2007 Hummer and everyone here is helpful and friendly. Thank u Jimmie for every thing u did to make it happen , great car . great deal . 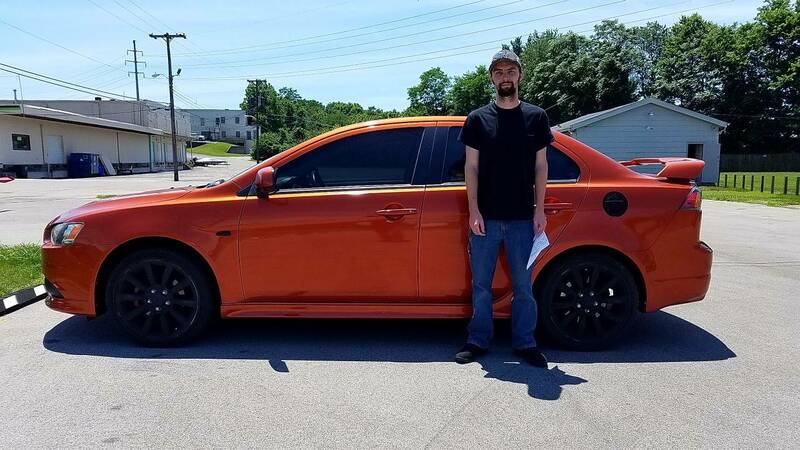 Came along way to find the right car. Very easy to work with and now driving the car back to Houston. One awesome place to get one heck of a deal! 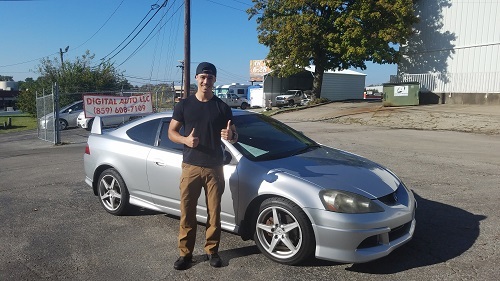 I want to thank Brandon the internet manager for coming over to the airport to pick me up and bring me back to the lot to buy the car. Great customer service. 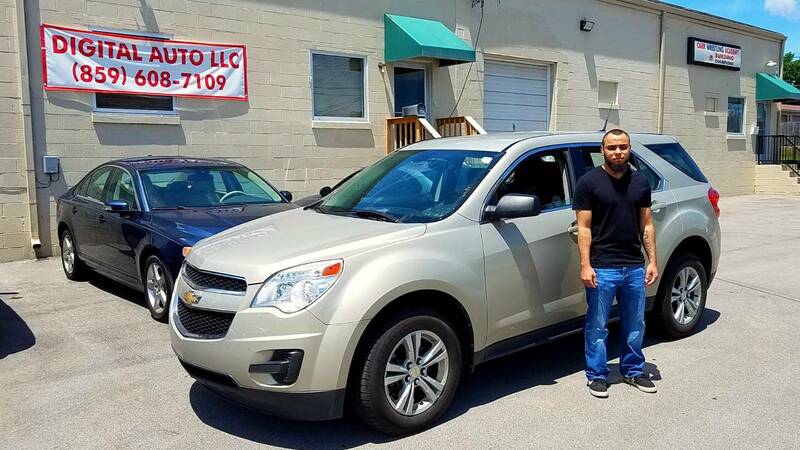 Fairly priced vehicle, smooth negotiation and professional customer service. I would purchase from here again. 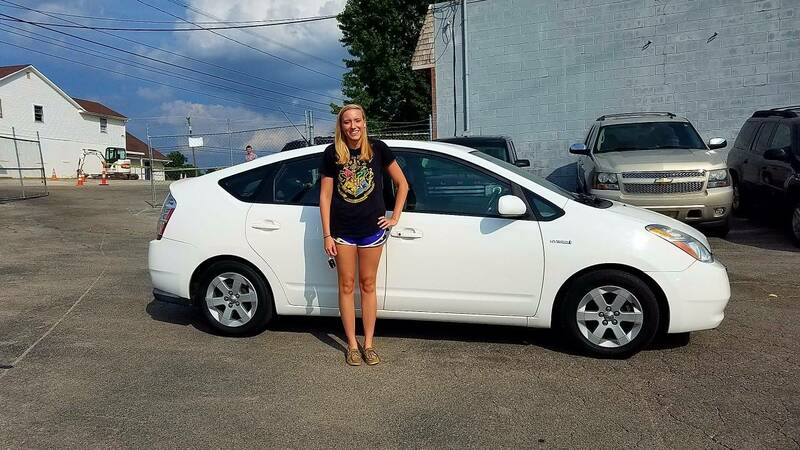 I came from Shelbville, Ky to purchase a 2008 prius.This was my first car. 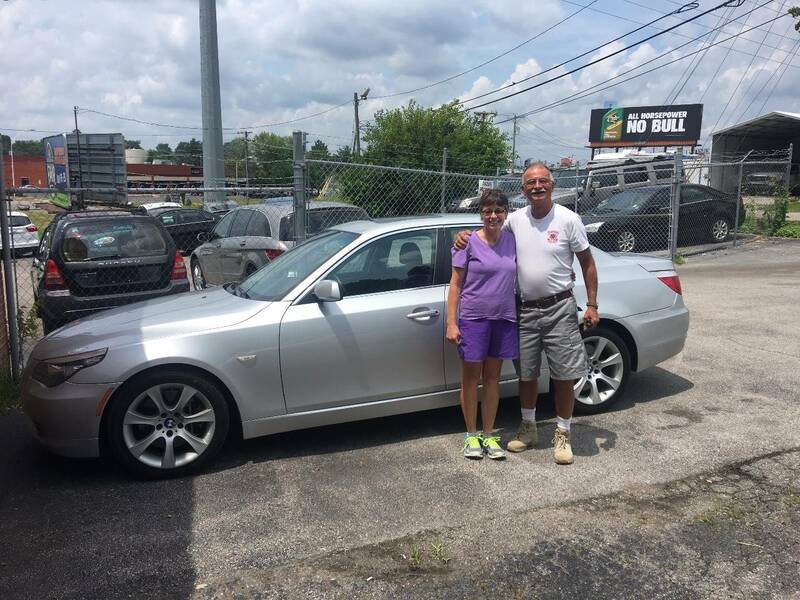 We had great customer service and they had gone out of there way to make sure there were no issues with the car. As a first time car owner this was very importent to myself. I was worried about getting taking advantage of thankfully they were extremely honest and up front with everything. I would recommed anyone to buy from this company and feel good about doing so!. 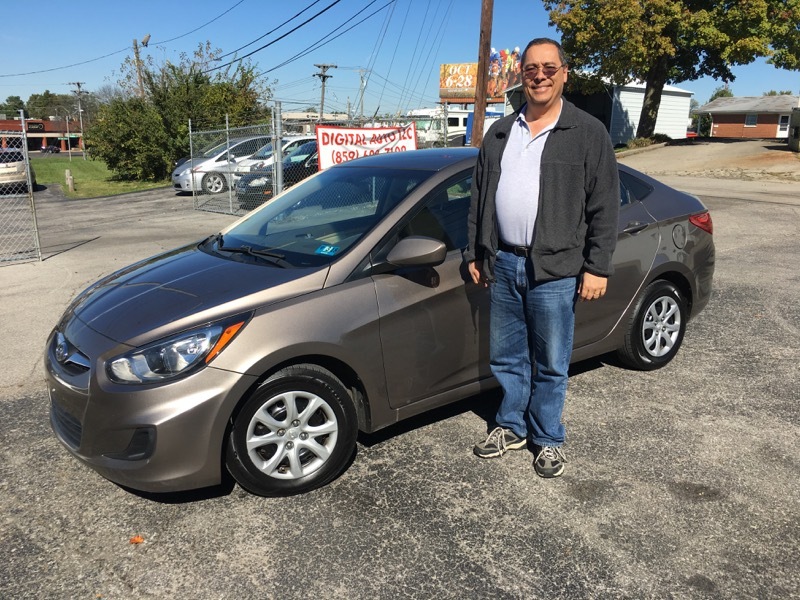 I love our new 2012 Hyundai Accent and the hassle free experience that came with buying. Thank you Justin! 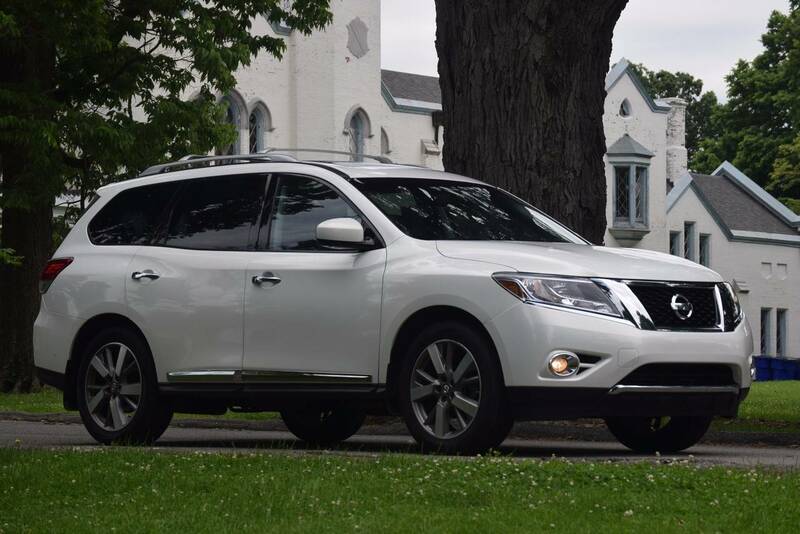 BILL AND I ARE VRTY HAPPY WITH OUR NEW NISSAN PATHFINDER. THE SALES TEAM WERE JUST AWESOME. 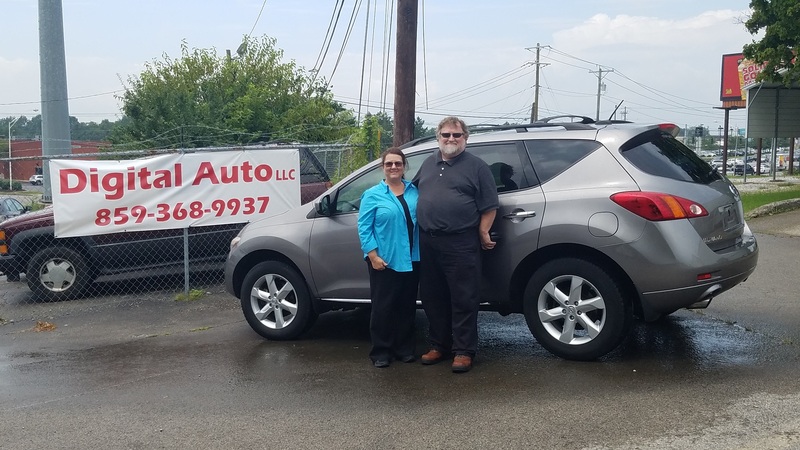 WE APPRECIATE THE WAY THEY TH TOOK CARE OF OUR NEEDS.THANK YOU VERY MUCH,GLENNA AND BILL WHITE. This has to be the most efficient purchase of a car I have ever done. AJ was great and answered all my questions. 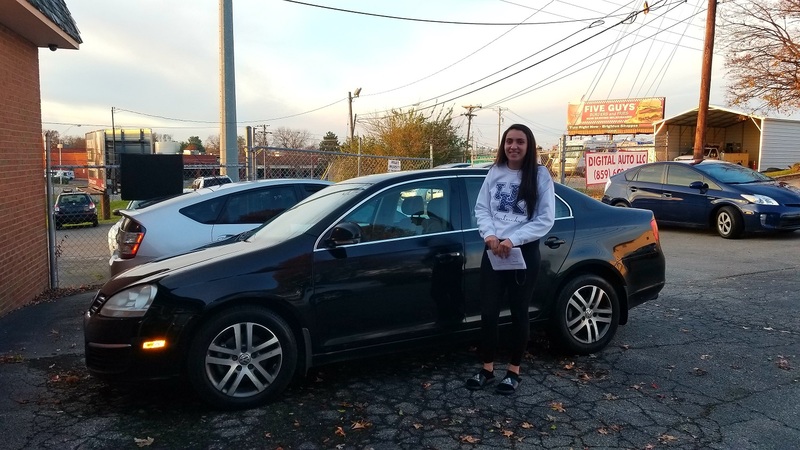 I no longer dread the car buying process! Overall great experience. No pressure and very easy working with Mike and Jimmie. They go over the vehicles to make sure they are in good condition prior to drive off. THey had replaced a battery cell in the prius I bought prior to drive off. 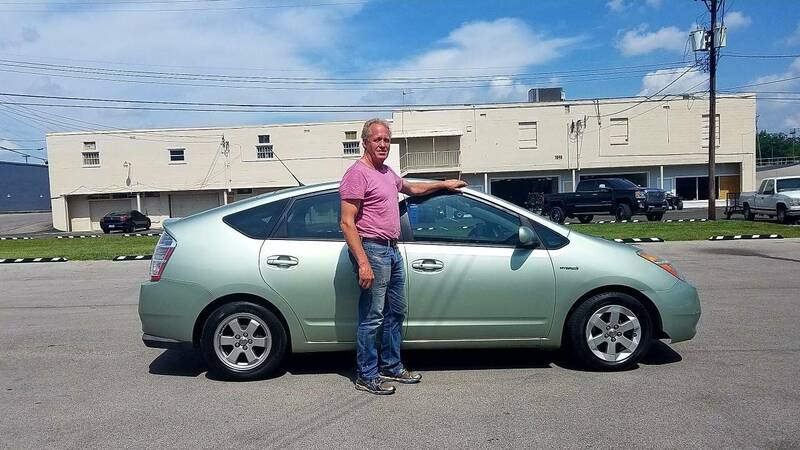 I would recommend them to anyone looking for a used car. 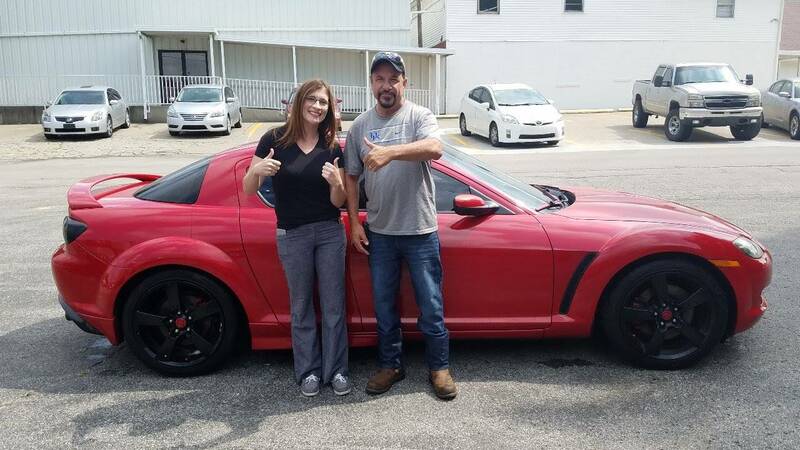 Mike and Jimmie made the car buying process very smooth and very fun! 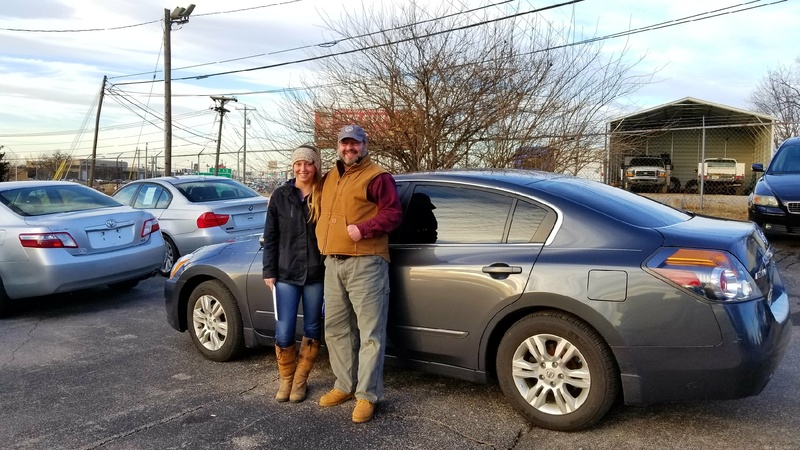 I was very pleased with how well they handled themselves and their business. Definitely recommend these guys! 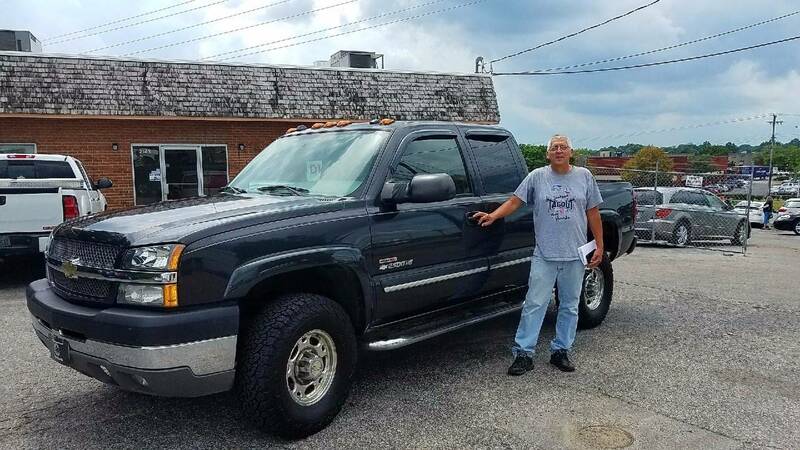 I HAD GREAT EXPERIENCE BUYING THE TRUCK. MIKE IS SUPER FRIENDLY AND I WAS SATIFIED WITH OUR DEAL. I WOULD RECOMEND THIS DEALER TO MY FRIENDS. i LIKE THE NO PRESSURE TACTIC AND WAS VERY ACCOMODATING TO US. THANKS....!! 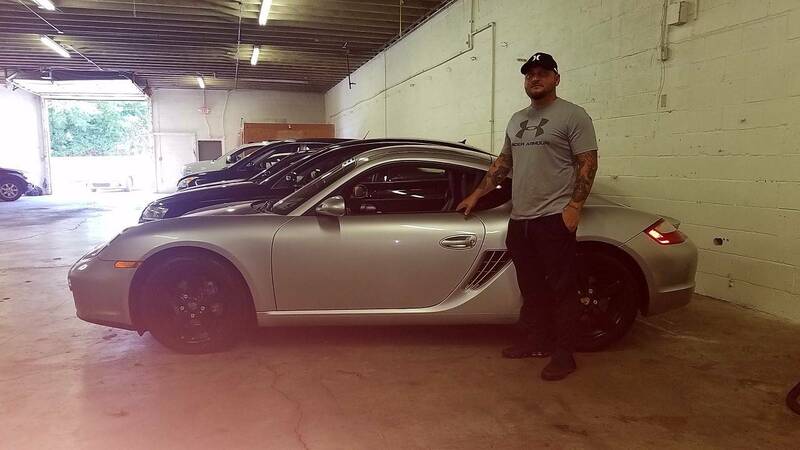 We bought a car from his dealer. The experience was a great experience. 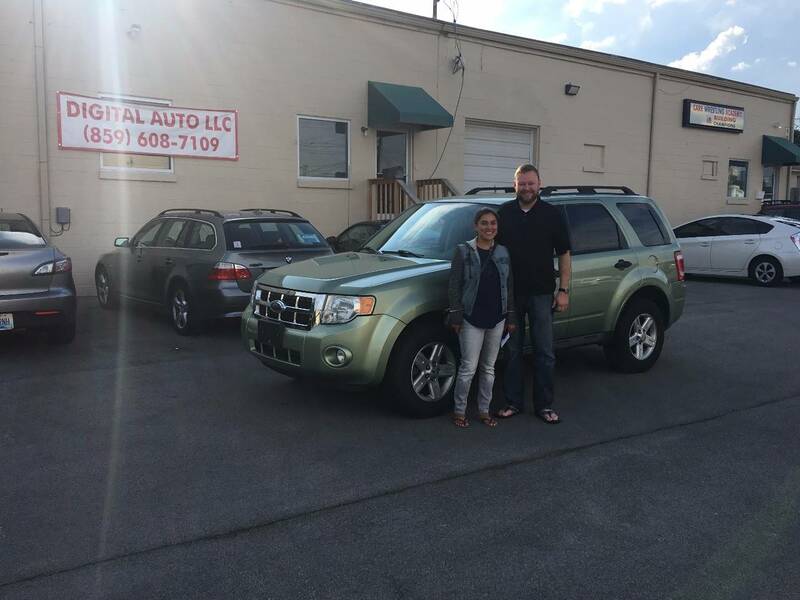 We did not feel pressured and they were very helpful will all aspects of the deal. 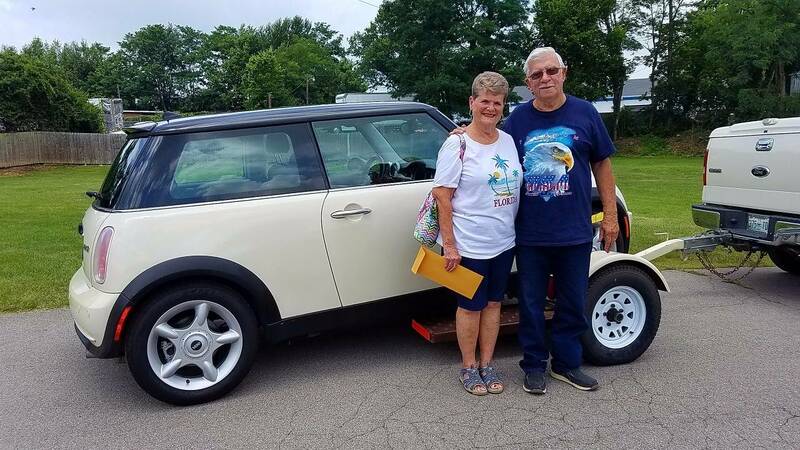 WE FOUND THE RIGHT CAR AT THE RIGHT PLACE. 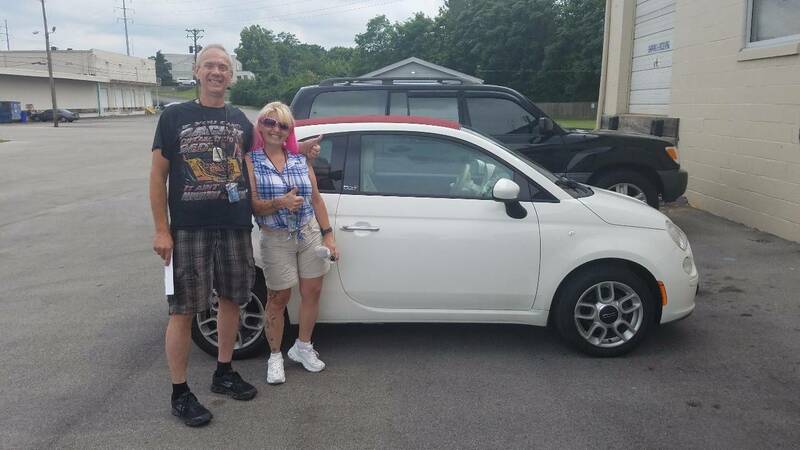 WE HAD A GREAT CAR BUYING EXPIRENCE. They were awesome to work with! 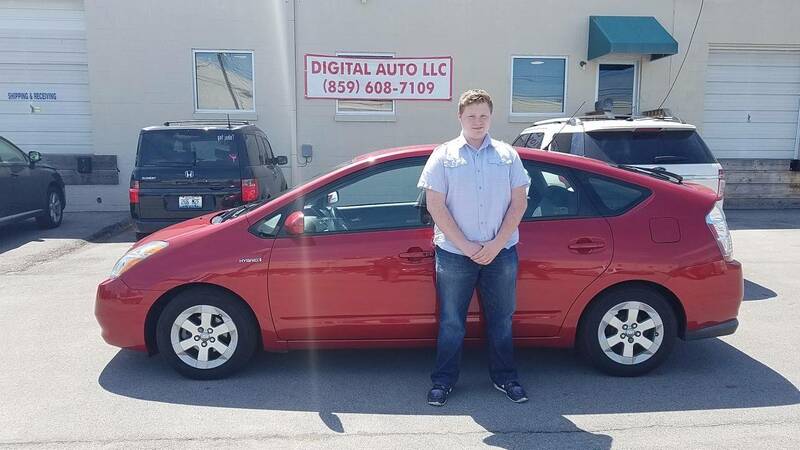 Made my first time buying a car very easy. Highly Reccomended! Great customer service! 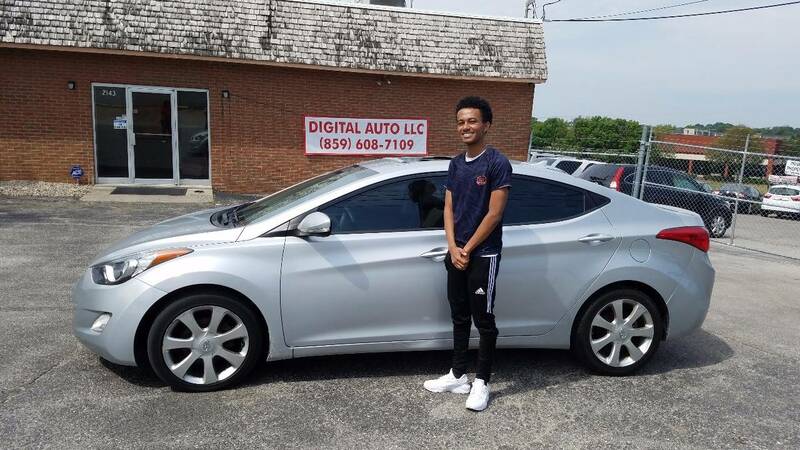 Helped me purchase my first car, I recommend this dealership to anyone looking for a car. 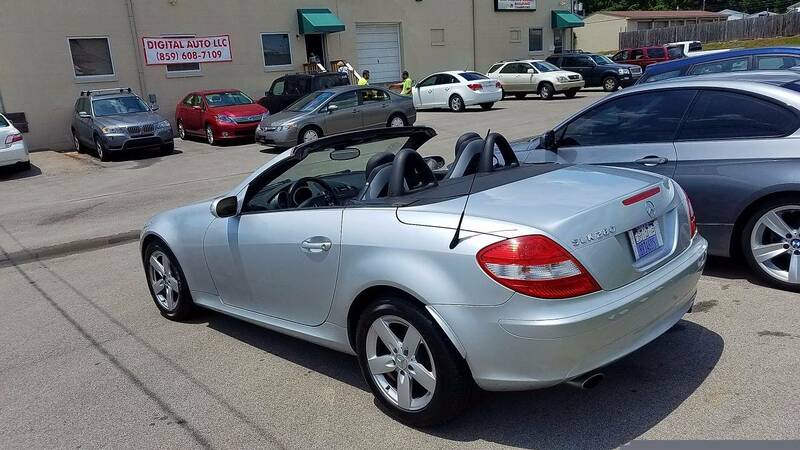 Great prices on all cars as well. Very very happy with the car I bought will be here again if I ever look for another one. 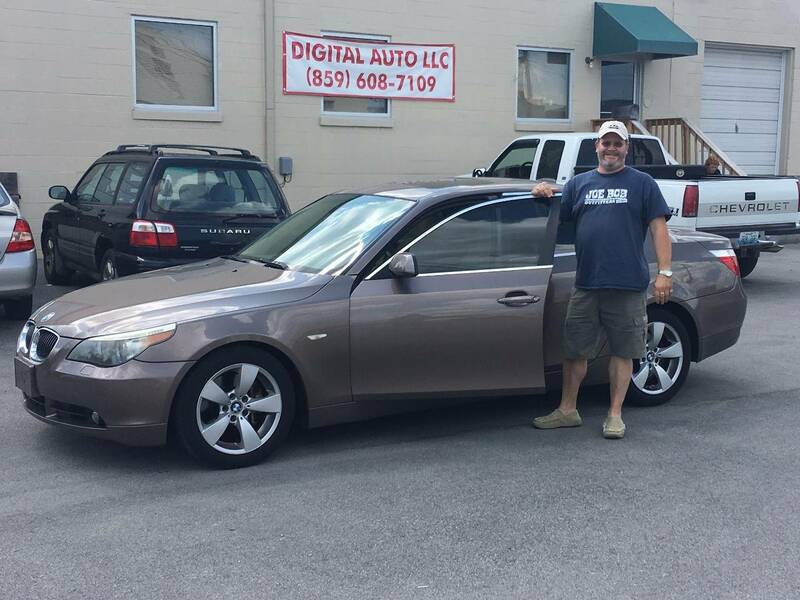 Mike was great to deal with, he made everything easy. 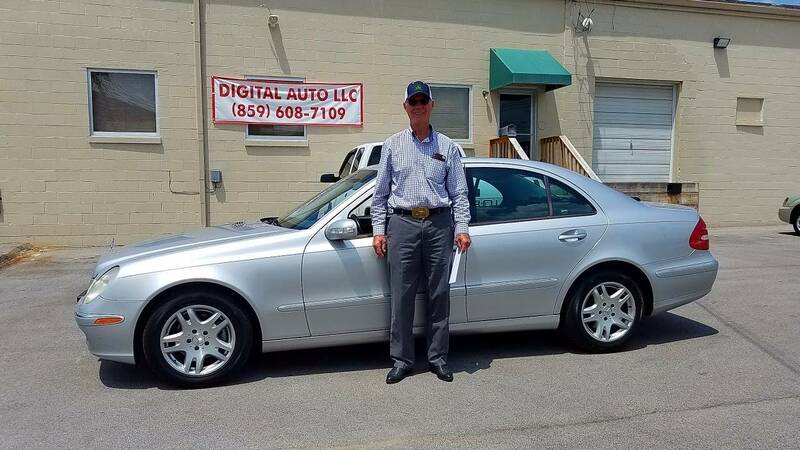 Mike allowed me to test drive the vehicals I was interested in and take them to my mechanic to have them inspected. 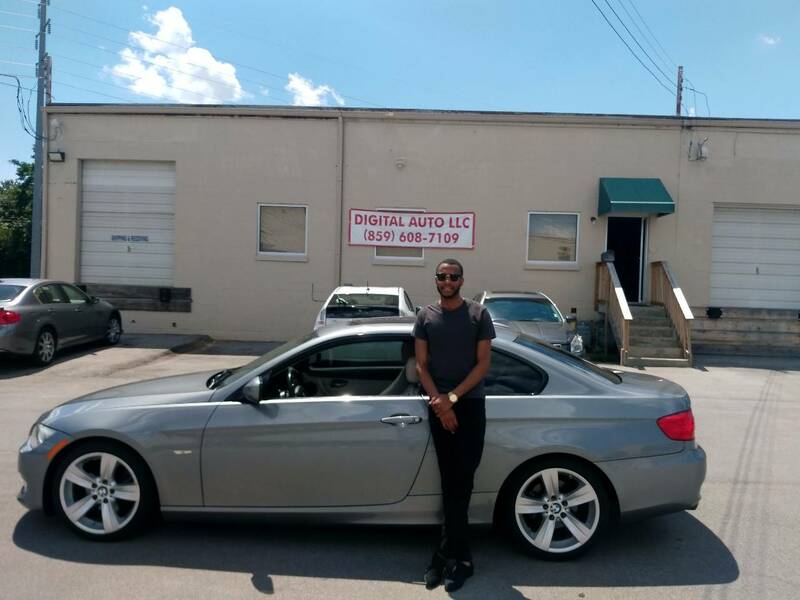 This gave me peace of mind that I was dealing with a honest auto dealership. 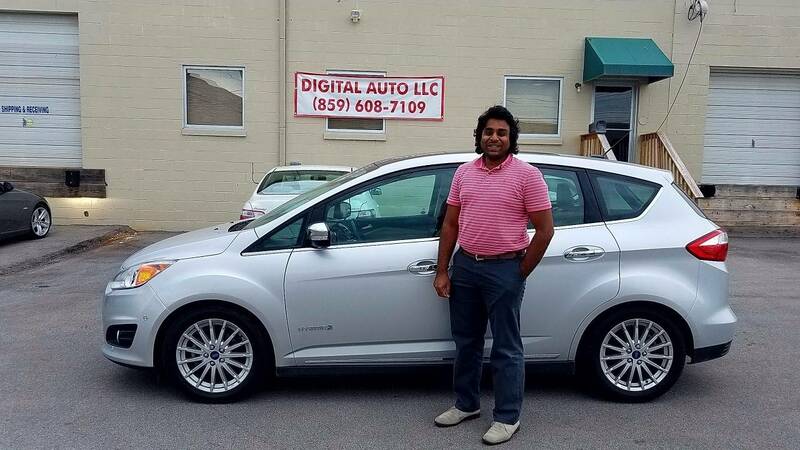 I would recommend Digital Auto to anyone looking for a automobile. I'm so happy to find this place. Good people and they are easy to work with. Jimmie was great! 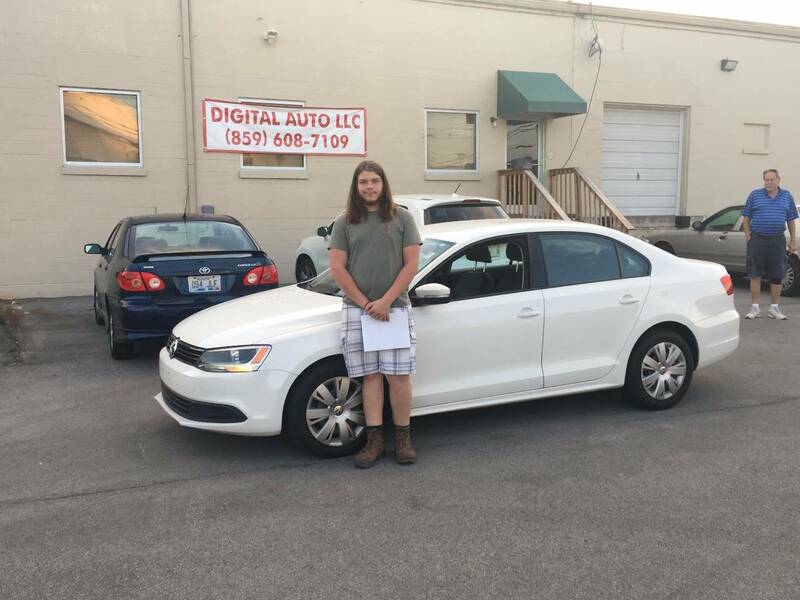 I was happy to drive a little to get this deal and it was worth it! Mike was helpful in every way. I found exactly what I was looking for at a great price. 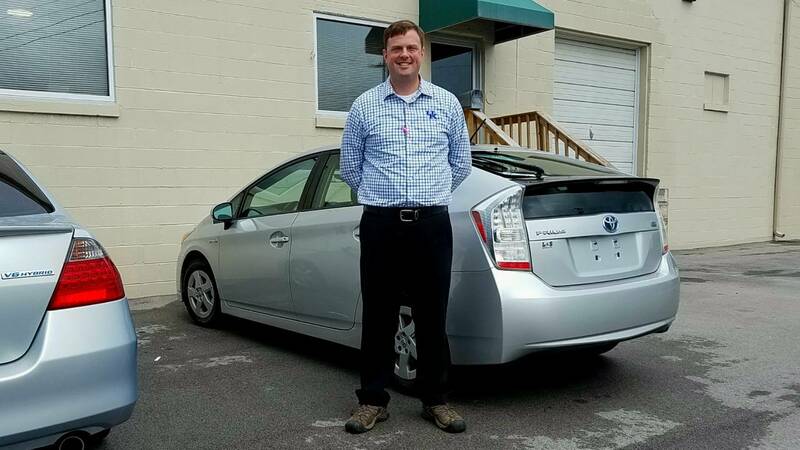 It was an easy buying process and I am super happy with my 2012 Toyota Prius. 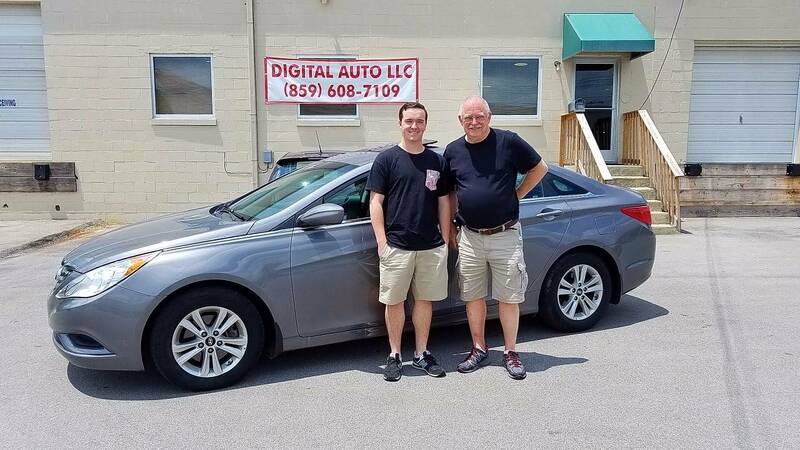 We had a really good experience buying our son his first vehicle here. Jimmy was friendly and very professional. been a real adventure here but amazing deal and amazing people. 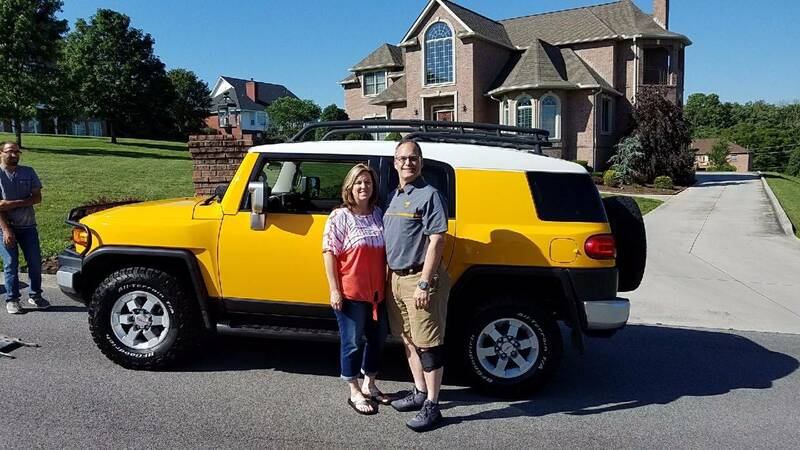 love our new ride!!!!!! 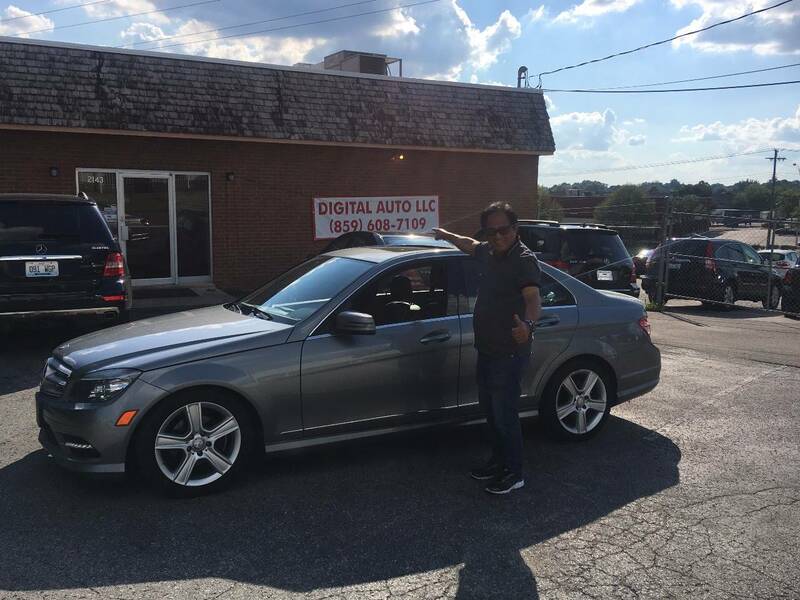 THANK YOU MIKE (DIGITAL AUTO) FOR EVERYTHING....THE CAR IS VERY GOOD TO DRIVE!!! EVERYTHING IS EXACTLY JUST THE WAY YOU SAID IT WOULD BE, PERFECT!!! 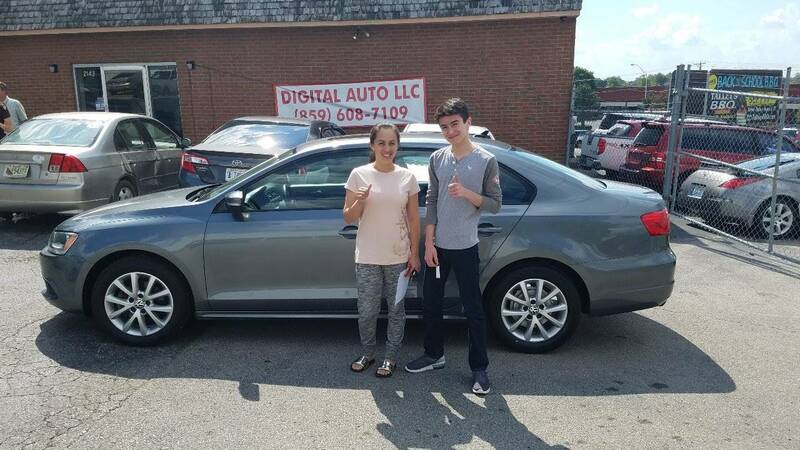 Great people and easy to work with when getting a car. WE HAD A GREAT EXPERIENCE AT DIGITAL AUTO. 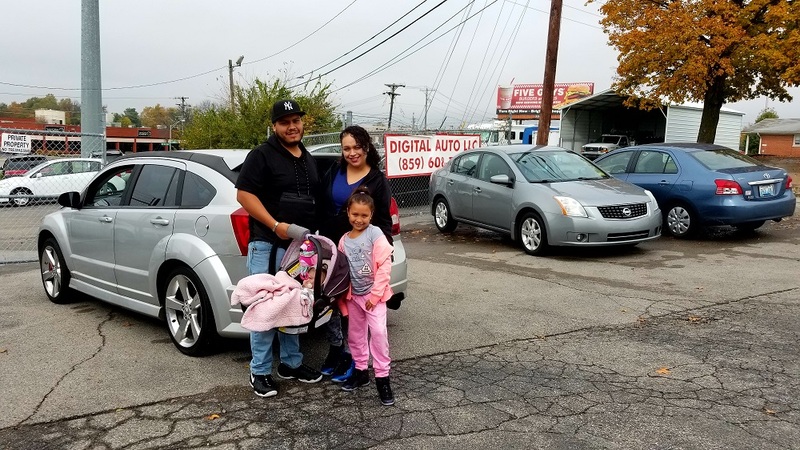 THEY HELPED US FIND JUST THE RIGHT CAR FOR OUR DAUGHTER. VERY EASY TO DEAL WITH AND GREAT SELECTION. WE WILL BE BACK. CAME ALL THE WAY DOWN HERE FROM PEWAMO MICHIGAN! DISCUSSED ALL DETAILS BEFORE I GOT HERE AND WHEN I ARRIVED MIKE WAS EXACTLY RIGHT! 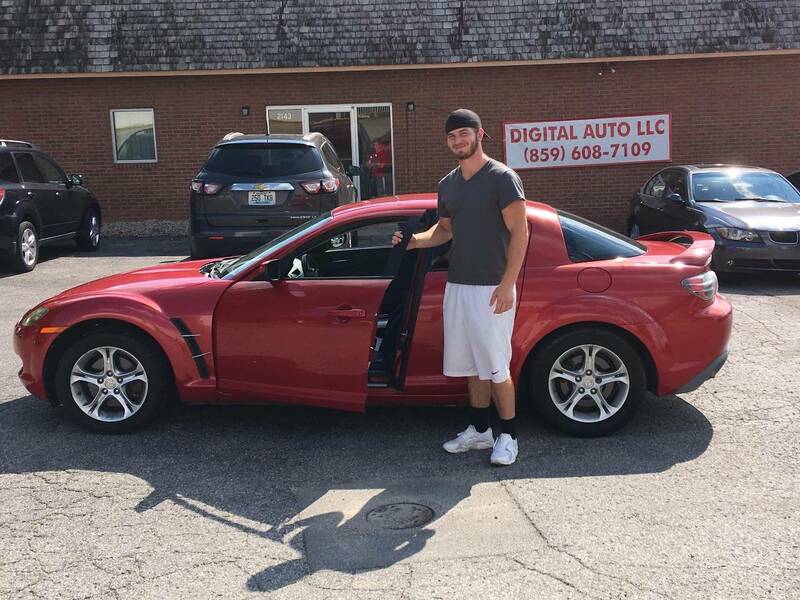 NO HASSLE NO HAGGLE AND NOW IM HEADED TO PEWAMO NORTH BOUND 75! THANKS JIMMIE FOR DOING MY PAPER WORK SUPER FAST. THANK YOU MIKE!!! 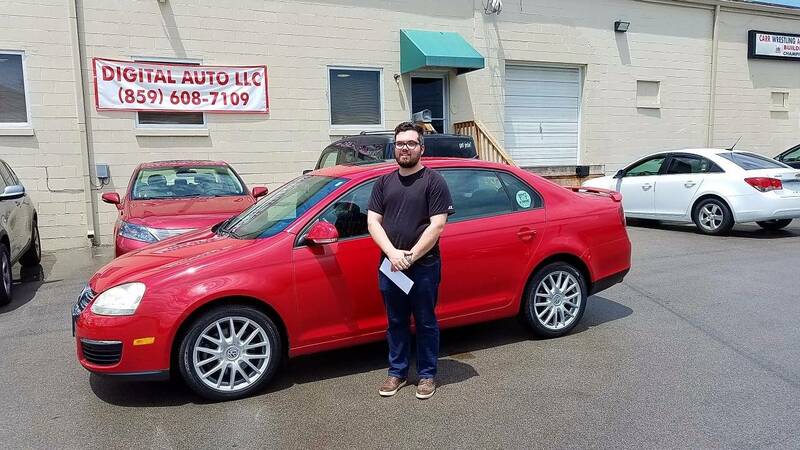 I came from Oklahoma to buy my first car. I was looking at one care that looked really good so i came in and they said it was sold. and they apologized for that, but they helped me find a just as good one or better which i loved. 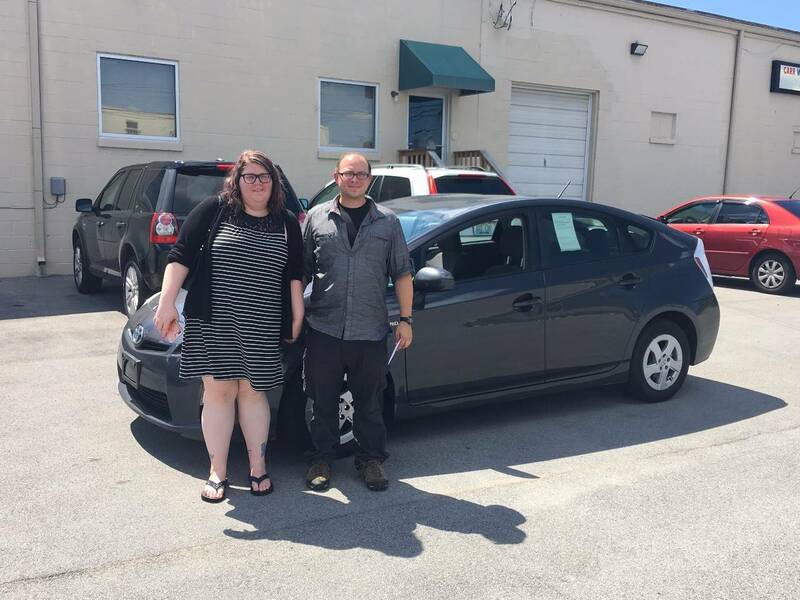 best car buying experiance of my life! really laid back but still very professinal vibe with the staff. the owner mike was hilarious, and extremely helpful. this is your spot if your looking for a great deal! Right when i got here there was a friendly staff ready to help. They were perfectly ok with letting me test drive whatever i wanted. Mike was very helpful in trying to get us the best deal possible. Fantastic and resonable place to buy a car. 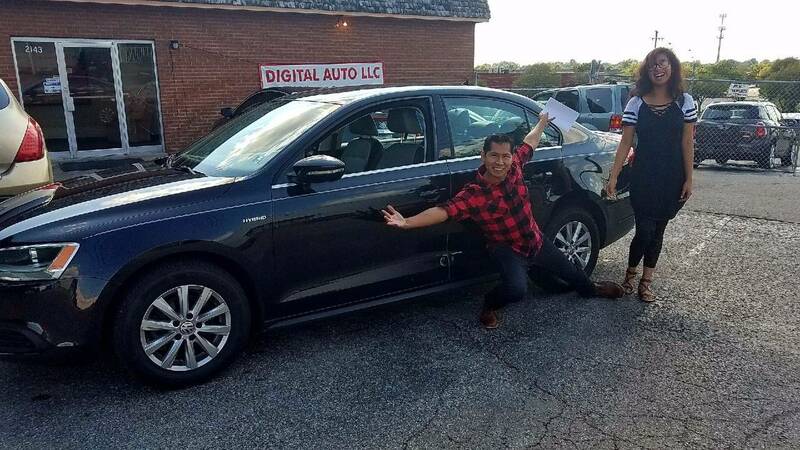 This is my first time buying a car and it was so simple and hassle free. Jimmie and Mike were extra nice and super hJUSTINelpful! 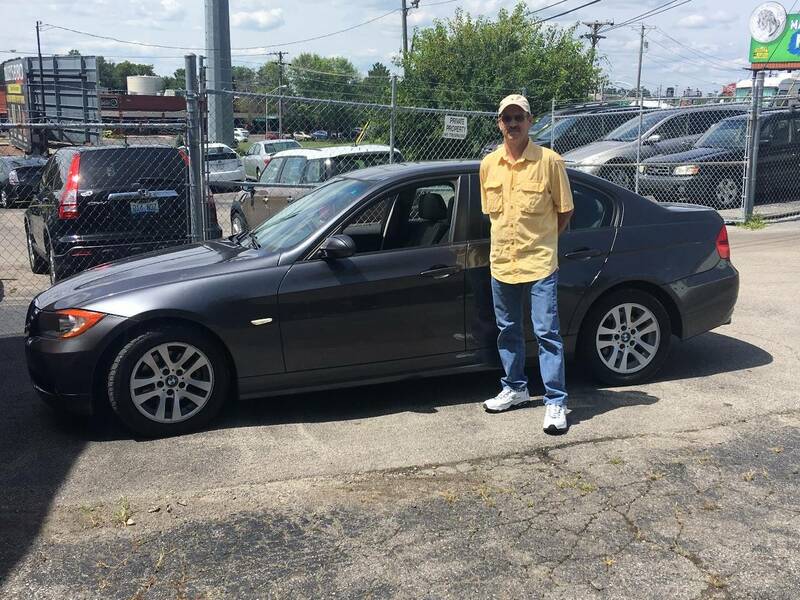 Great experience....Mike, you made the decision making process and the buying of a car very easy! Thanks! 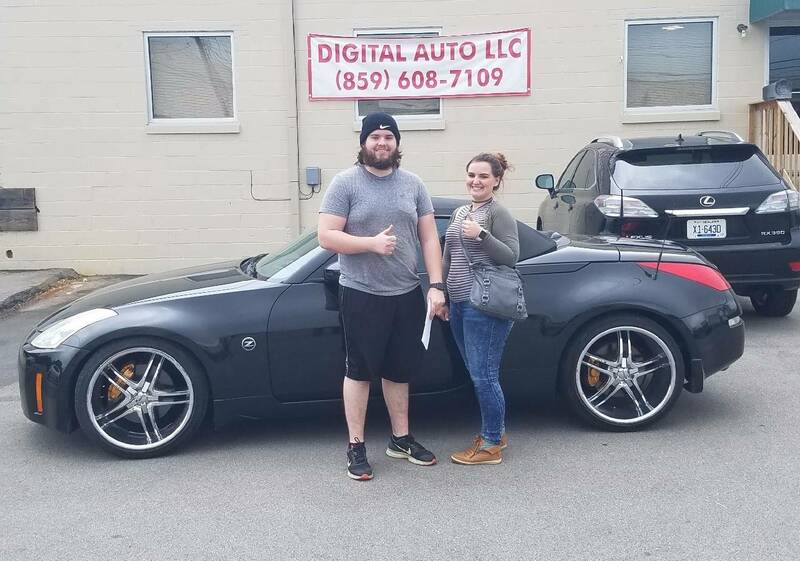 Thanks to everyone at Digital Auto for working in such a friendly and professional manor in helping me with my purchase! 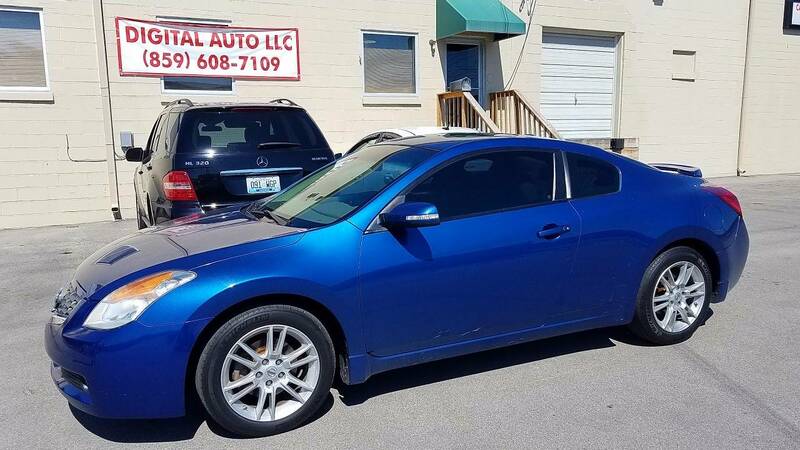 Great price, Great car, well worth the drive from NC. Mike an Jimmy are great. 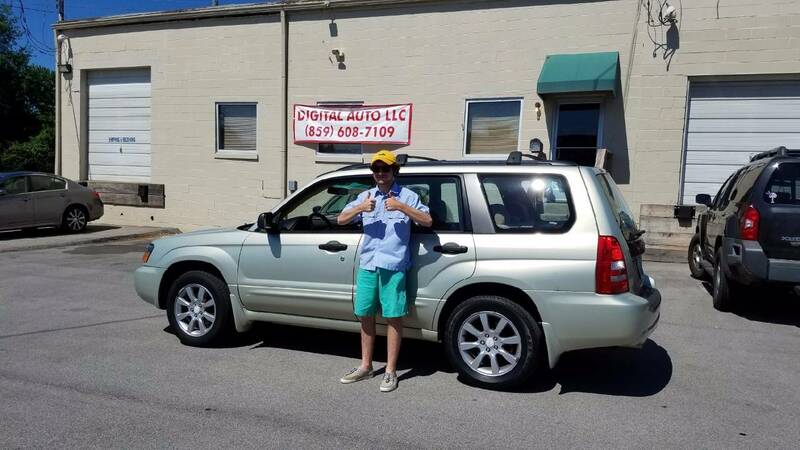 Greatplace, great expirence buying my car! Mike was very helpfull. 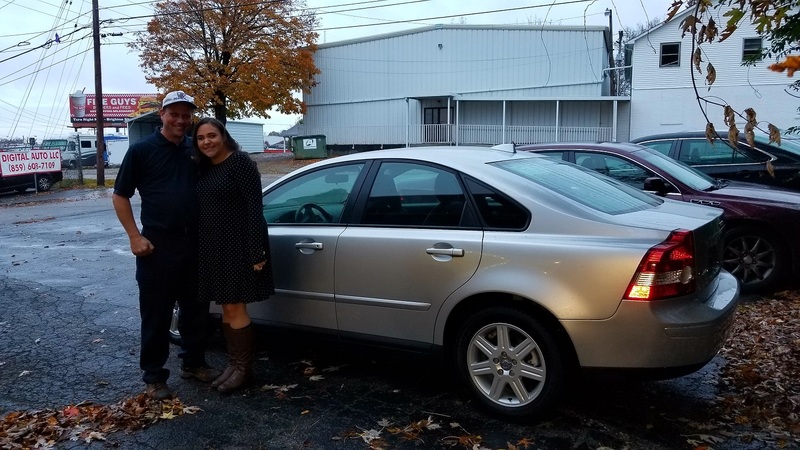 Great car , Great deal , Awesome Customer Service , Very up front , These people know the Car business & Customer service , Very happy with my car! thank you Mike , Thank you Jimmie . I couldn't have found a better deal and a better place to find it. Justin and Mike were great and easy to deal with. Great People . easy to deal with no hustule no prussre , they will give u the time and the space so u can make the right call and do u inspiction the way u want thank u Mike for every thing . 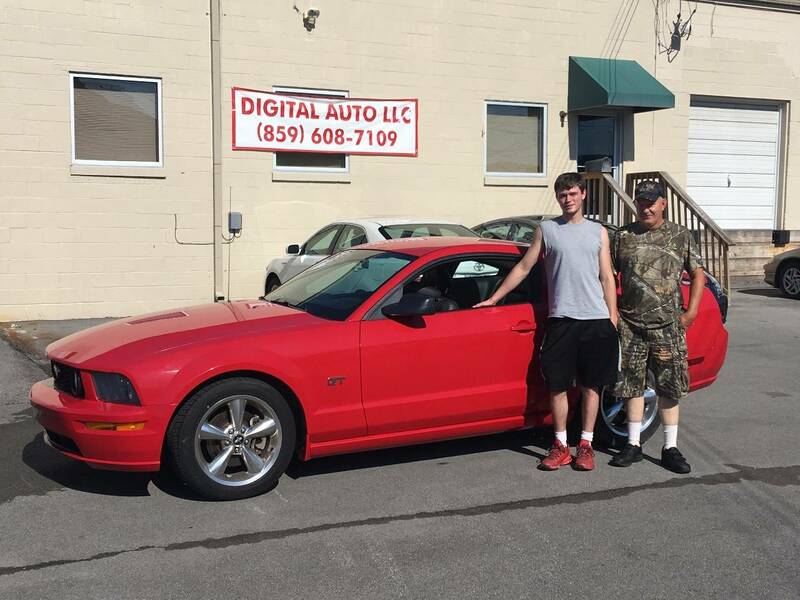 Everyone was very friendly and they allowed us to freely look at several vehicles on their lot. No pressure to purchase, just a geat buying experience. 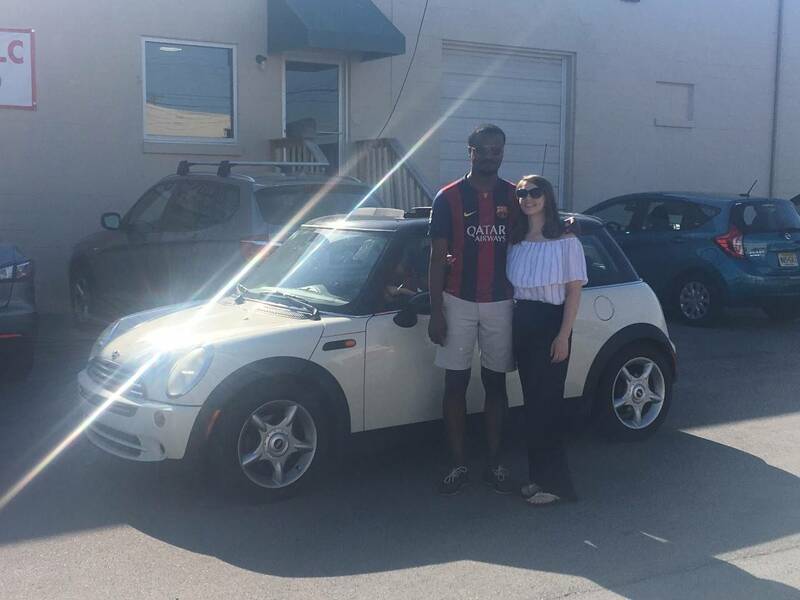 Made our first car buying experience quick and easy. 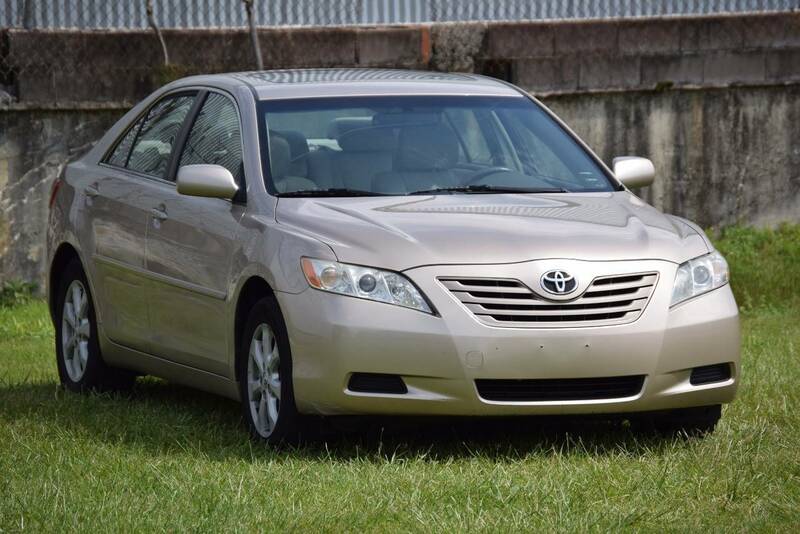 Cars are all garage kept and in excellent condition. Very friendly service. I found exactly what I was looking for here. No hassle expirence. Friendly and low-pressure people to do business with. Very responsive to questions. Good to deal with. This is a wonderful group to work with! 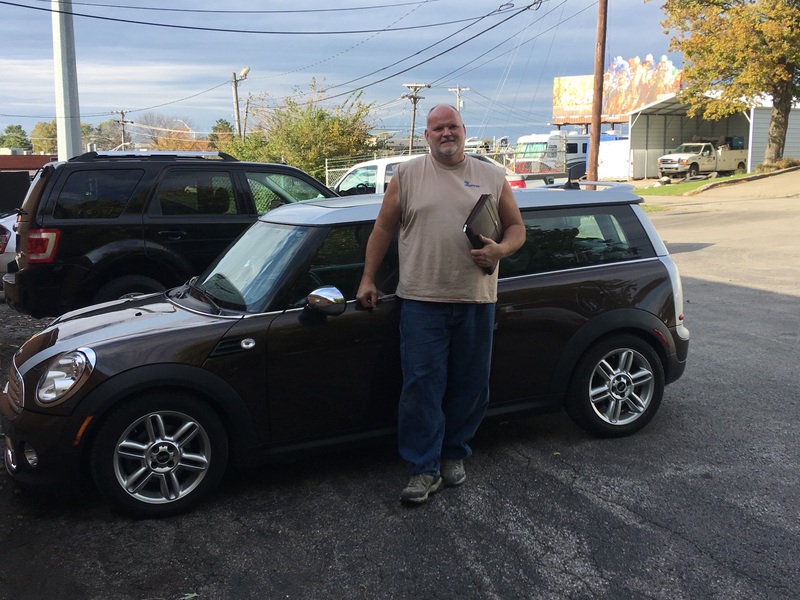 Thank you Mike for answering every question and giving us such a good price on this beautiful blue Mini Cooper! AWESOME PLACE, AWESOME PEOPLE & AWESOME CARS. WILL BE BACK. This place is way Diffrent than any other Dealer , They are very upfront no pressure at all , Give me all the time i need to check the car . car was exactly as described . Thank you Mike , Thank you Jimmie for the great deal . 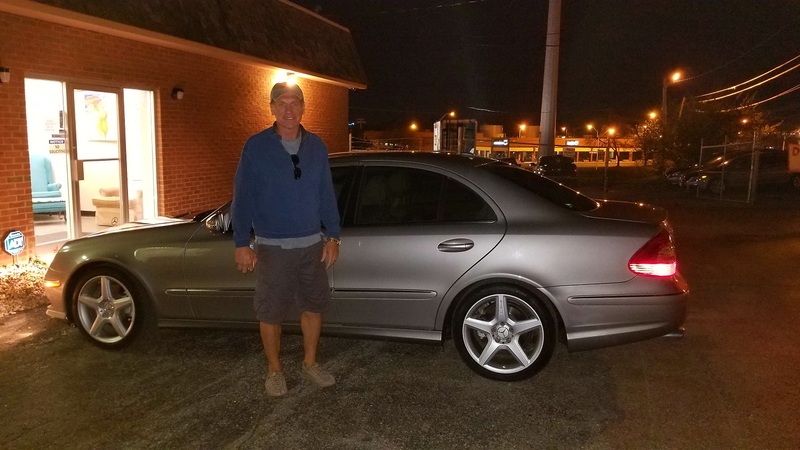 CANT GET BETTER THAN THIS GREAT CAR , GREAT DEAL , GREAT STORE , THANK U JIMMIE FOR THIS GREAT DEAL , I TOLD THIM WHAT I AM LOOKING FOR NEXT DAY MORNING THEY CALLED SAYING THAT CAR WAS AVAILABLE FOR ME , JUST WOW . THEY JUST LOCATE FOR ME ECAXTLY WHAT I WANT IN LESS THAN 24HRS . 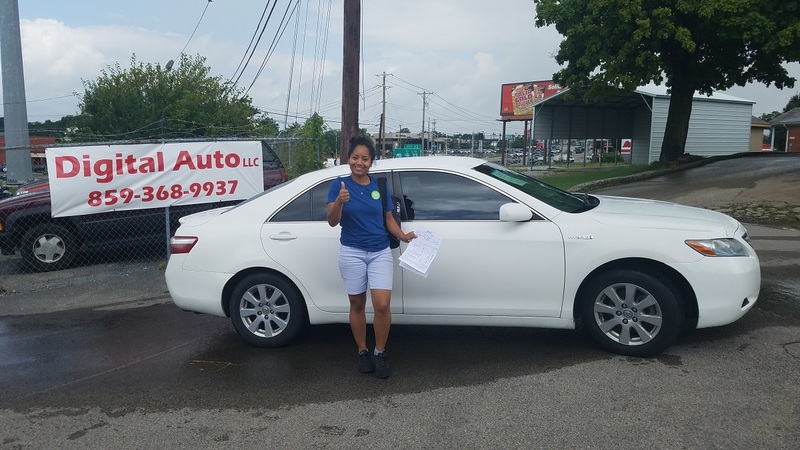 Great people best service in Lexington. 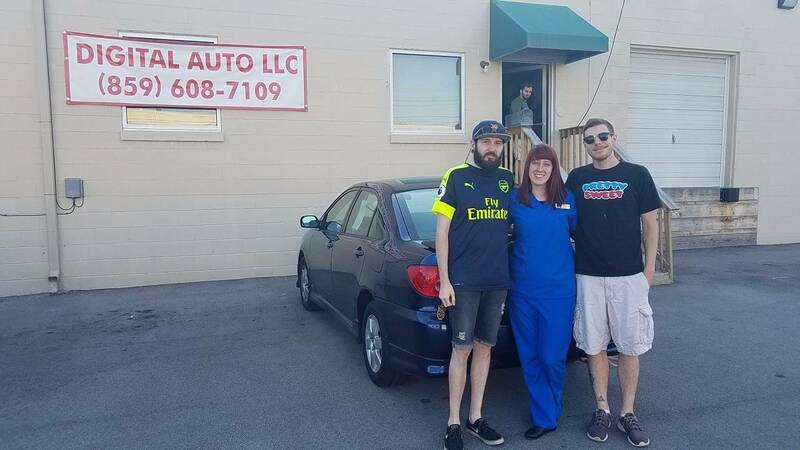 This is the place to go to and the guys to talk with when you need a car. Hands down best place in the state. Great family owned business! Aside from Mike, Ziggy was my favorite. 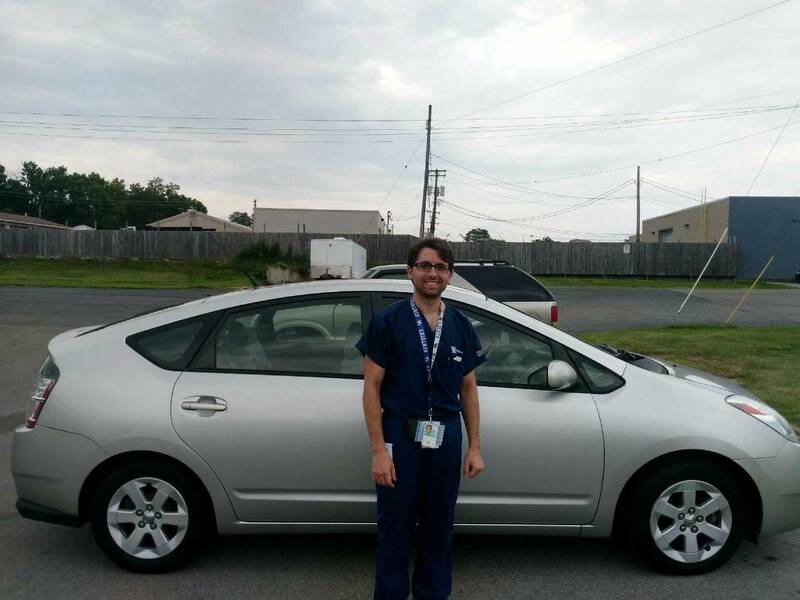 So excited about my brand new car. Thanks Digital Auto. My boyfriend will be here soon. 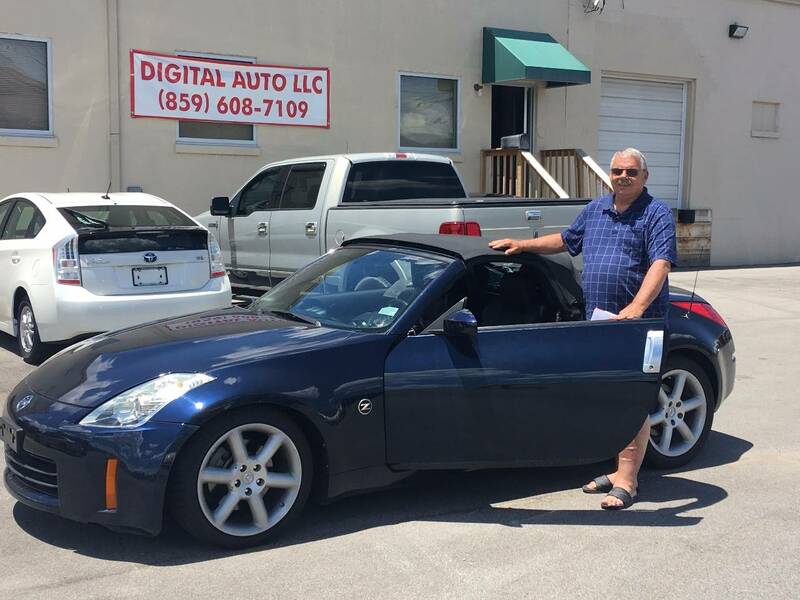 WE RECOMEND DIGITAL AUTO TO ANYBODY. MIKE WAS GREAT! 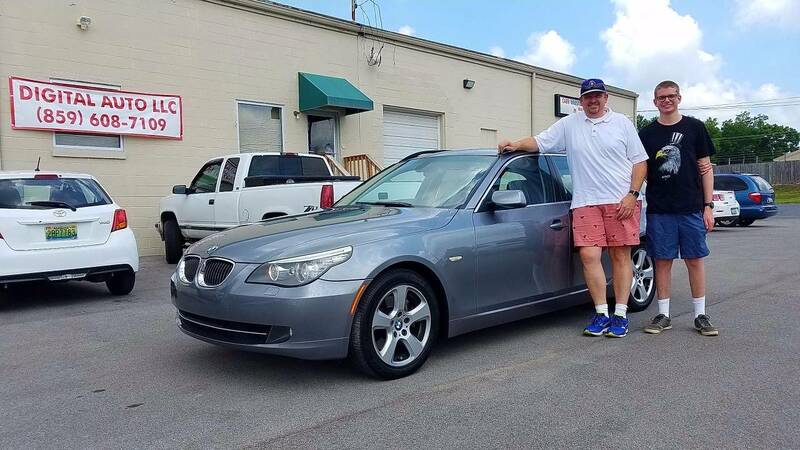 This is a great place to buy a car. 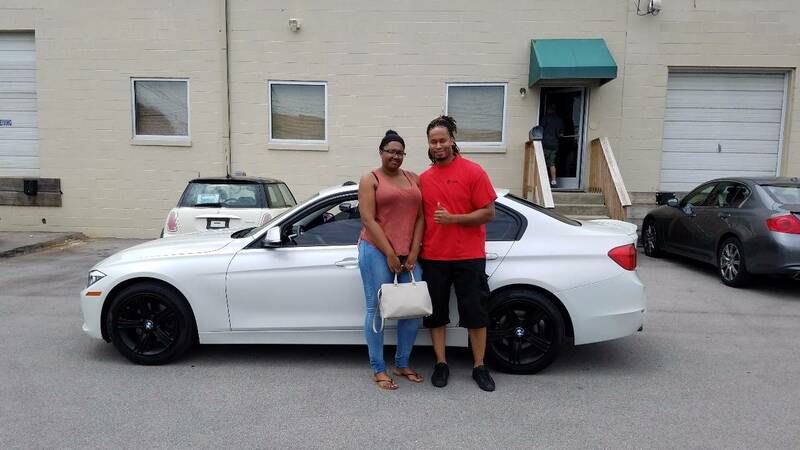 I really like my BMW and they went out of the way to help me find what I need. 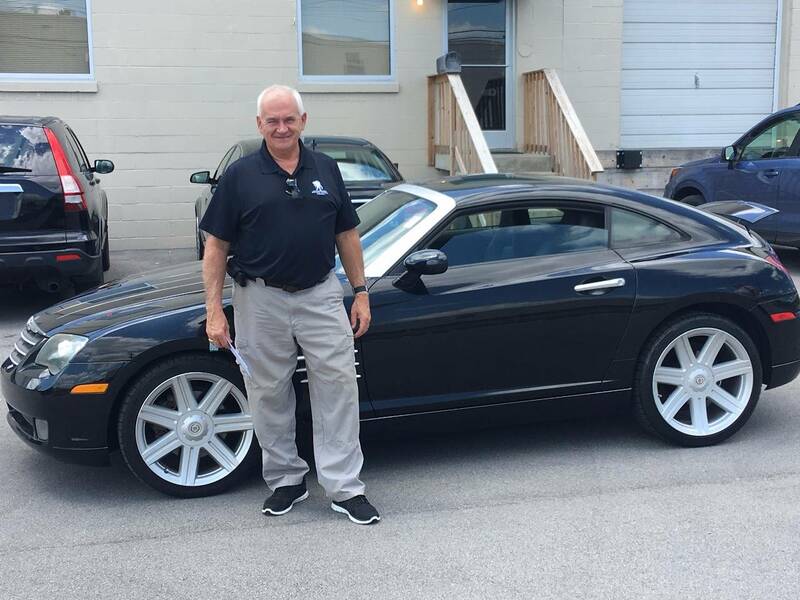 GREAT CAR, GREAT DEAL , GREAT PEOPLE. VERY COURTEOUS VERY PROFRSSIONAL ATMOSPHERE AND VERY LAID BACK AT THE SAME TIME!!! 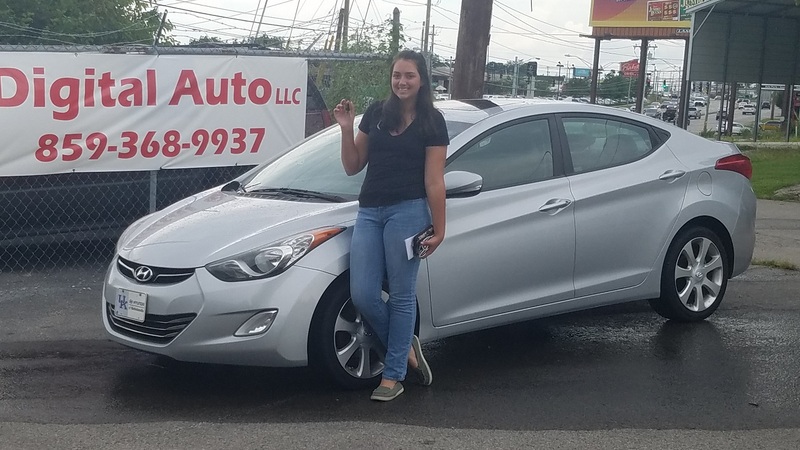 THANK YOU SARAH FOR GETTING ALL MY INFO STRAIGHT BEFORE I ARRIVED AT THE DEALERSHIP!!! 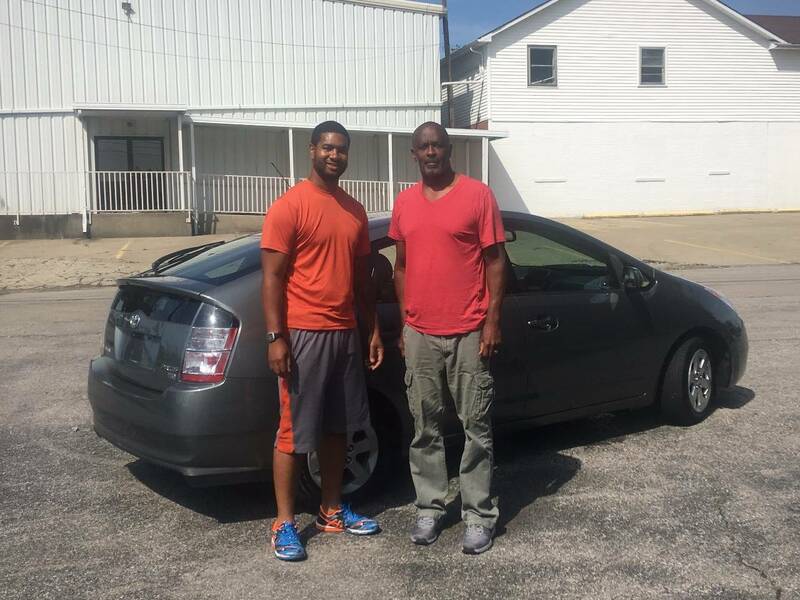 Mike and Jimmy were great to buy a car from, unlike most lots there was no pressure at all. They answered all our questions and concerns with smile. I will definately be back for my next purchase, great guys to deal with!!. Mike and Jimmie were very helpful and made everything so much easier for me. I recommended these guys for anyone who is looking to buy a vehicle.Thanks Mike and Jimmy!!!!! The process was simple and easy. 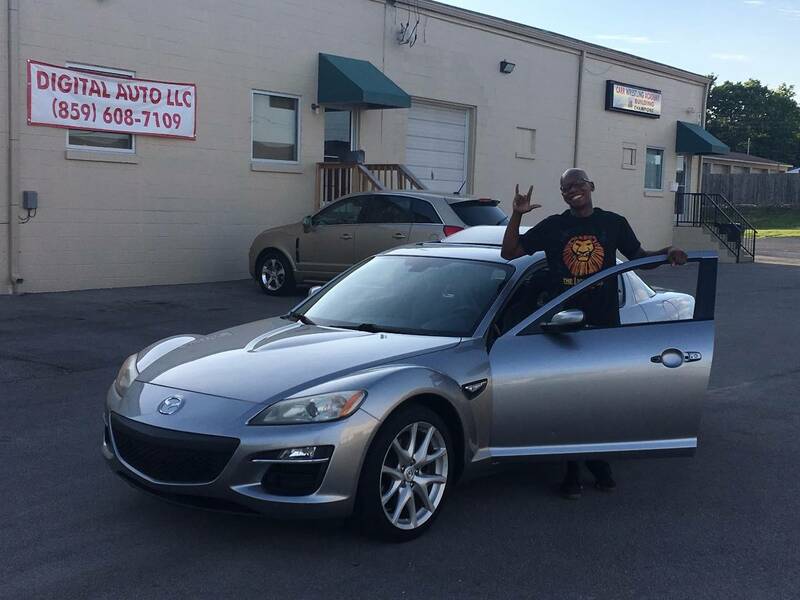 Was able to test drive and inspect the car at my own will without being hounded over hovered over. Brought the kids with us and it was not a problem. They were welcomed and had a place to relax nearby while we were working through the paperwork. 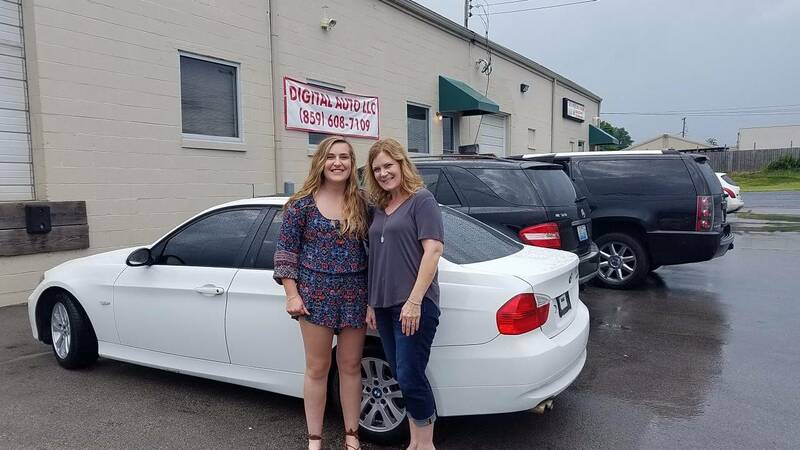 Would recommend this dealership to anyone wanting an easy buying experience and fair pricing. 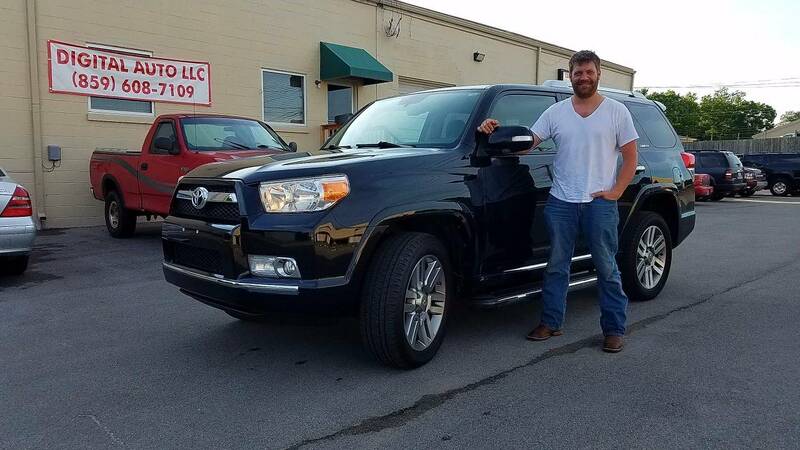 THANKS FOR THE TOYOTA. GREAT CAR FOR THE MONEY. SRAIGHT UP DEALER. So happy we found this place. 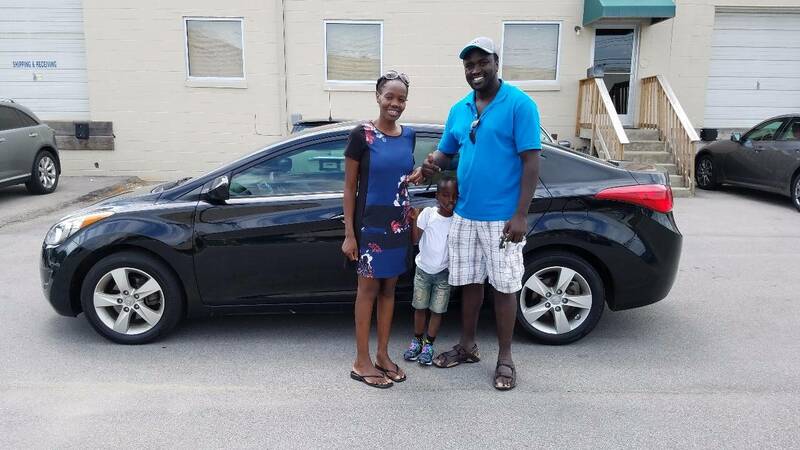 Such an easy car buying process and this is exactly what we were looking for. 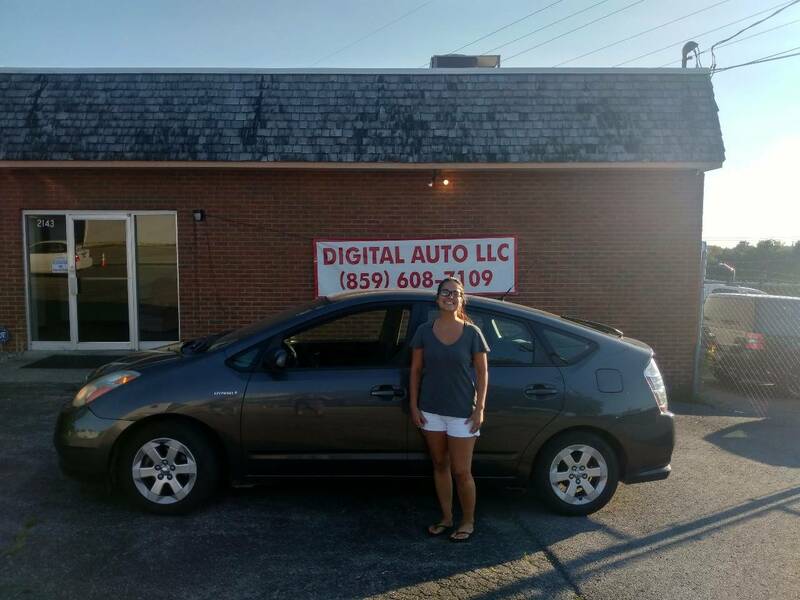 Digital Auto offered a great exprience for a second car buy. 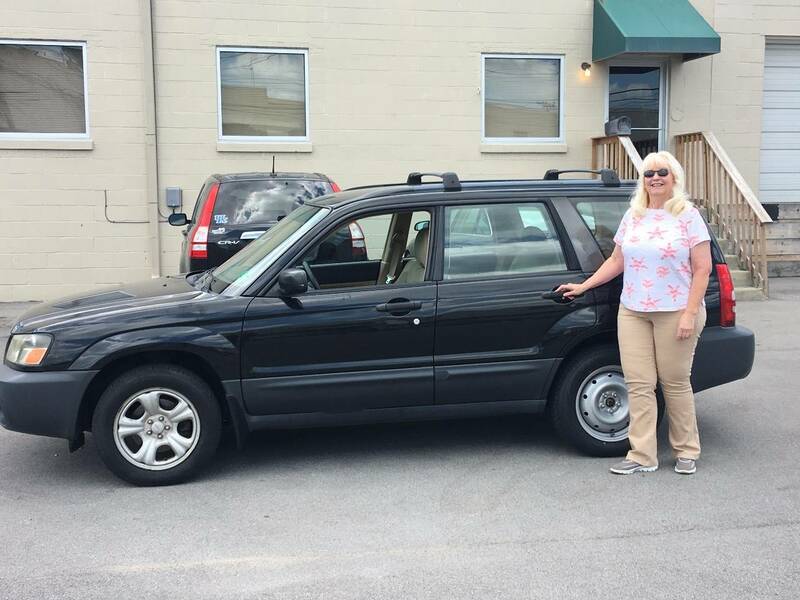 We were looking for a few months for the perfect deal for a secondary car and came across our Subaru Forester. We were treated with respect, everyone was friendly and tended to all of our questions with patience and no pressure. Mike and Jimmy are truly great. 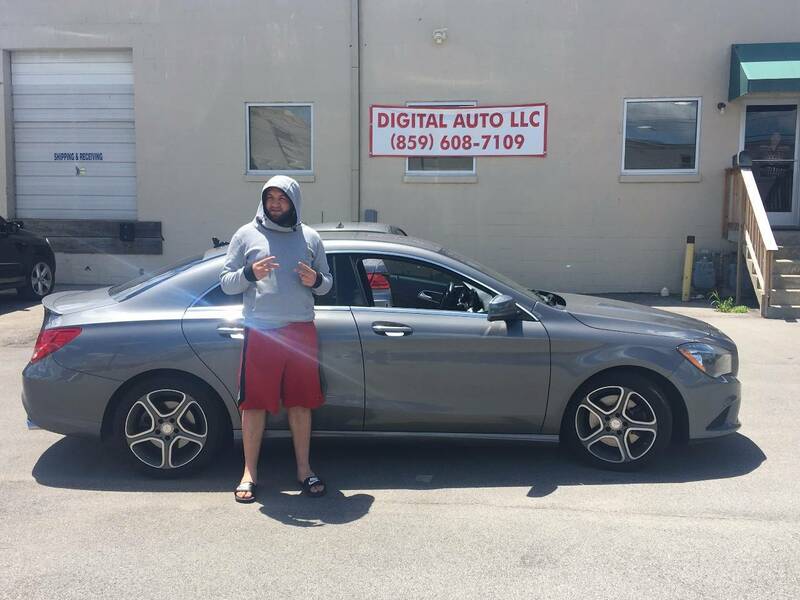 You will not be disappointed at Digital Auto! Jimmy and everyone else was really helpful and hospitable. They wen out of their way to make sure I was happy. THE TEAM WAS GREAT TO WORK WITH. THEY MADE SURE I FOUND THE VEHICLE I WANTED AT A REASONABLE PRICE. MIKE AND JIMMY ARE VERY FRIENDLY AND AT NO MADE ME FEEL ANY PRESSURE TO BUY. 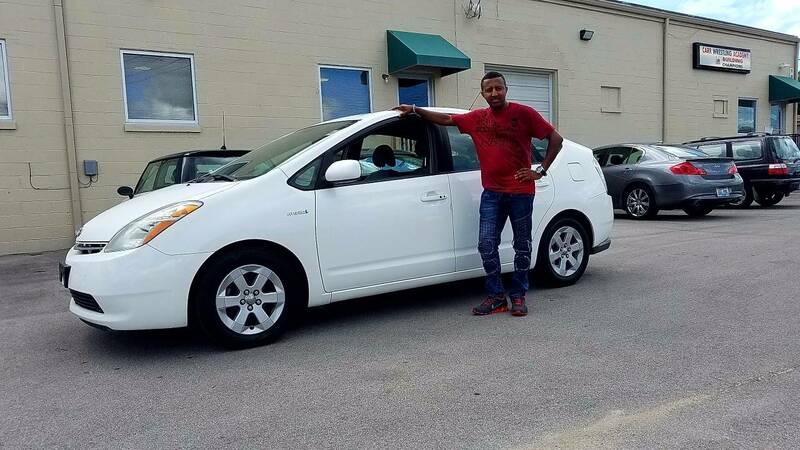 GREAT SELECTION OF VEHICLES TO CHOOSE FROM! AWESOME PRICES AND GREAT SERVICE! HASSLE FREE AND NO HIGH PRESSURE SALES PEOPLE STANDING OVER YOU TRYING TO PUSH YOU! HIGHLY RECOMMENDED!!! Good Service.Would buy agin from them. 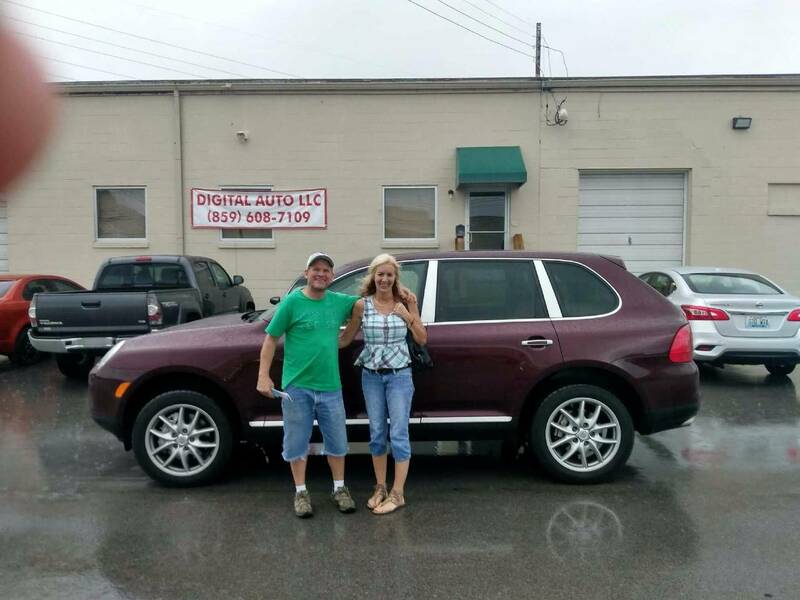 Great car buying expirence! Lyndsey was wonderful to work with and the process was a breze. 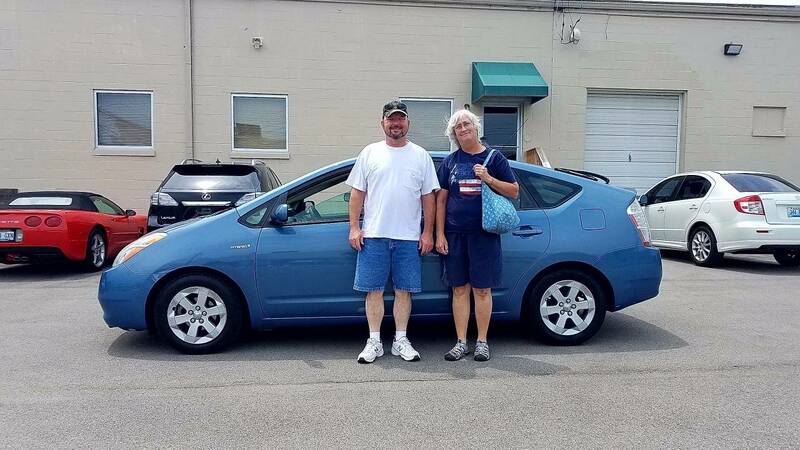 Jimmie and company make buying a car about as fun as it can be. 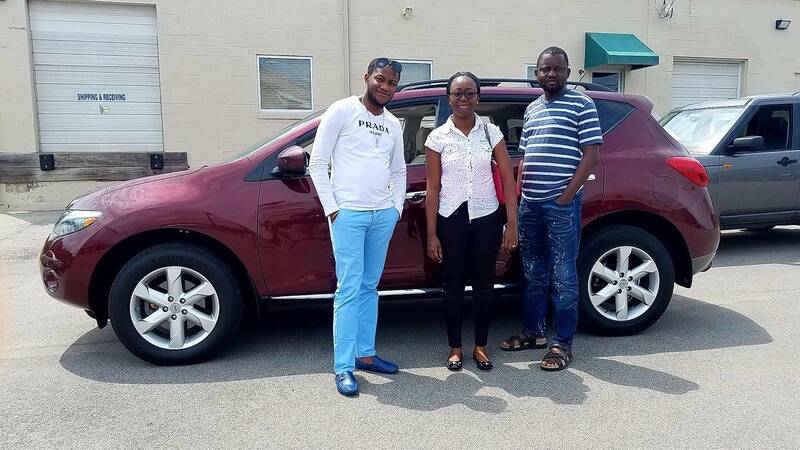 We found the car online and we thought the price was very nice, we came in, they were very honest and they explained us about the car. We took it for a ride and we loved it, so we decided to take it home. 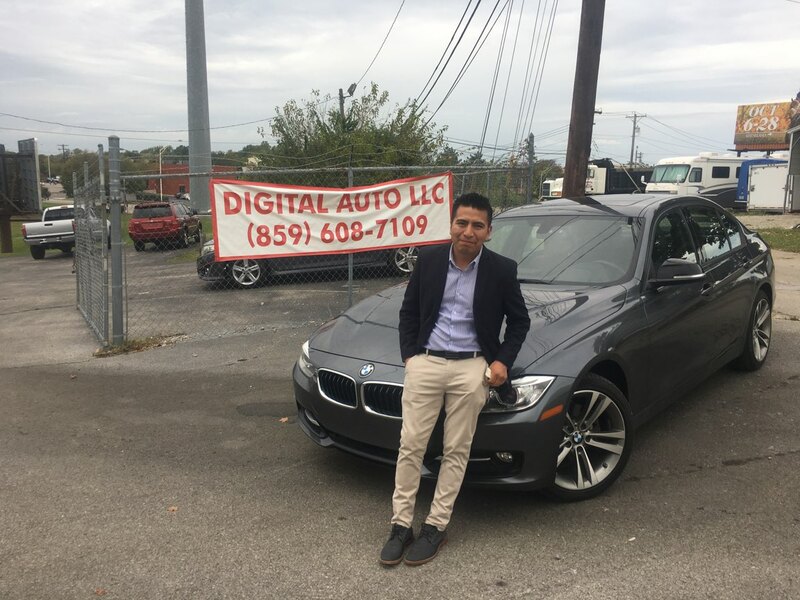 I had a great experience at Digital Auto. Jimmy and Mike were very pleasant and easy to work with. I would recomend Digital Auto to everyone! Brandon, Mike, and everyone else we dealt with were very friendly. They answered all of our questions and allowed me to look over the vehicle with no pressure. We took the vehicle on a test drive and I could literally find no concerns. 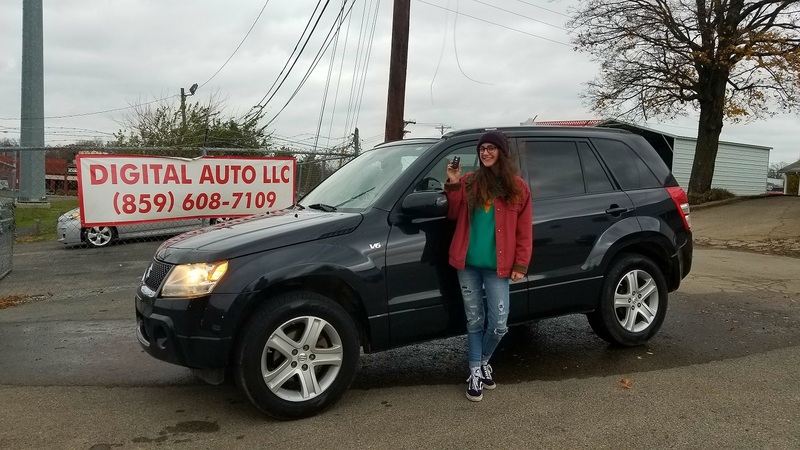 For the price, my daughter has been blessed with an extremley reliable vehicle and we are all very pleased. 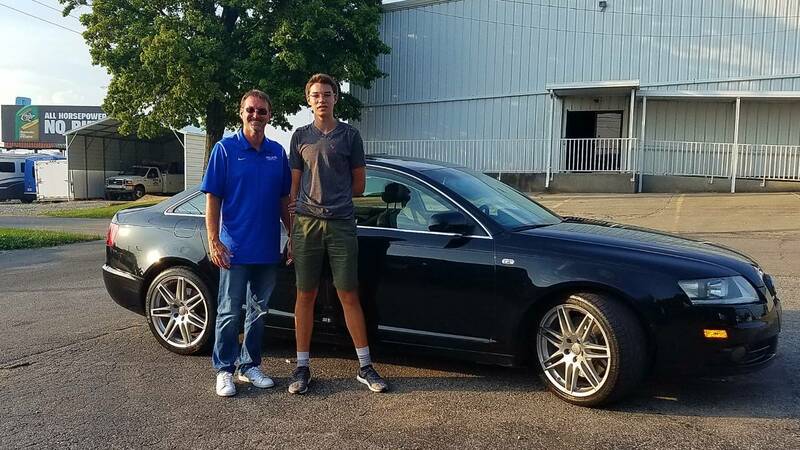 I plan to encourage my son to do business with Mike in coming months as he looks for a vehicle of his own. 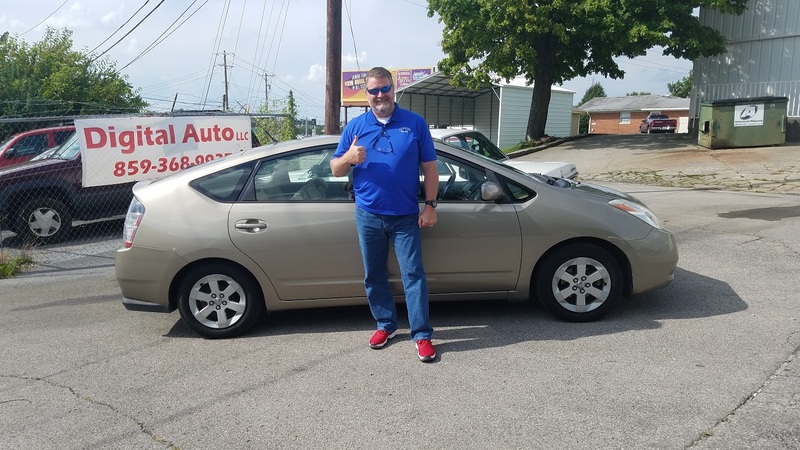 Jimmie and company gave me a great deal on my 2007 Hyundai Accent and they helped me in a very professional and friendly manor. 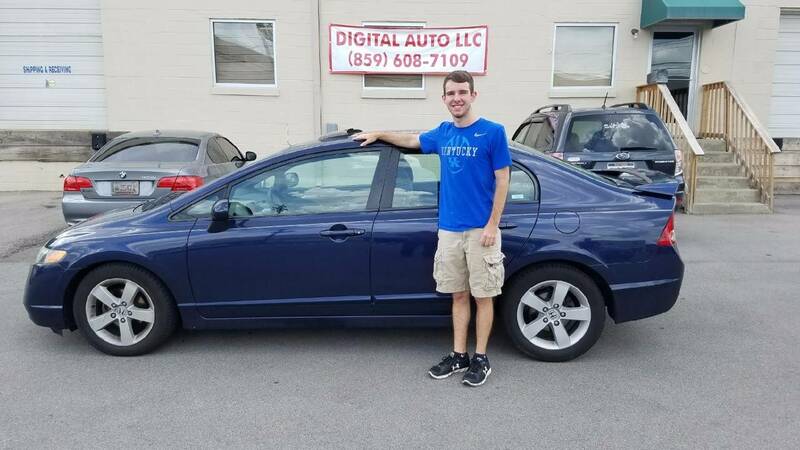 Congratulations to Seth McGowan from Tupper lake, NY on the purchase of a 2010 Nissan Altima. 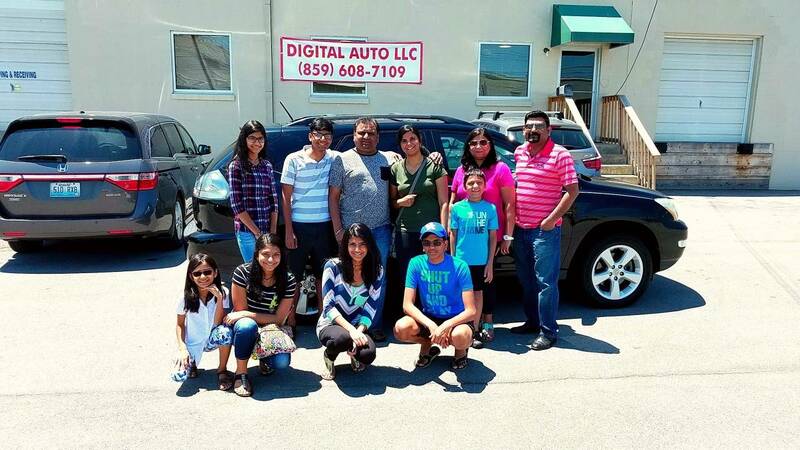 Thank you for coming all this way, and welcome to the Digital Auto Family! We appreciate your business. Mike and Fasil were awsome to work with. Very happy with our vehicle. Highly recommend them. Great People to work with! 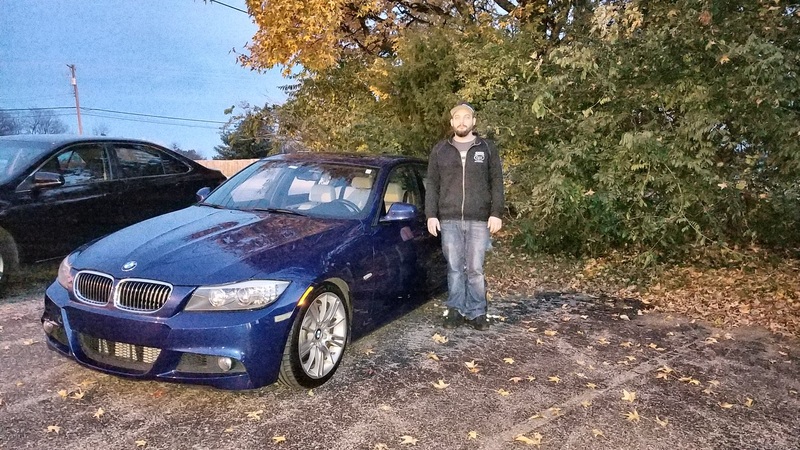 I had a great expirence and got exactly what I was looking for in a car. I love the friendly and easy going atmosphere. 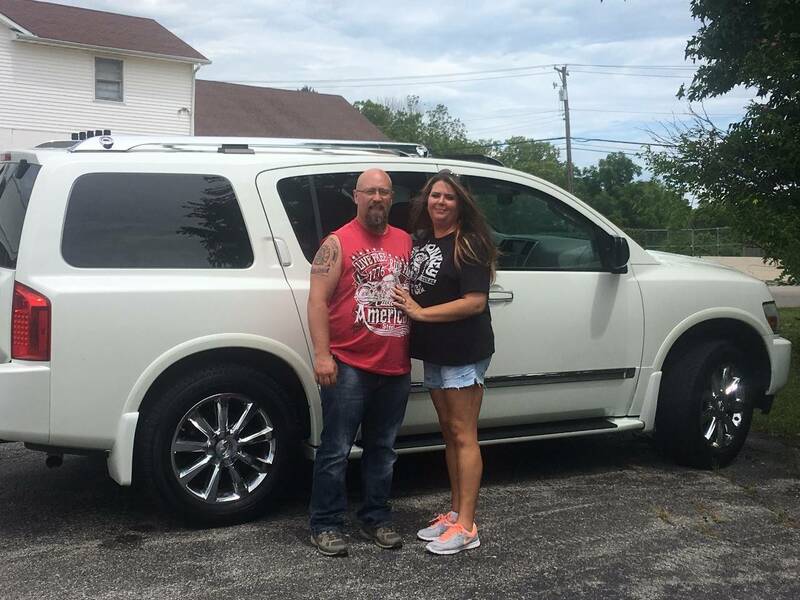 We really love our Dodge Ram and it was an easy buying process. They gave us all the room we needed to make our decision and helped us along the way. 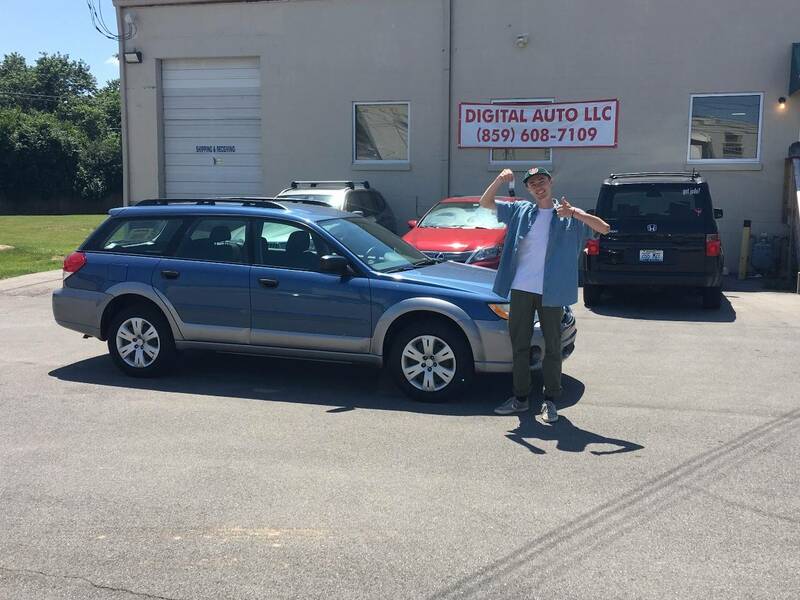 Thank you Digital Auto! GREAT PLACE TO BUY A CAR. MIKE IS REALLY NICE AND HONEST. Great Experience! I got exactly what I was looking for and at a GREAT deal! Everyone was beyong helpful and nice. Thank you guys for taking out the time out and provinding me with the best quality and care. I love my new car. 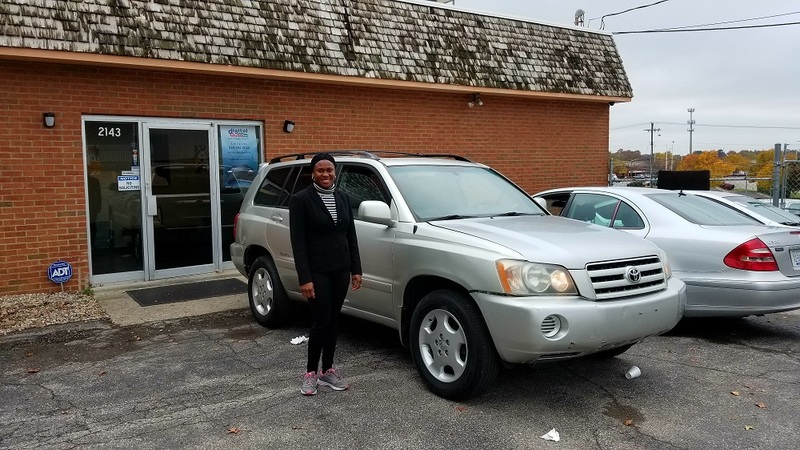 Thank you Digital Auto and Jimmie for coming through for me and taking your time to deliver my 2006 Subaru Forester on this Halloween. 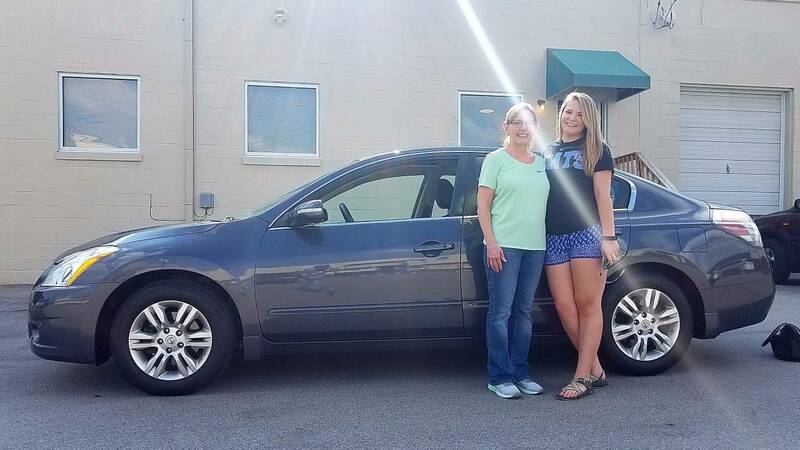 Kind and understanding, not too pushy and helped facilitate a quick purchase. All vehicles in stock are seemingly of good quality. Would recommend to anyone! They were awesome, I got a great deal on my A3. Car was solid and in great shape. Friendly people! Everyone was more than willing to help us out. 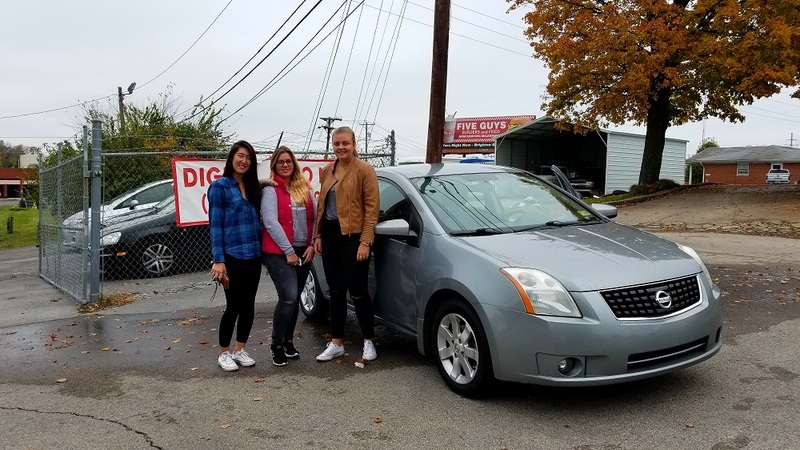 We got a great car for a great price; they really helped us out here. I reccomend it ! I called about a vehicle they had in Stock. They did not harass me or push me to buy. They actually encouraged me.to take my time and have the car inspected. I've never met a guy like the young fellow working there. Very professional and very respectful of my needs and space. When I told him I appreciated that service he gave credit to his mentor who owns the business. That shows alot of modesty and.the world needs more of these kind of car guys. Thanks D.A. Awesome people to deal with! Great experience! 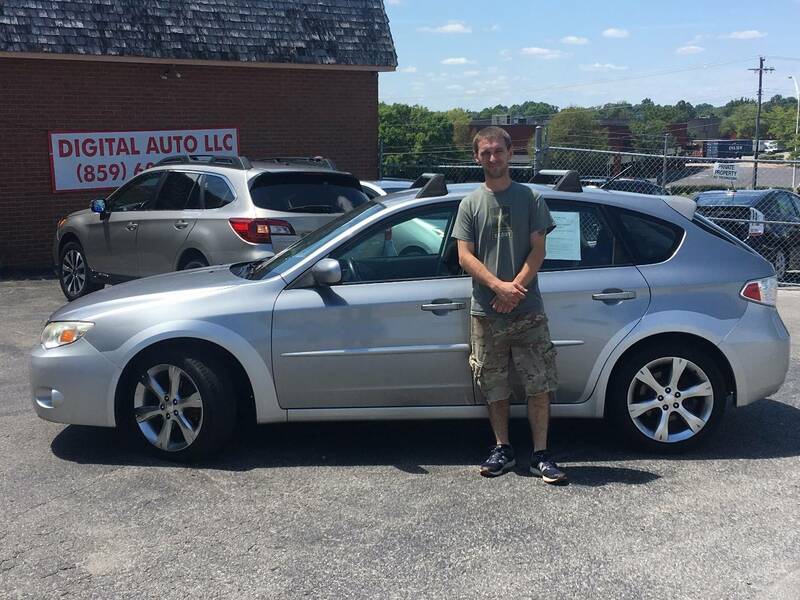 I came looking for a great affordable car with no idea what to expect and Mike was very helpful and cooperative. He helped me and worked with us. Excellent customer service. Thank you mike. 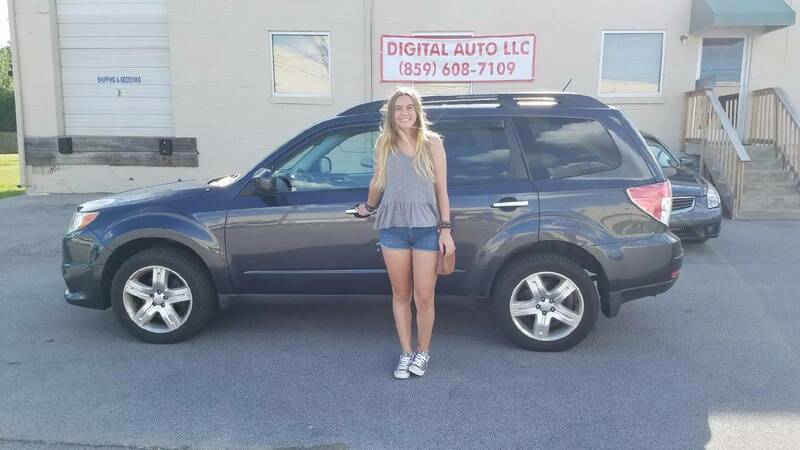 I found the car online, talked to a salesman the same day, made an appointment to come and see the car. 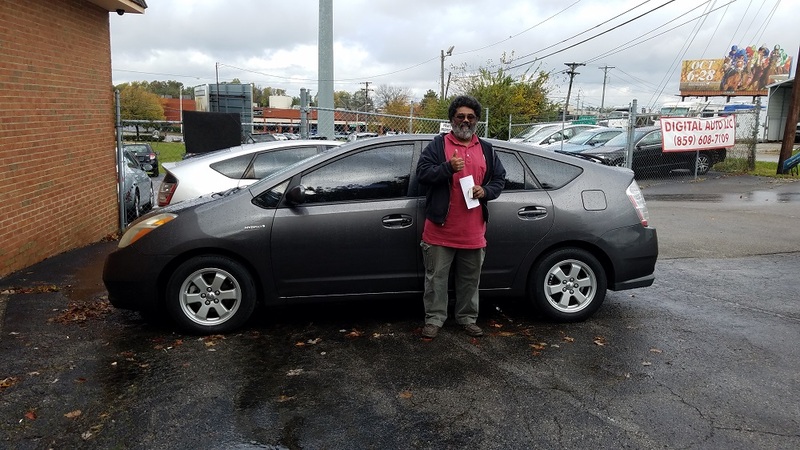 The experience was great, we made a deal the same day and I drove off a happy man. Great people to work with. Great deal, very friendly and proffessional service. Good experience. Drove car, no pressure. Good pricing. Overall great experience. Would recommend and do business with again. Thanks Mike! DIGITAL AUTO WAS GOOD TO ME!!!!! 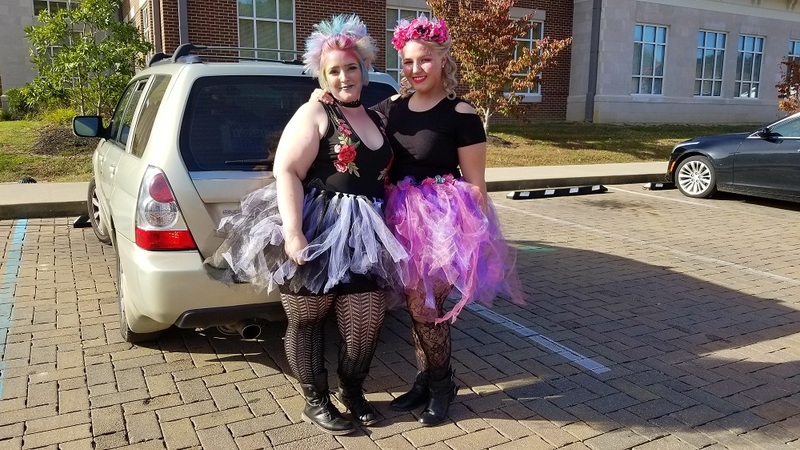 I FOUND THEM ONLINE AND TRAVELED FROM CINCINNAT, OH TO LEXINGTON, KY. I DIDNT HAVE A DEAL IN PLACE WHEN I GOT THERE, BUT I AM VERY PLEASED WITH THE RESULTS I GOT WITH THE OWNER MIKE. NO PRESSURE, NO HASSLE AND MOST OF ALL, A VERY WARM ENVIROMENT. 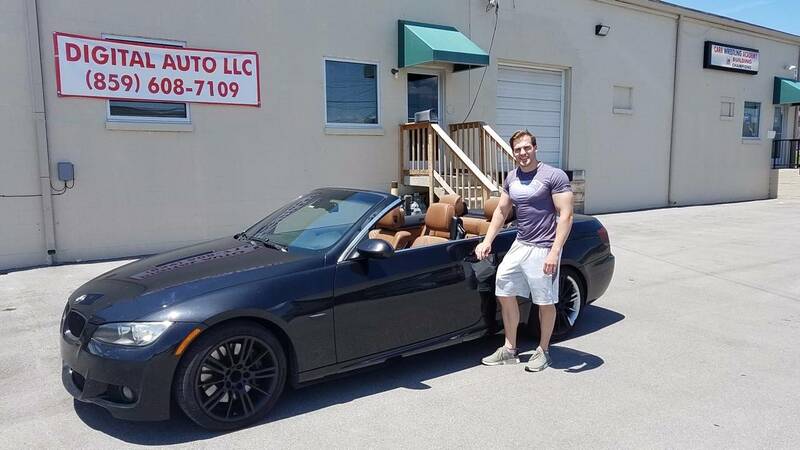 I RECOMMEND DIGITAL AUTO TO ANYONE AND EVERYONE WHO WANTS A SEAMLESS TRANSACTION AND A VERY NICE VEHICLE AT A GREAT PRICE. Fast and excellent service! We will be returning customers! 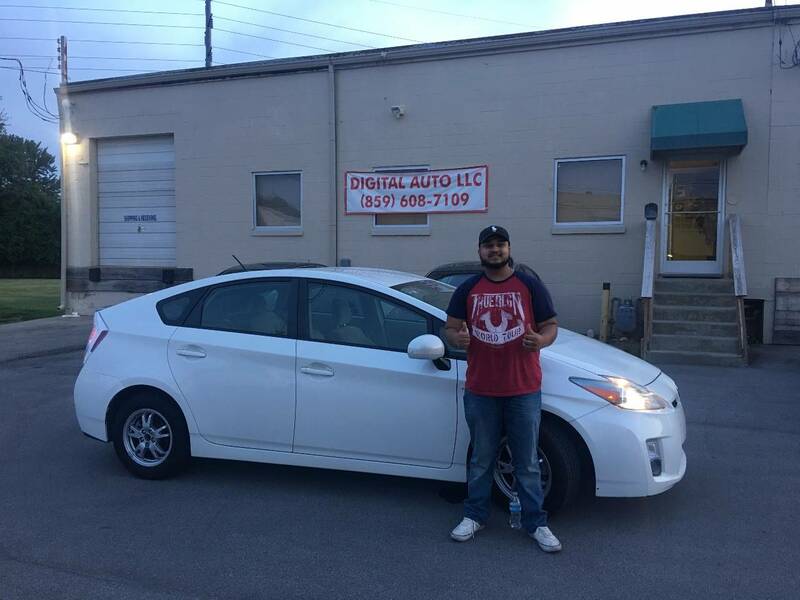 Faisal was great at helping us get the car we wanted at the right price. 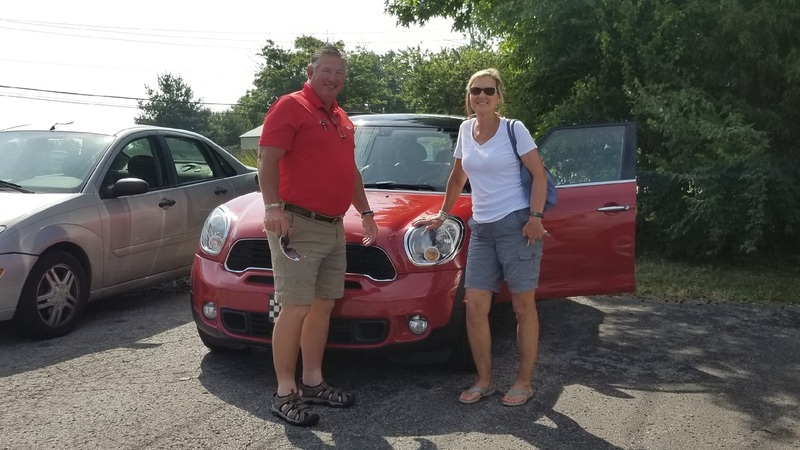 We had a wonderful experience here and we love our new car! Everyone was very helpful and this is a great place to buy from. I'm glad I found this place online. They are very reasonable in price and very friendly. 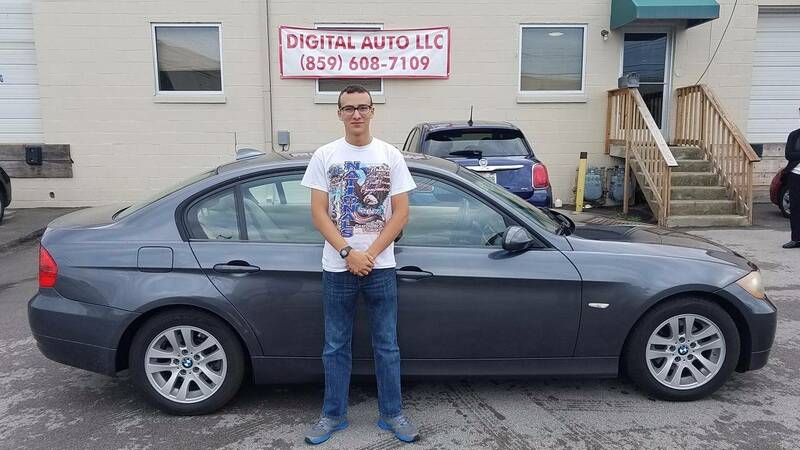 Had a great experience with Digital Auto. 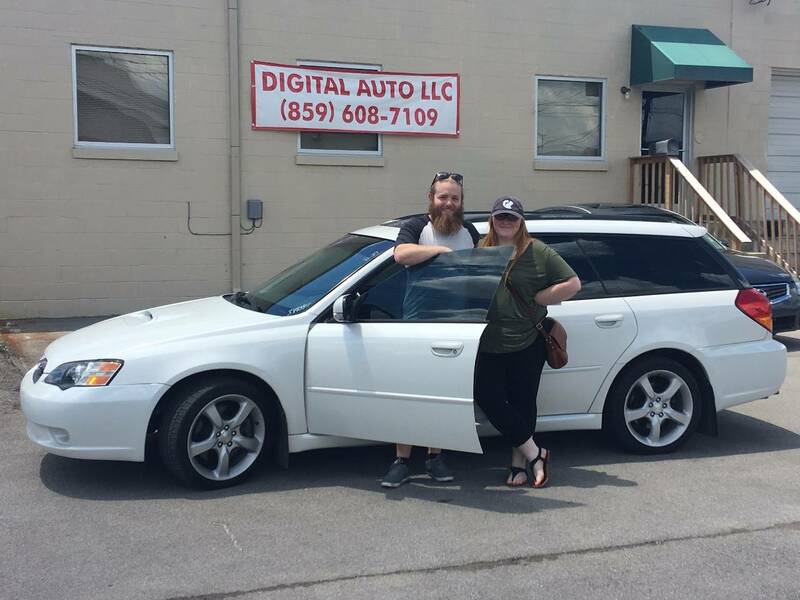 They had a car we were interested in so we came to Lexington to check it out. 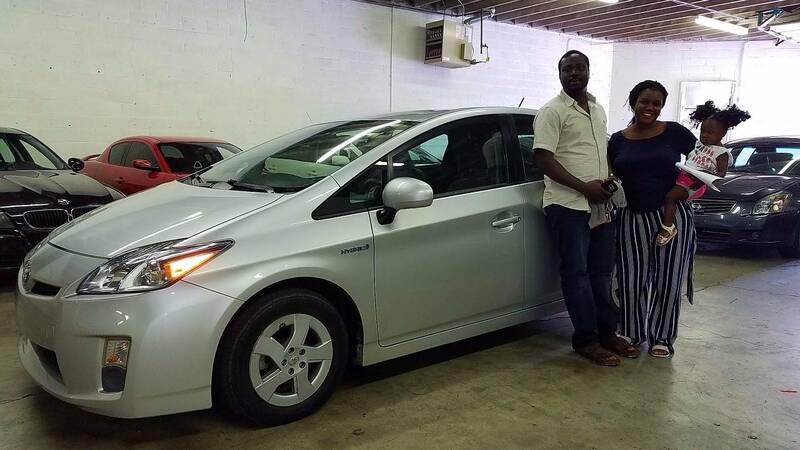 No hassle test drive, very knowledgeable staff. 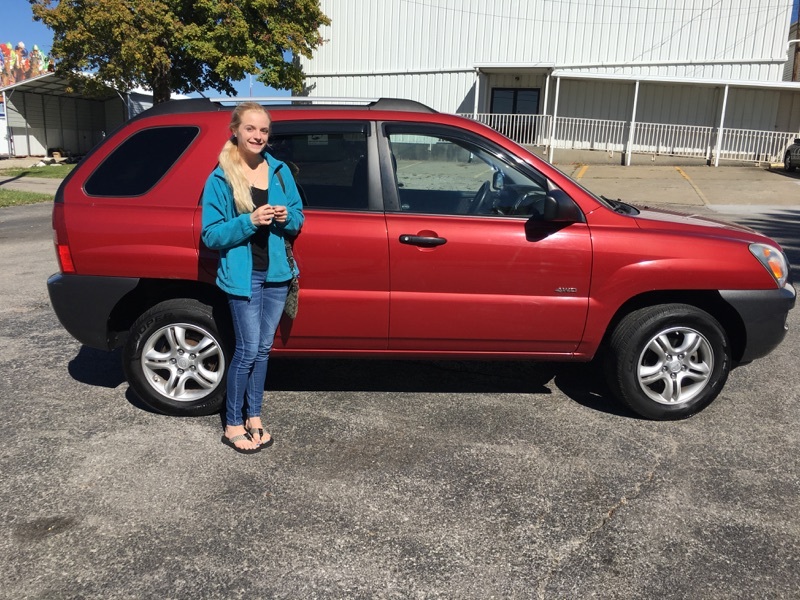 WE were able to take the car to our mechanic to have it checked out. no hard sell, very easy to work with. 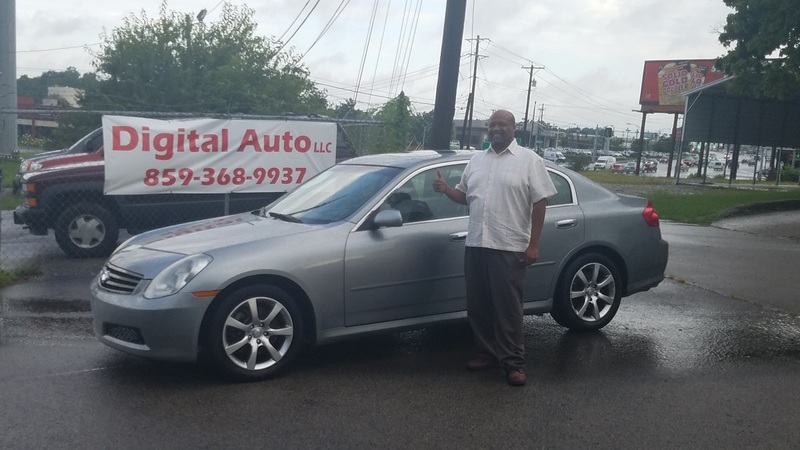 I would recommend Didgital Auto to any one looking for a car. They make the experience a pleasure. thanks Mike and staff. 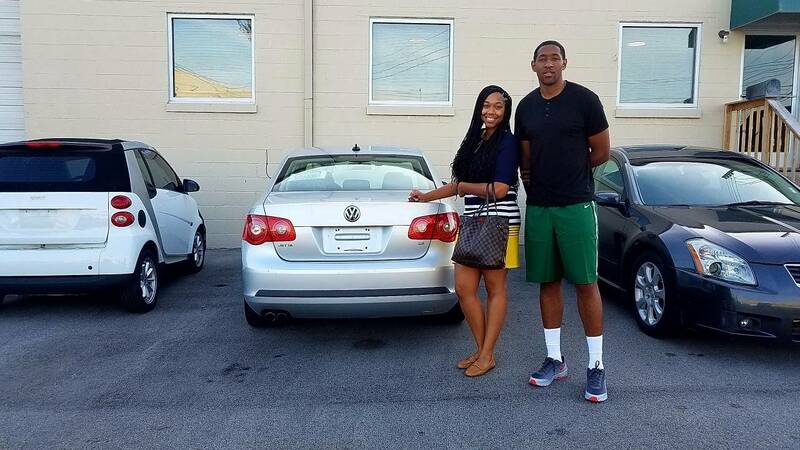 This was an easy and smooth car buying experience. Mike and everyone here was great. 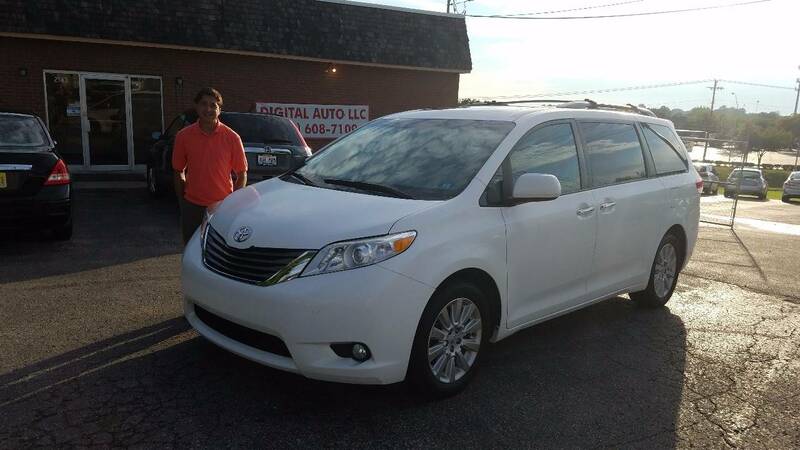 Great People , No Prussre at all , The car is Great , The price was great , cant get better than this , Thank you Faisal . Thank you Brandon . For All the help . 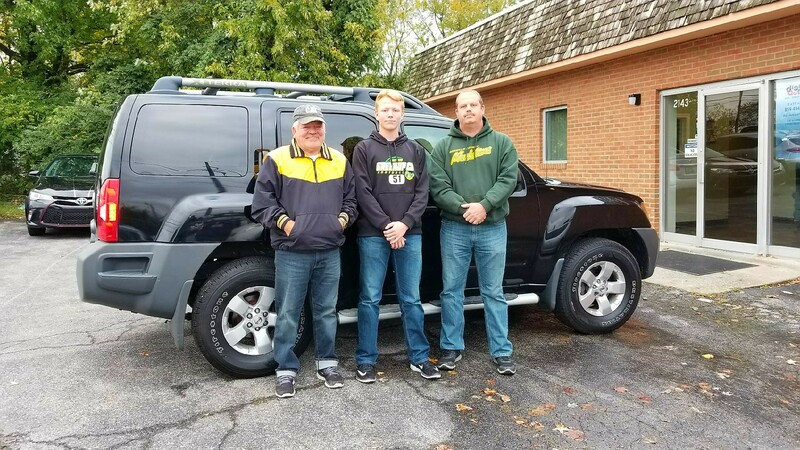 We had a great experience with everyone here and we love our 2009 Nissan Xterra! 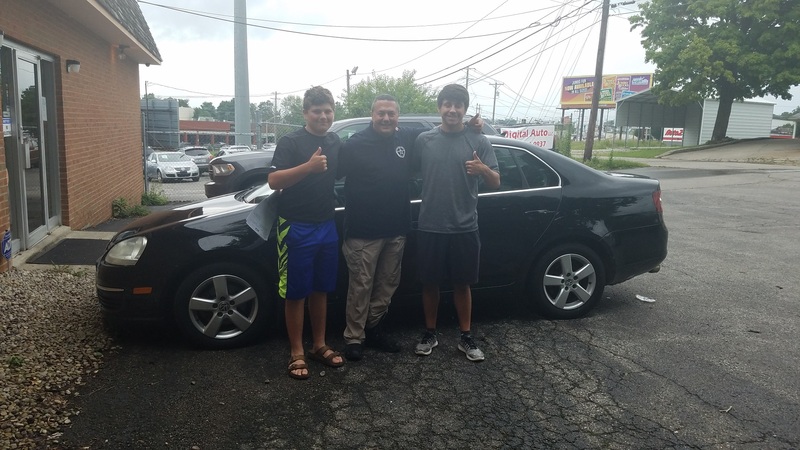 Mike and Jimmie were very helpful, responded at the first call, and the car was just as it was advertized. 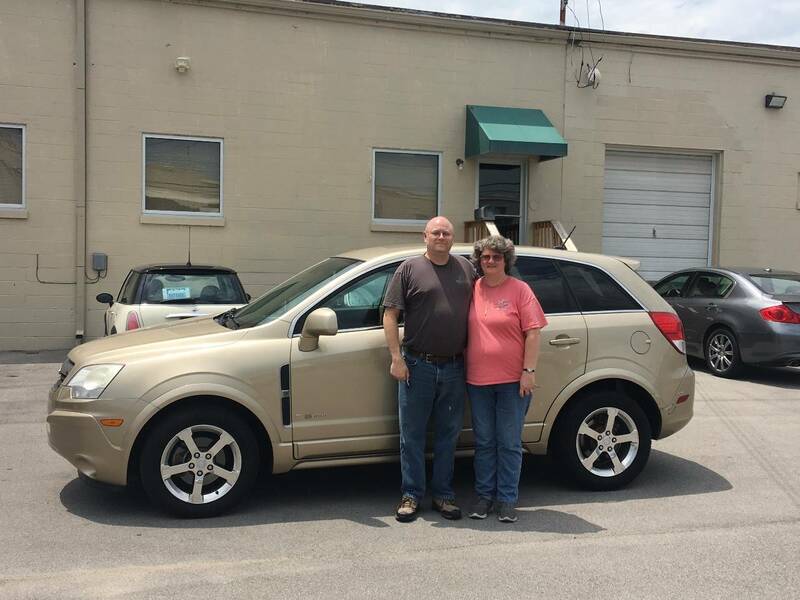 They were willing to work with us since we are from Ohio and helped with the taxes there. We were so appreciative of the friendly staff as well, it was a pleasure to be here and work with them. Thank you Jimmie for taking your time to work up a good del for us! 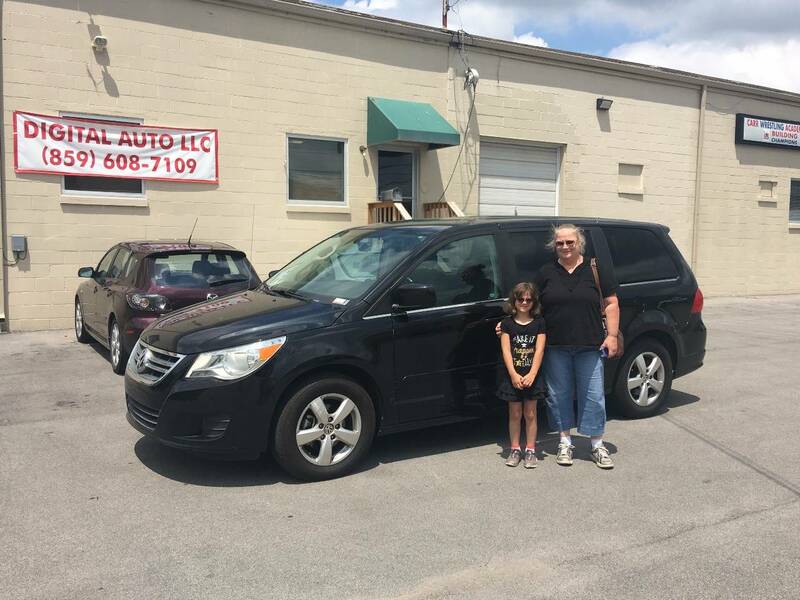 You and everybody here was great and easy to work with in buying our vehicle. 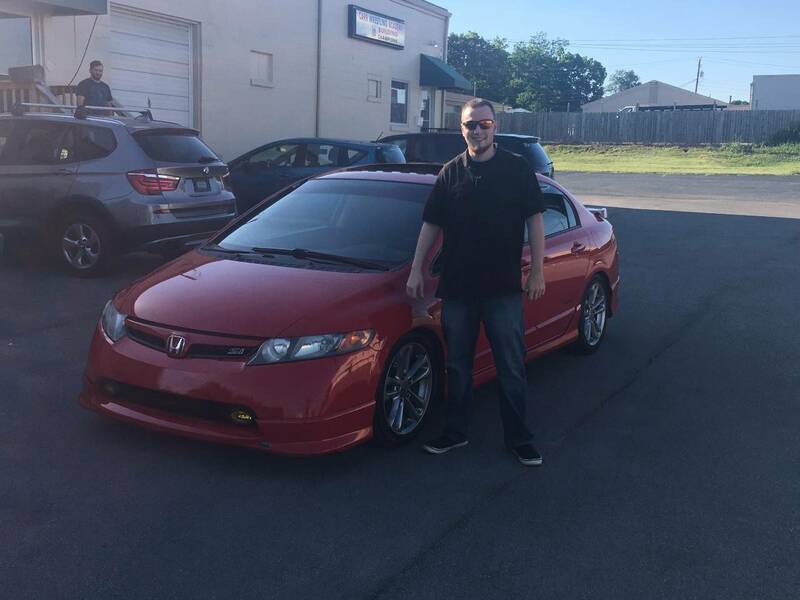 These guys are not only easy to deal with, they helped me get my dream car since I was 16 years old! Mike and everyone was great to work with. 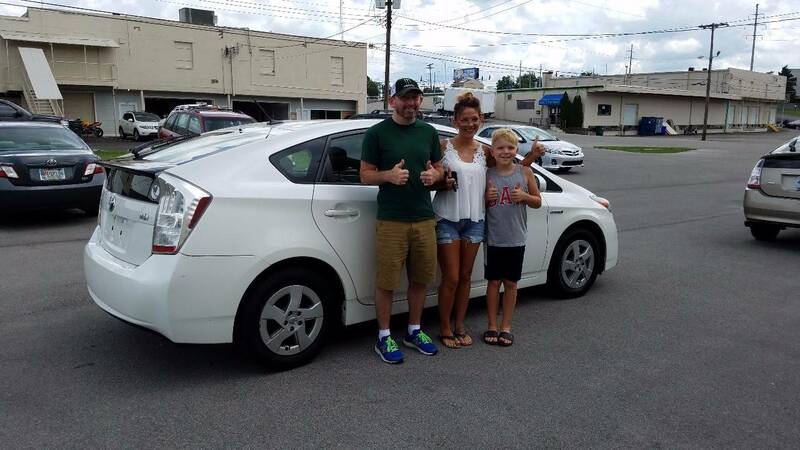 We worked out the best deal with no hassle. I found exactly what I wanted here with no hassle. Justin and AJ were great and I had a great experience. Excelllent communication and customer service. 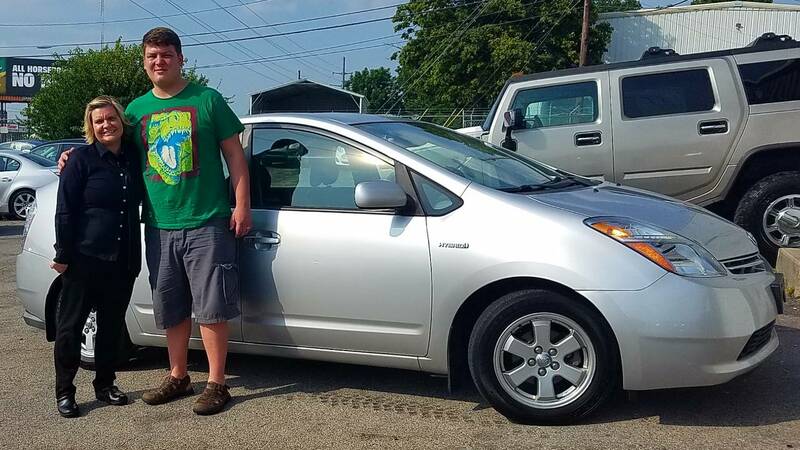 Jimmy and Mike make buying a car easy. 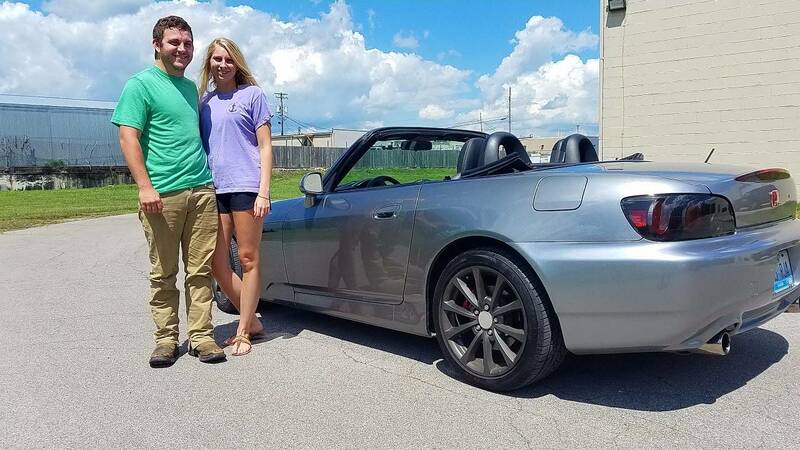 Great car, great price, great people. GREAT CARS, GREAT PRICES. THEY WERE VERY PATIENT WITH US, THIRD TIME WAS THE CHARM. 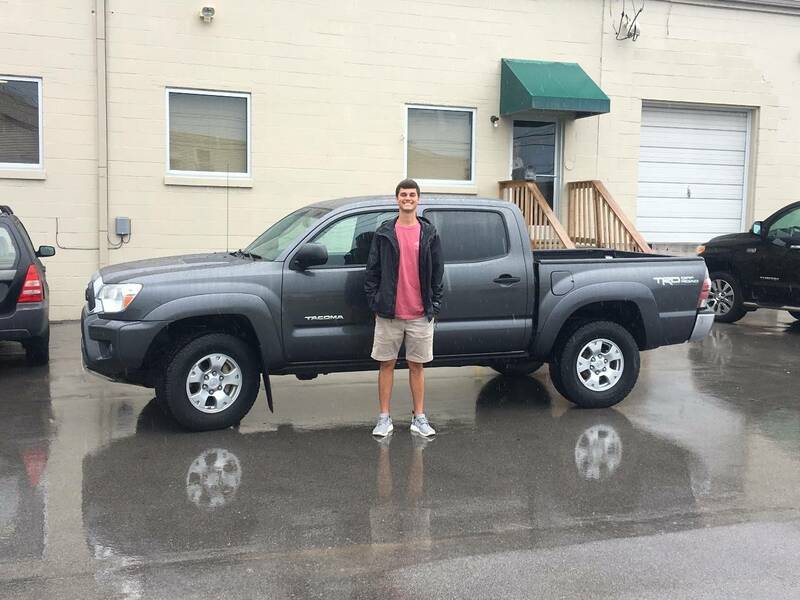 THIS WAS THE BEST EXPERIENCE I HAVE EVER HAD BUYING A VEHICLE! AWESOME PLACE AND VERY INTELLIGENT, KNOWLEDGEABLE CAR GUYS!!! 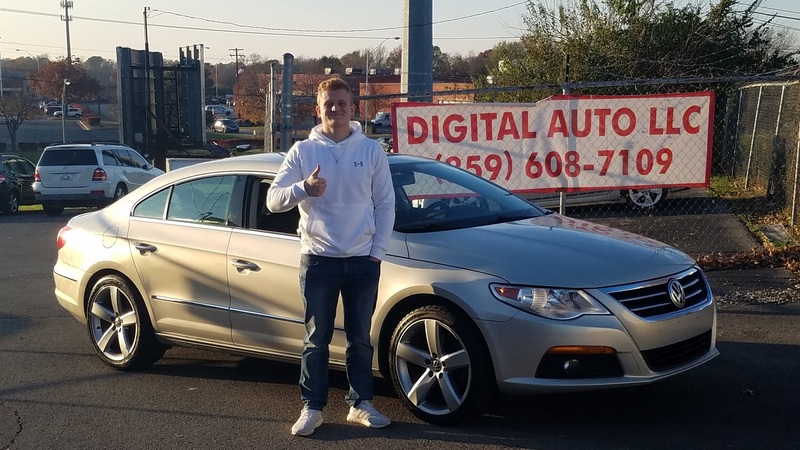 Great first car buying experience! The team was very nice and easy to work with and made sure to accommodate our needs! We will come back again! Thanks Mike and Jimmy!! VERY HONEST UPFRONT PEOPLE! 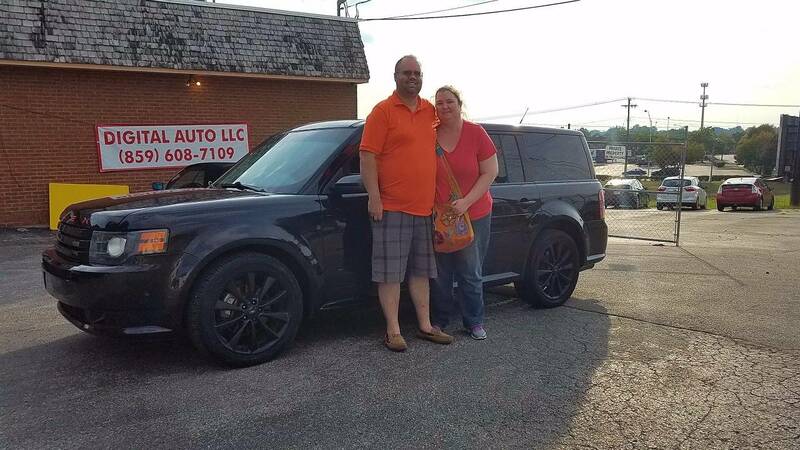 BOUGHT LAND ROVER FOR MY DAUGHTER AND I WILL BE BACK HERE IN A FEW MONTHS TO BUY ONE FOR MYSLEF. 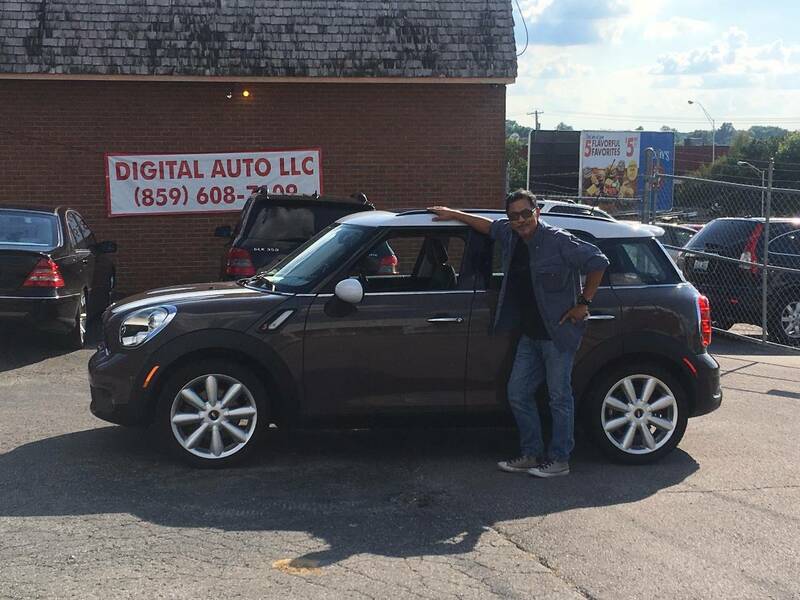 This Mini is exactly what we were looking for and we found the right deal here at Digital Auto. Jimmie and Mike were very kind and easy to deal with. 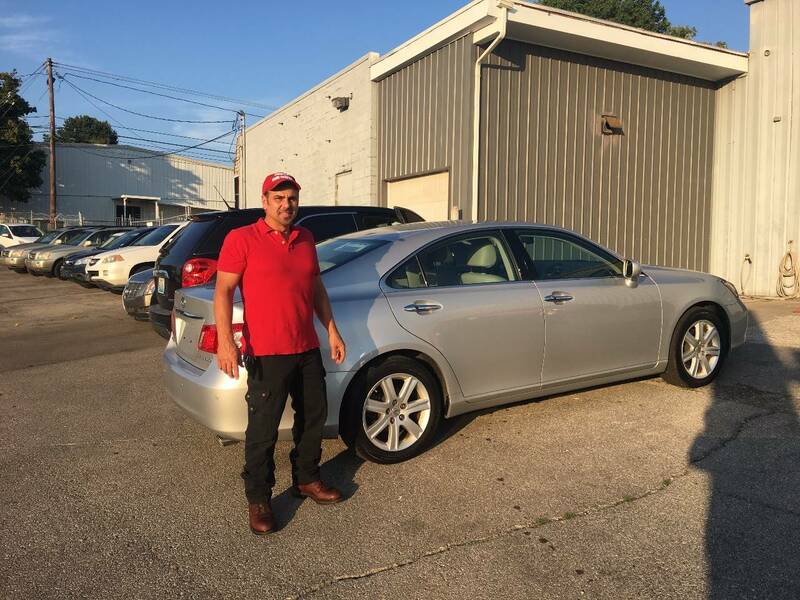 Working with Jimmie and AJ was a very plessant buying experince and I was happy with the service. Would recommend Digital Auto. 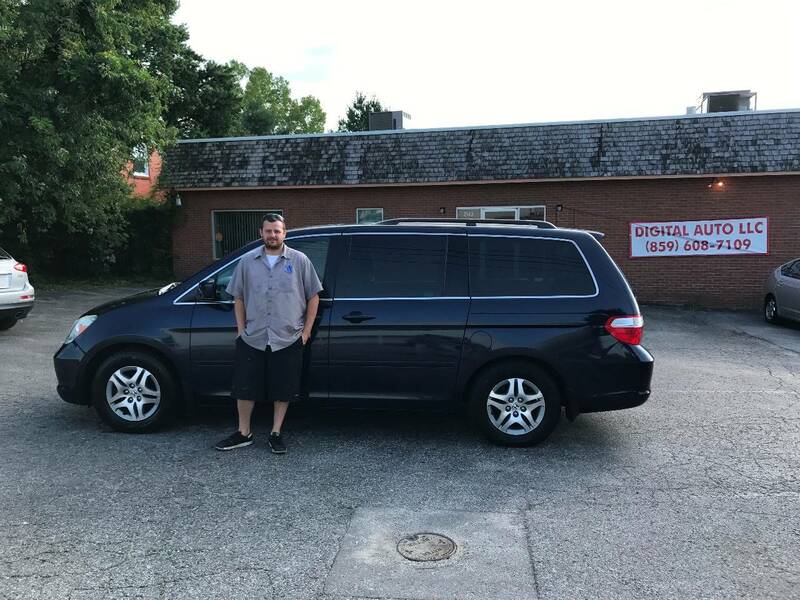 Great experience buying from Mike. 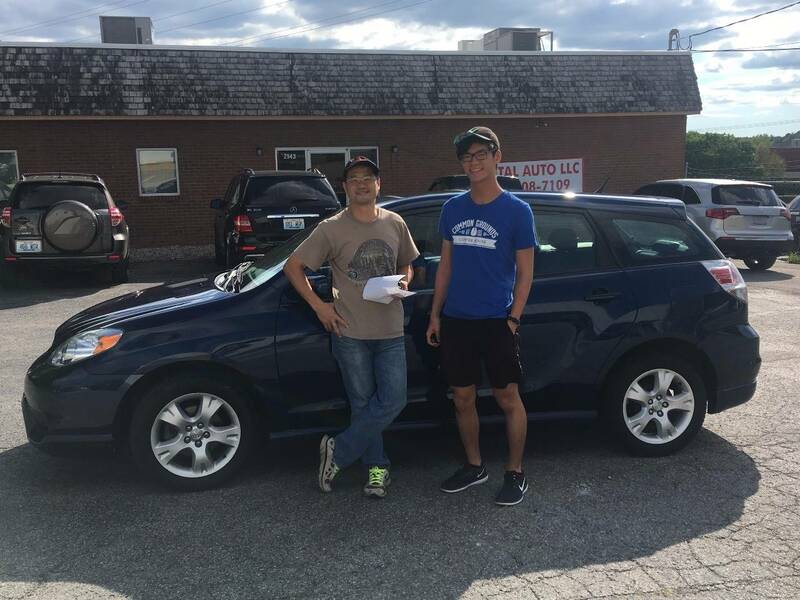 Quick and very to the point, it made the transaction on the Toyota Matrix fairly simple. Quality of the car was pretty decent; it was worth the price. Thank you! Quick and very friendly service. 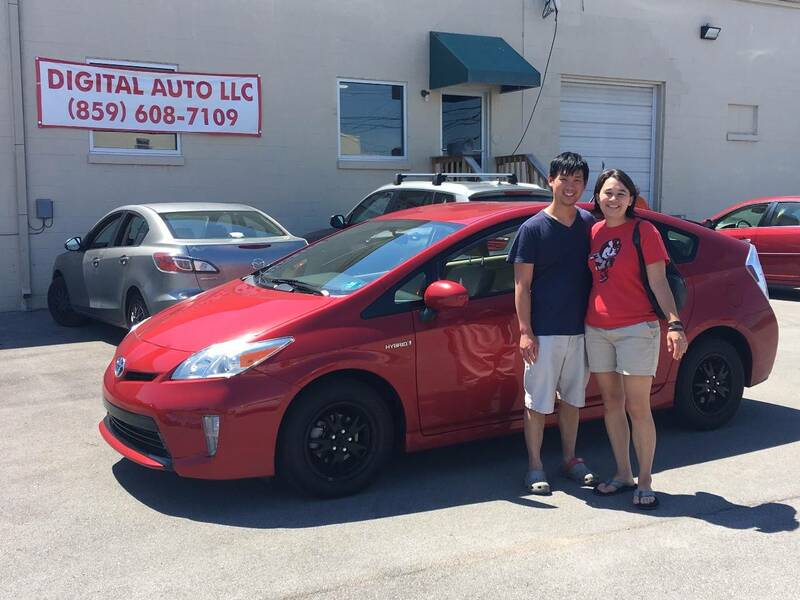 We were not rushed and felt very comfortable negotiating and talking to dealer about any possible issues and pricing. We would definitely recommend this place out to family and friends. Excellent deal, and easy to work with. 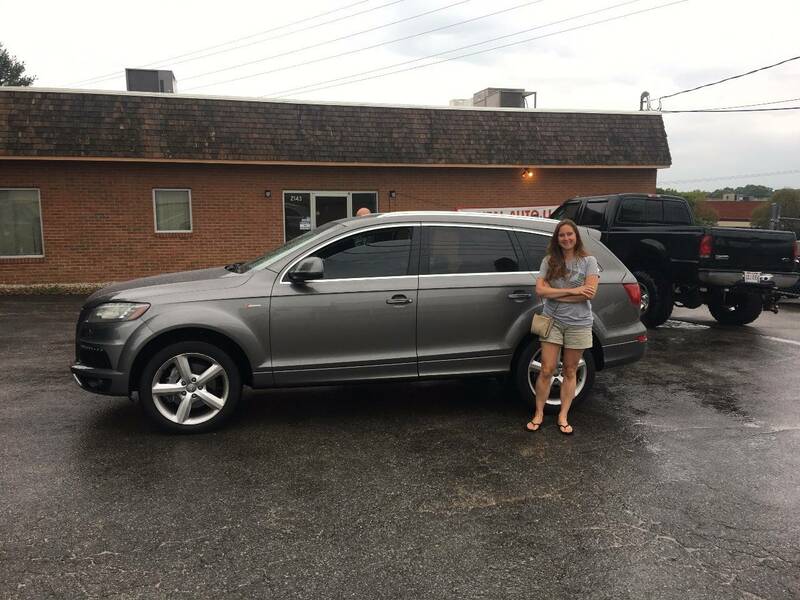 Car was road ready and was clean and detailed properly. Great group of guys and will do business with again. 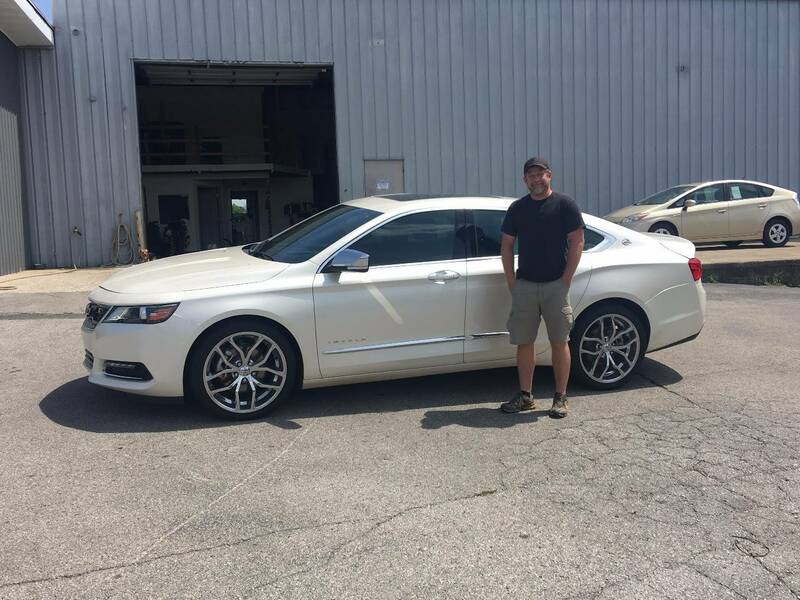 Justin gave us a great car buying experience to say the least. Very professional and easy to deal with!